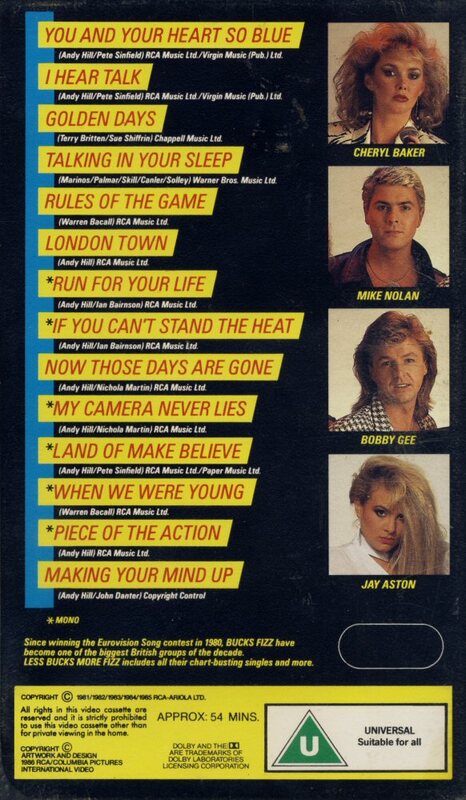 A 54-minute-video compilation released in 1986 featured 14 greatest hits recorded with Jay Aston between 1981 and 1985. 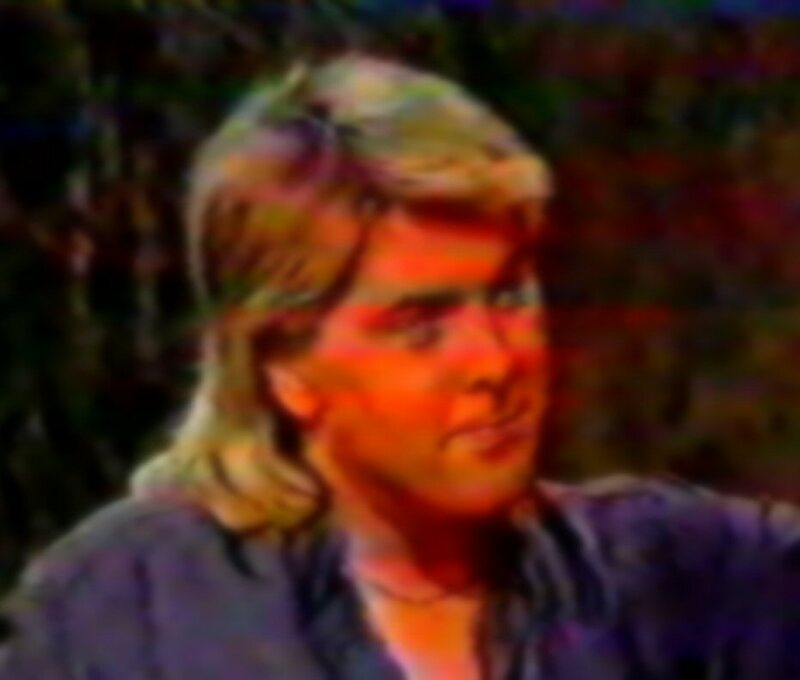 The video was entitled simply "Greatest Hits". 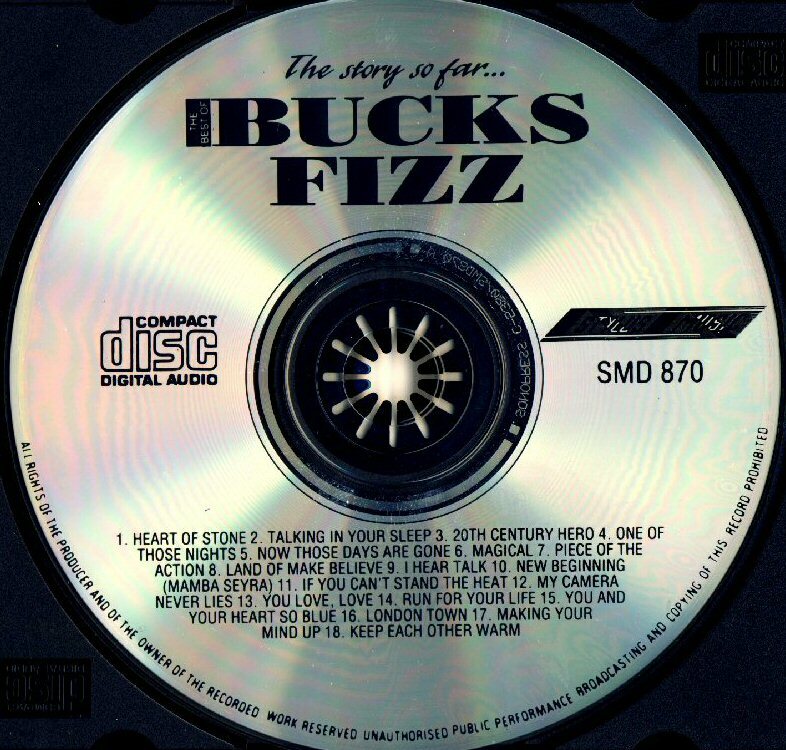 The video for "Rules of the Game" is only available on this release as it was omitted on the DVD release of Bucks Fizz' greatest hits in 2007. 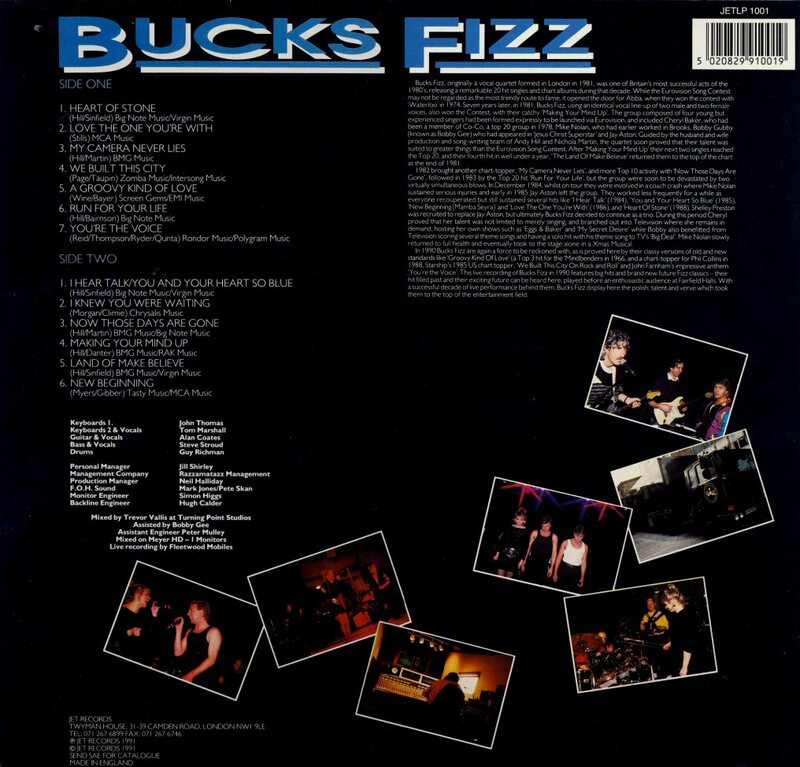 A low-budget compilation featuring songs recorded by Bucks Fizz with Jay Aston was released by EMI in the series "Music for pleasure" in 1986. 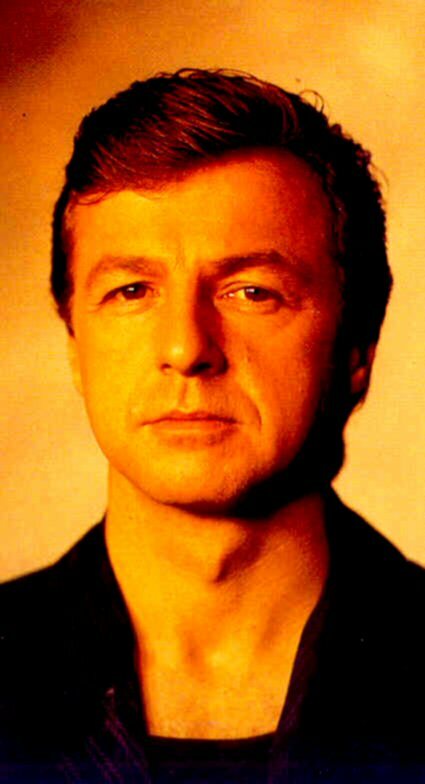 The album contained 10 tracks - mostly no hit singles as Thief in The Night, I Do It All For You, Breaking Me Up and others. The album was released as LP and MC. 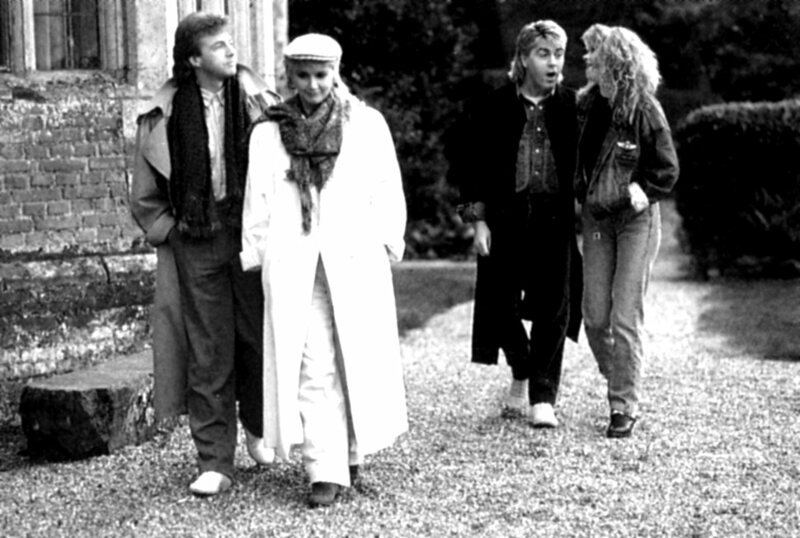 "The Land of Make Believe" b/w "Making Your Mind Up" were re-released on the 1986 single in the series "Old Gold"
In the spring and summer 1986 the group recorded their new album in the Surrey countryside where their manager Nicola Martin had her home and recording studio. 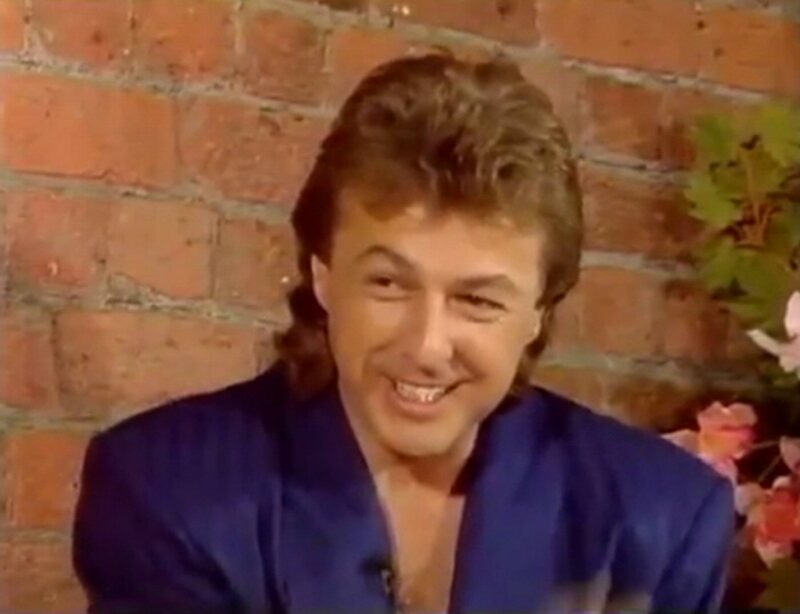 Jay caught on the picture some day in 1986 in London. 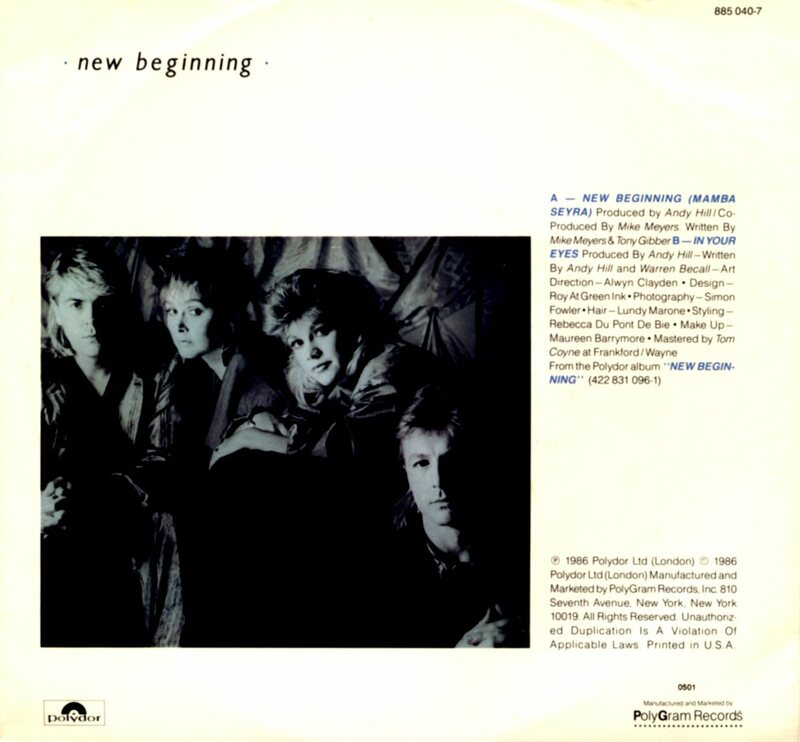 "New Beginning" was released in May 1986 and was seen as a comeback single as it was their first release in eight months and featured new member Shelley Preston who had replaced Jay Aston a year earlier. 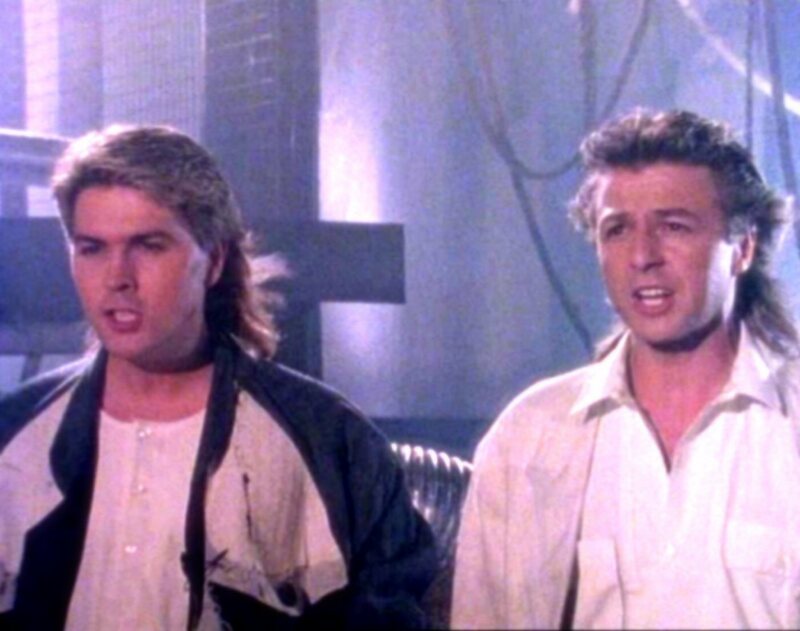 It was also their first release on new record label, Polydor after their five-year contract with RCA had finished. 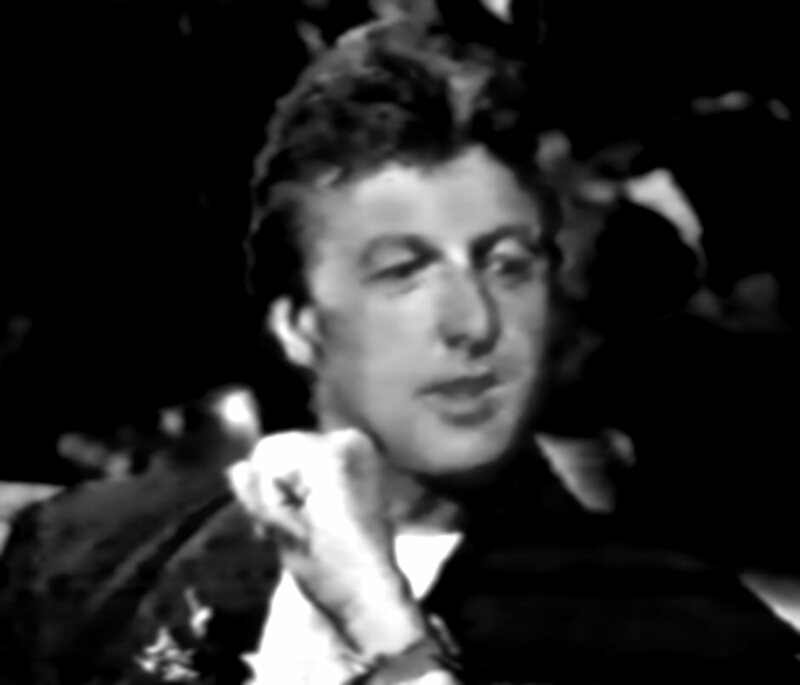 The song was notable for its full and lavish production and multi-layered vocal work and received much praise from critics as well as becoming very popular on radio. 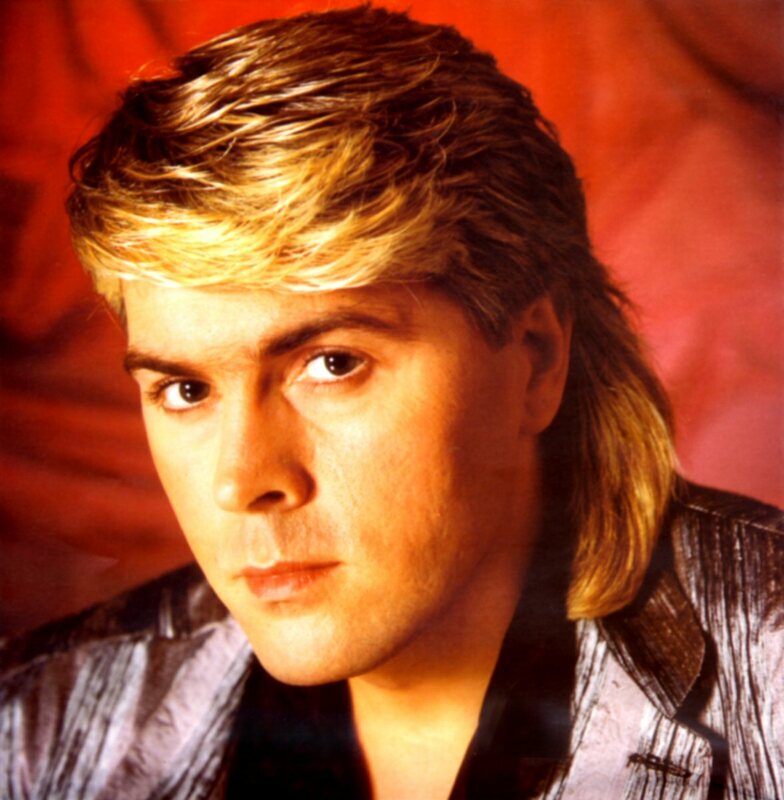 The song became a big hit in the Summer of 1986 and reached the top ten in the UK, becoming a No.8 hit. This was the group's biggest hit in four years. 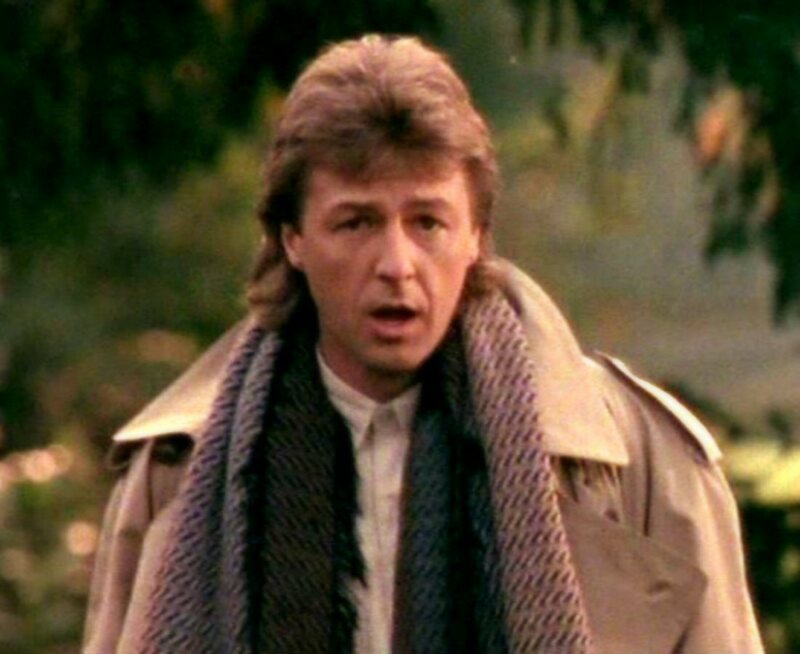 The song was written by Mike Myers and Tony Gibber and was produced by Myers along with the group's regular producer Andy Hill. 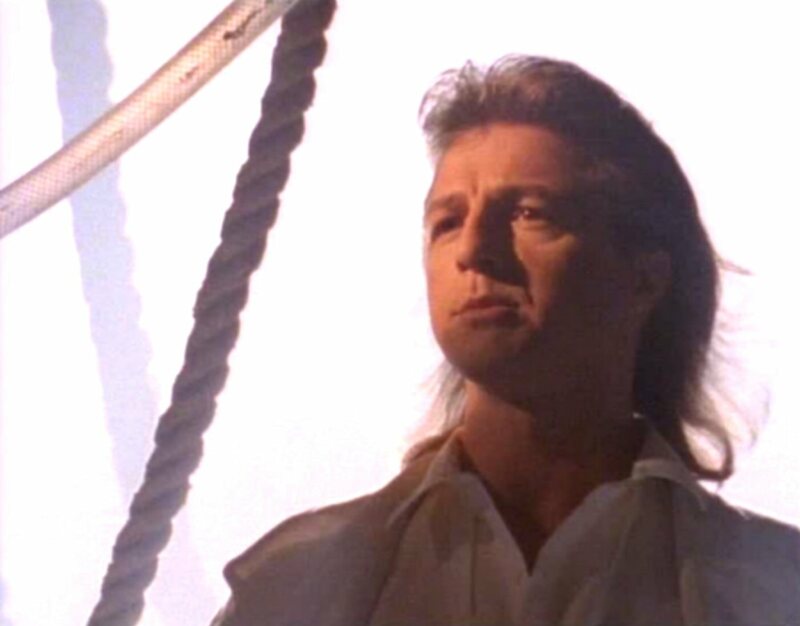 According to the group, the recording of the song took an unusually long time due to the vocal tracks. As well as the group recording their vocals repeatedly, there was also a children's choir and gospel choir used on the track. The musicians in the studio also were used on distant back-up vocals. 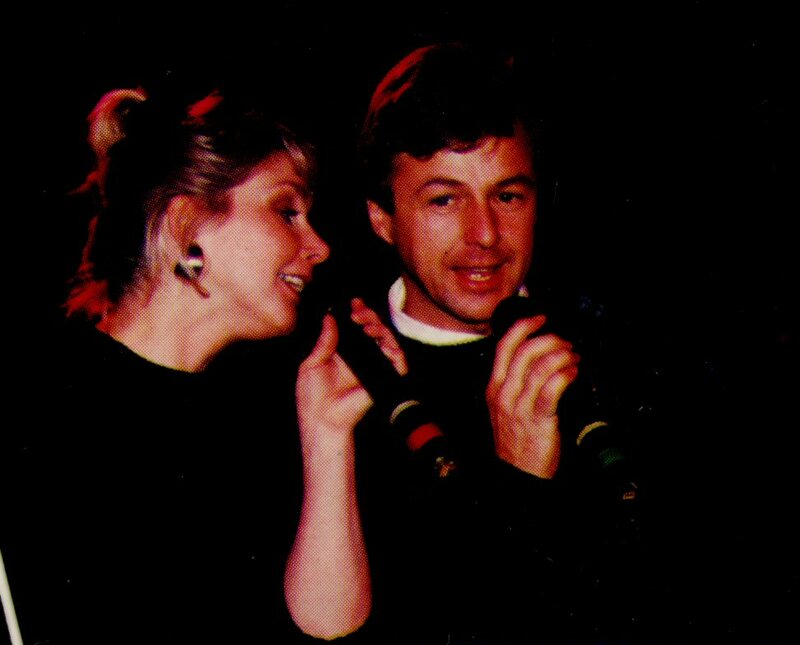 Cheryl Baker remembers one version where Hill instructed them to deliberately sing out of tune, which she found difficult. 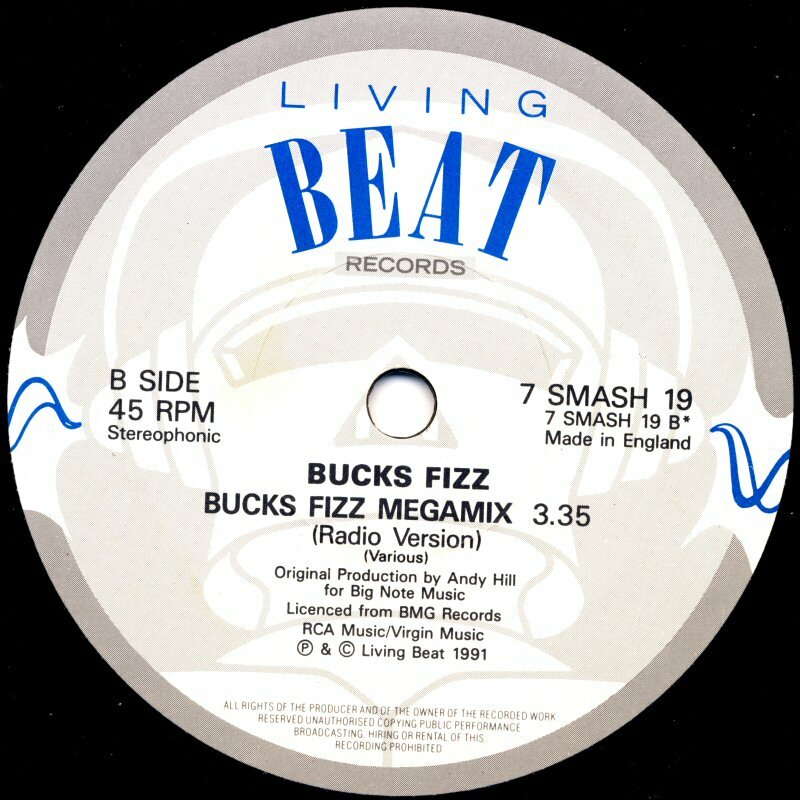 The original mix of the song was completed in February 1986. 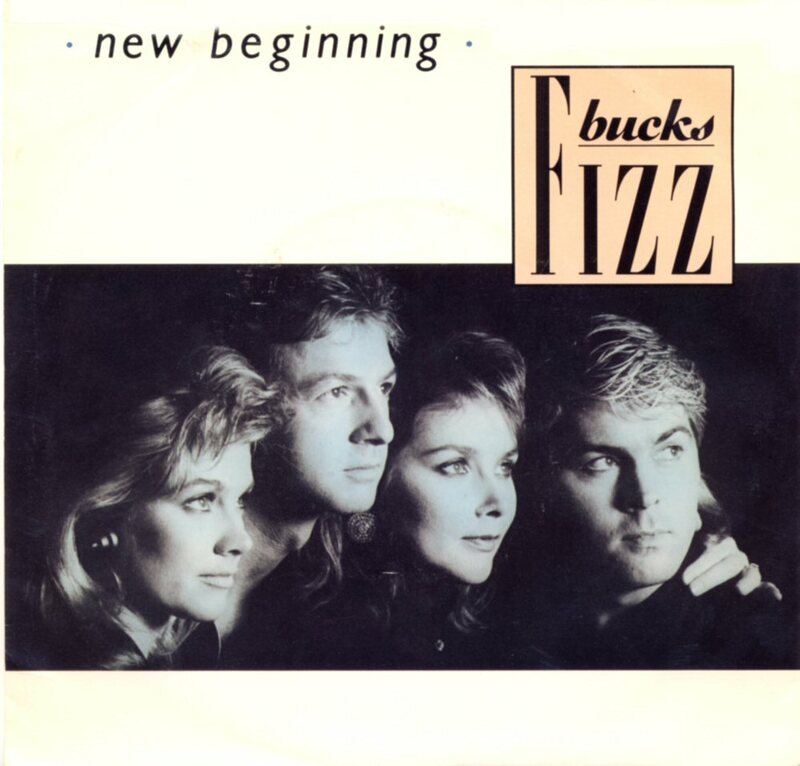 "New Beginning" b/w "In Your Eyes" entered the British chart on June 7th, 1986 and stayed there for 10 weeks reaching #8. 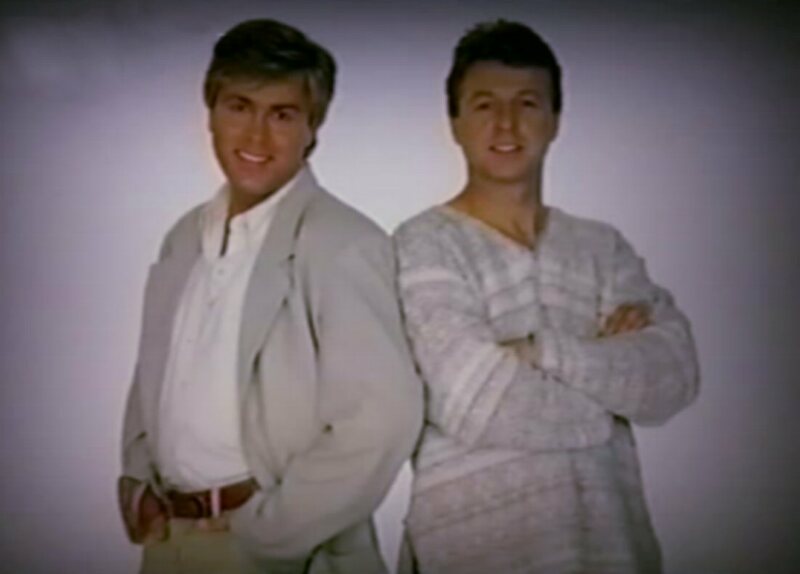 The single was promoted by the video and several TV performances in important shows as "Wogan" and "Top of the Pops". 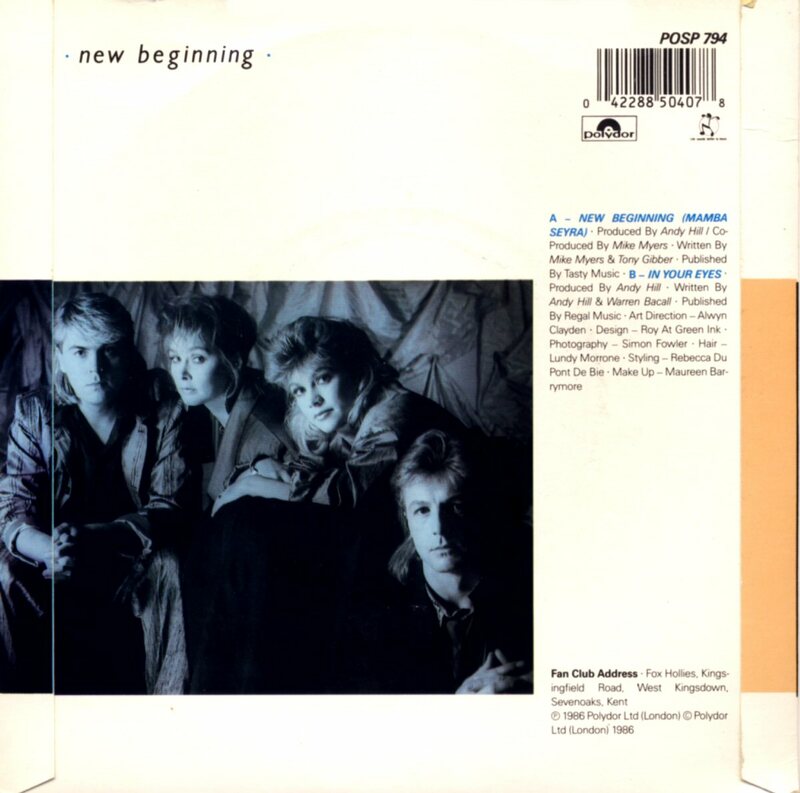 "New Beginning" was released as 7", a picture disc and 12" (two versions). 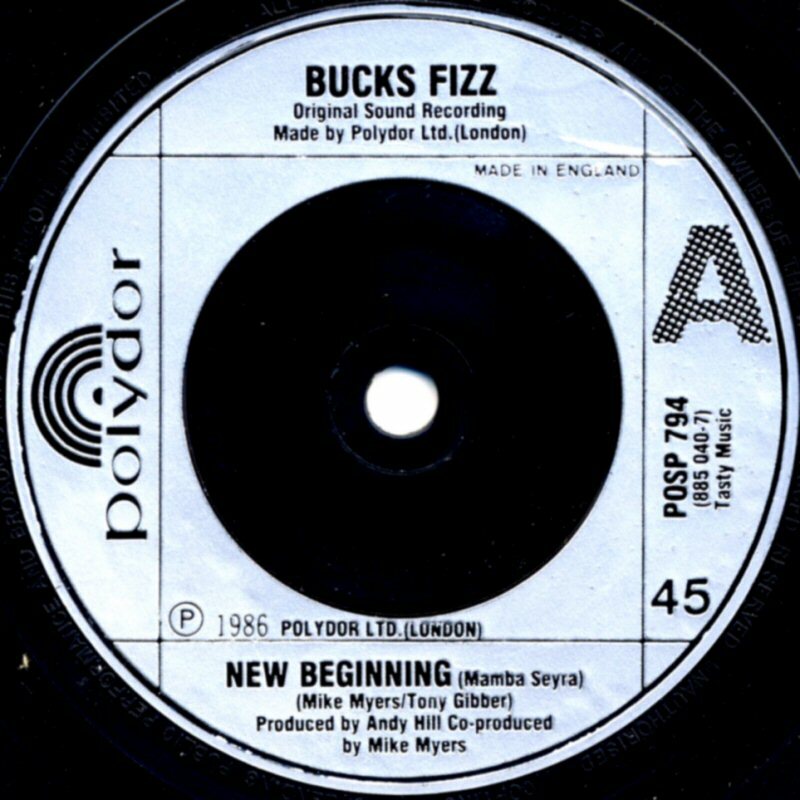 The single "New Beginning"/"In Your Eyes" was released by Polydor even in USA as 7" and 12". 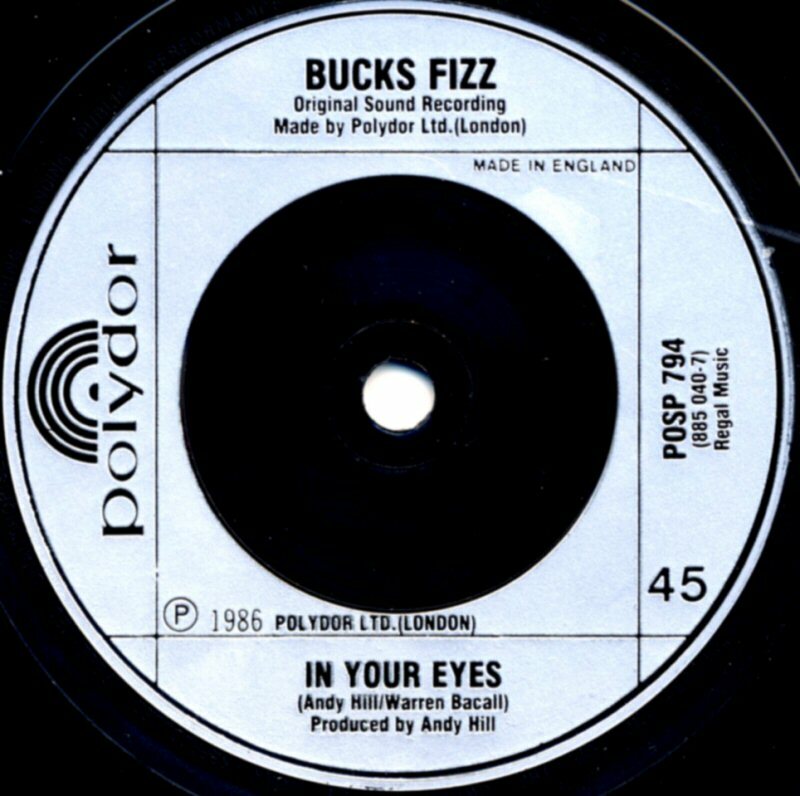 Several different 12" singles were released in the UK, West Germany and USA. 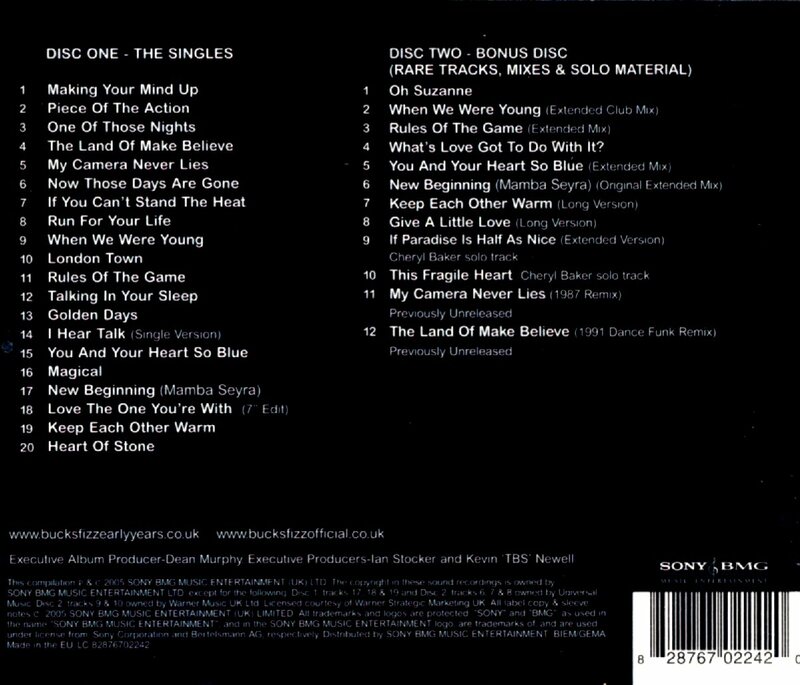 The UK 12" contained the extended version of "New Beginning" and "In Your Eyes" and "I Need Your Love" on the side B. 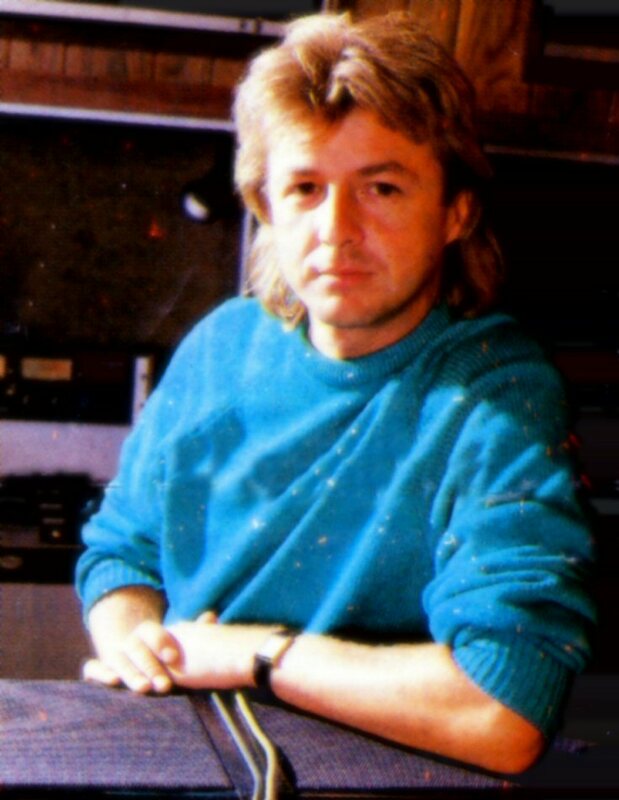 None of the latter tracks was included on the album "Writing on the Wall". 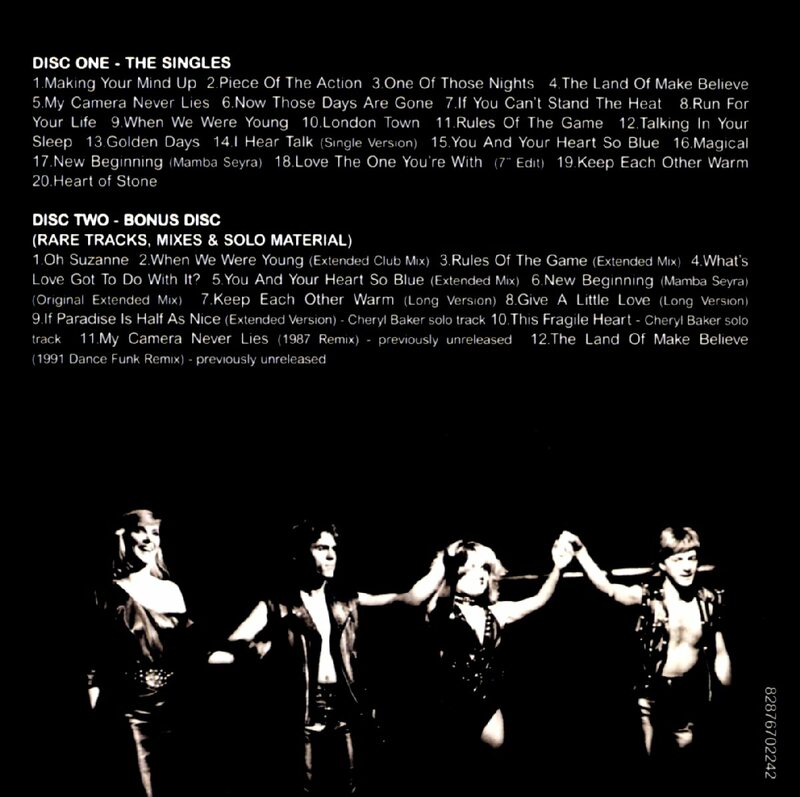 German version of the maxi single featured the same track listing as the British one. 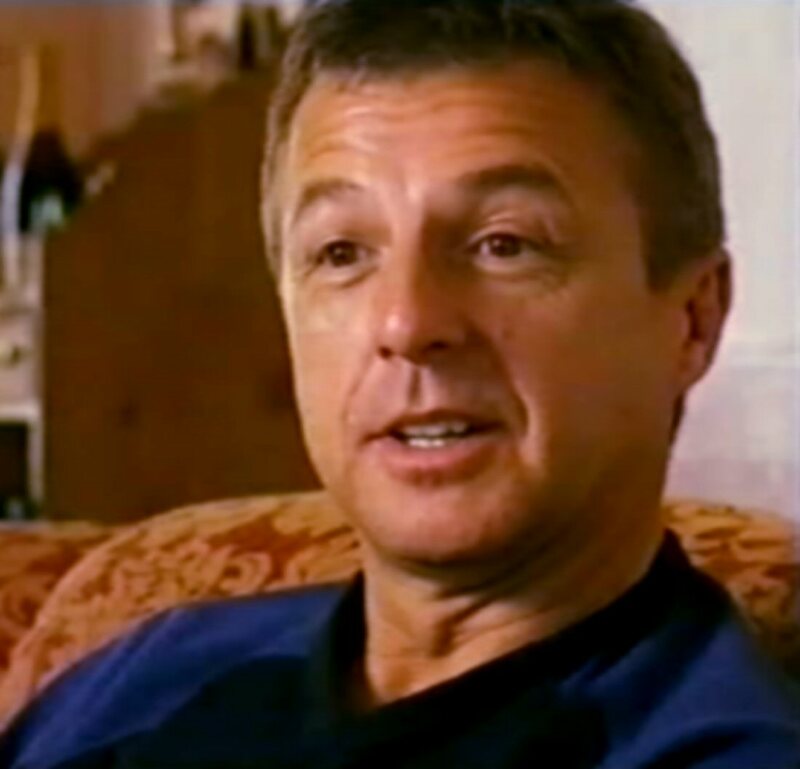 The alternative edition of the maxi single "New Beginning" featured an Ian Levine remix of the song. 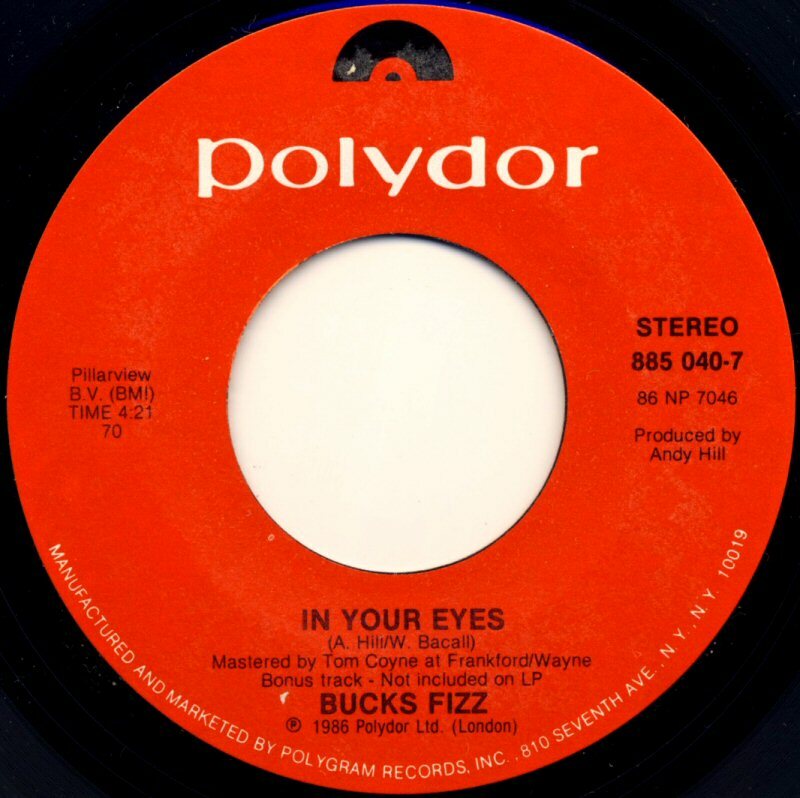 The UK version of this single contained "In Your Eyes" and "I Need Your Love" on the B-side. 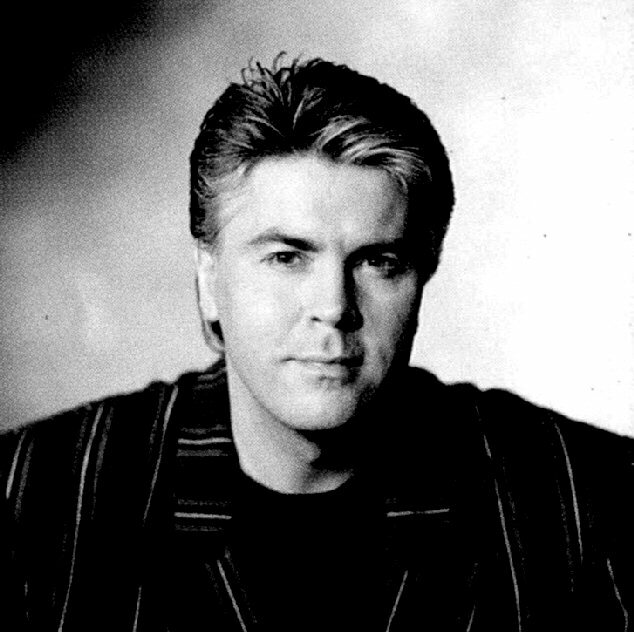 The US version of "New Beginning" remixed by Ian Levine two different remixes of "New Beginning" and its LP version. 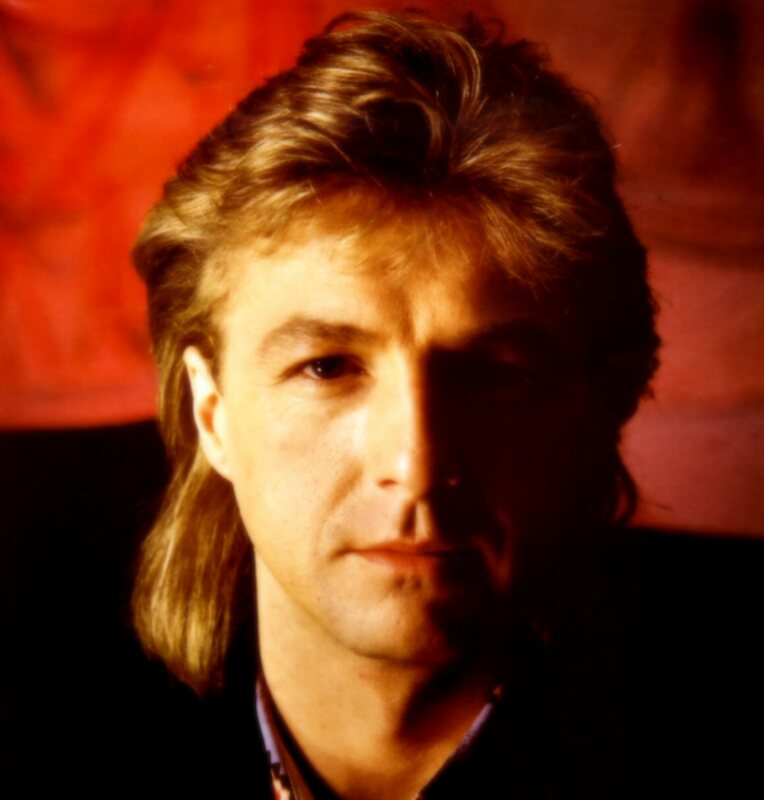 The second single release from the LP "Writing on the Wall" was "Love the one you're with" with a non-album track "Too Hard" on the flipside. 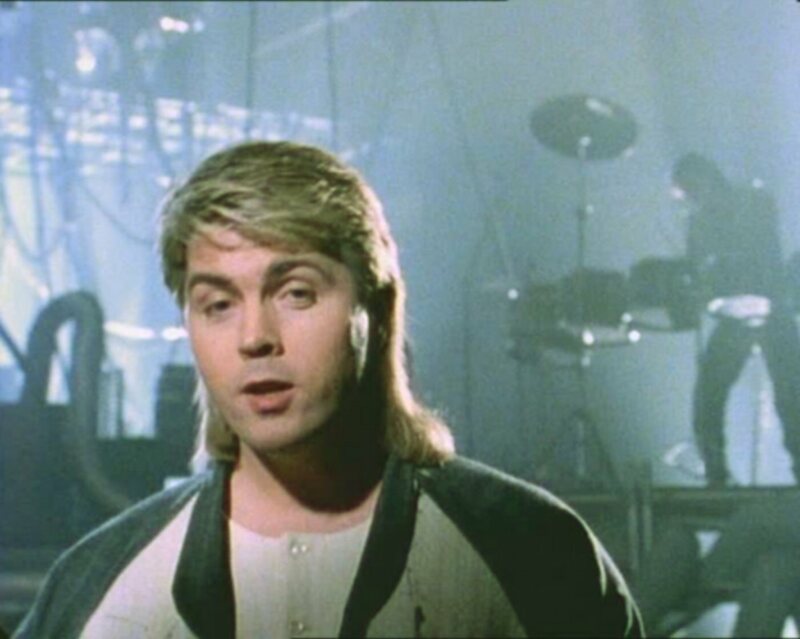 The single entered the British hit chart on August 30th, 1986 where it stayed for 3 weeks reaching #47. 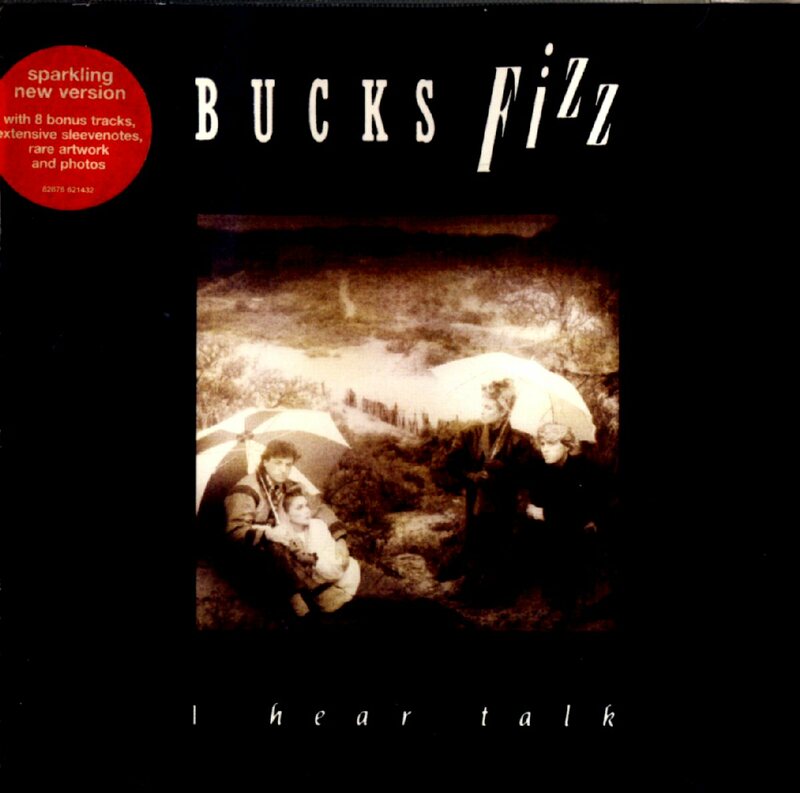 The single was released as a 7" and 12". 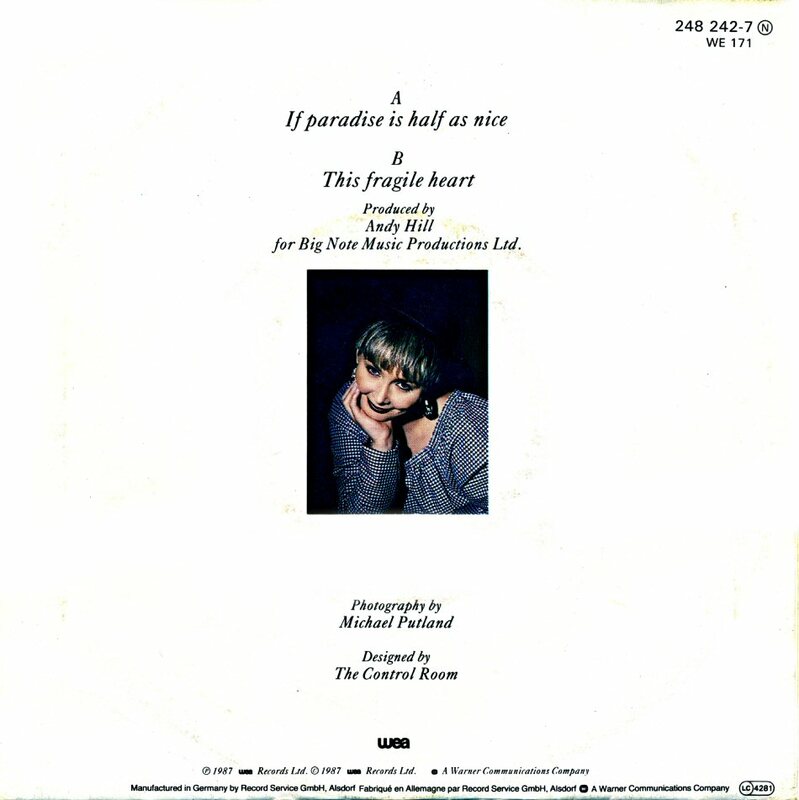 Two maxi single editions were released with two different covers. 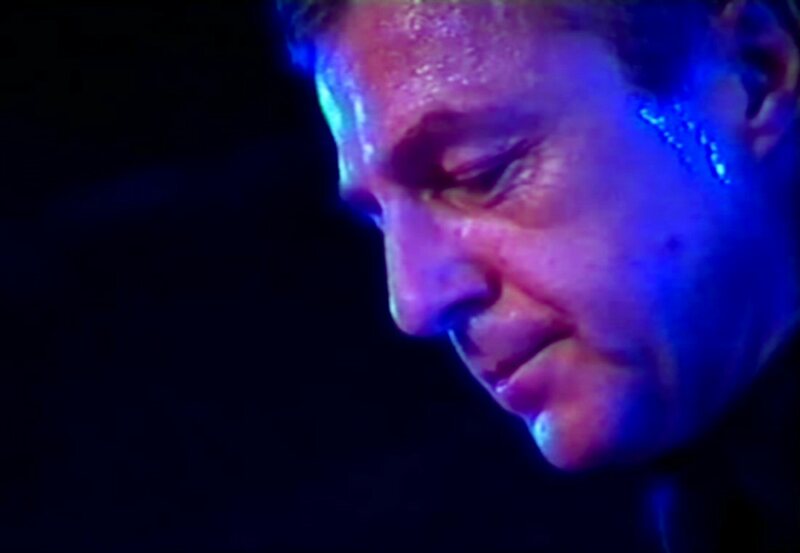 The first version featured an extended version of "Love The One You're With" (7.52) on the side A and an remixed extended version of "I Hear Talk" and "Too Hard" on the side B. 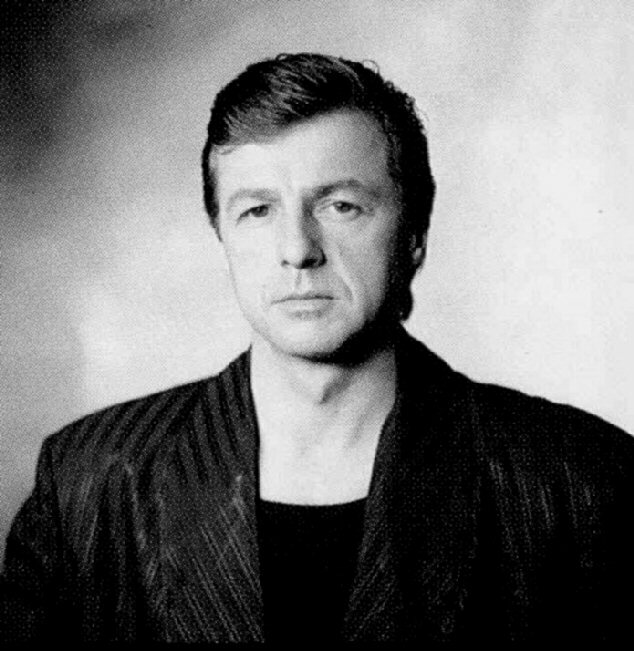 The second maxi single featured a dance edit of "Love The One You're With" on the side A and an extended version of "I Hear Talk" and "Too Hard" on the side B. 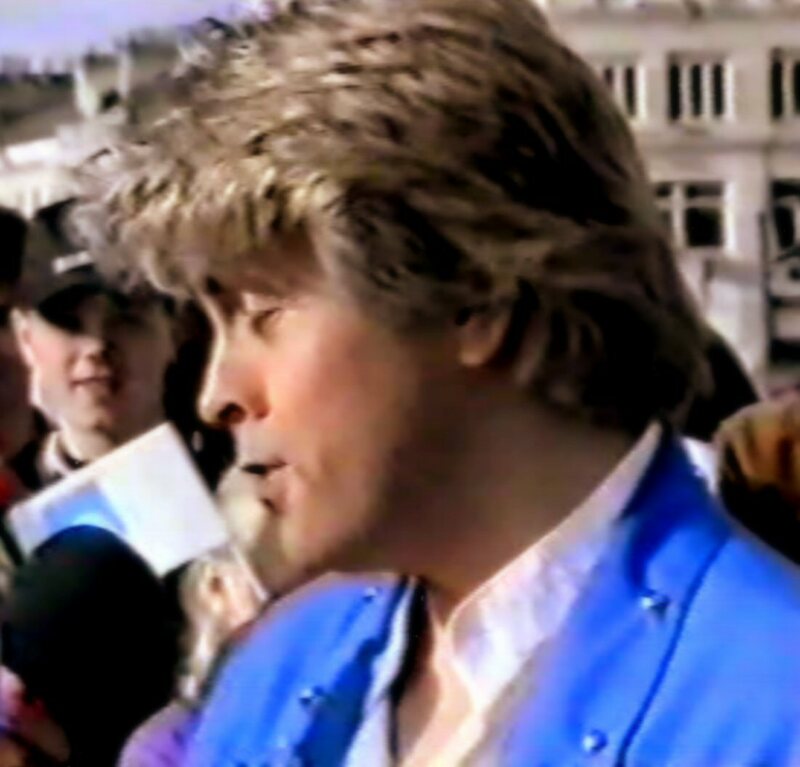 A new video was filmed and the group promoted the new single in several TV shows. 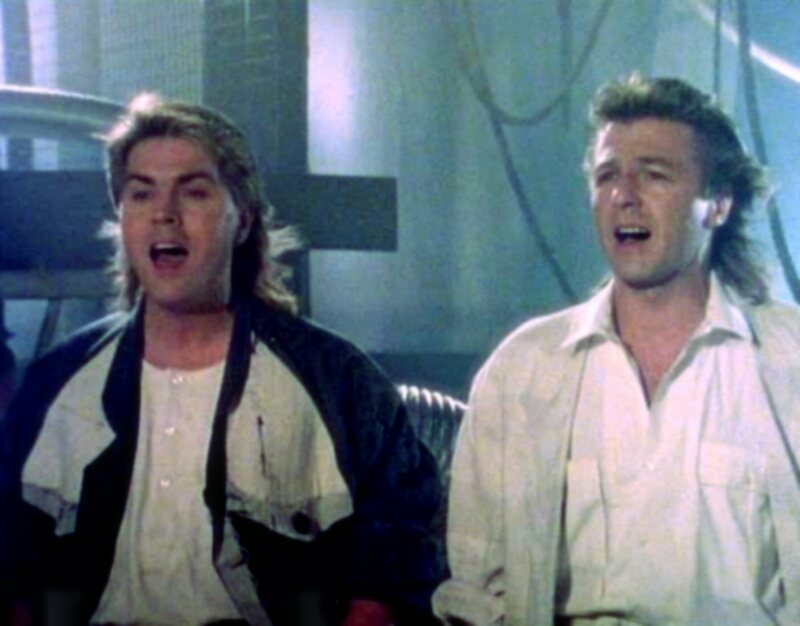 The ballad "Keep Each Other Warm" was released as a single at the beginning of November 1986 and it entered the UK chart on November 15th. The single reached #45 and stayed on the chart for 4 weeks. 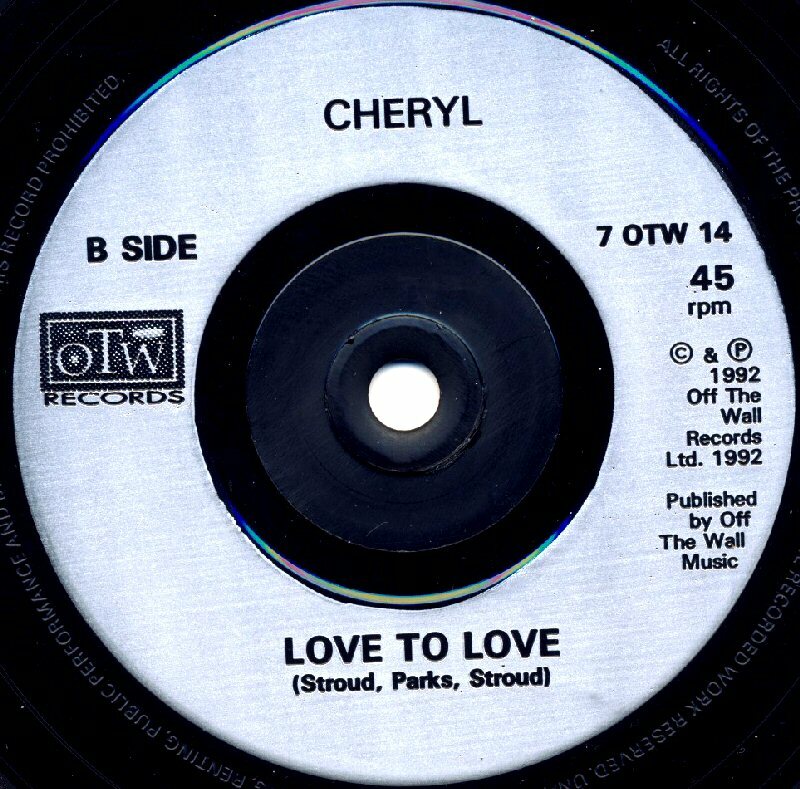 "Give a Little Love" performed by Cheryl was on the B-side. 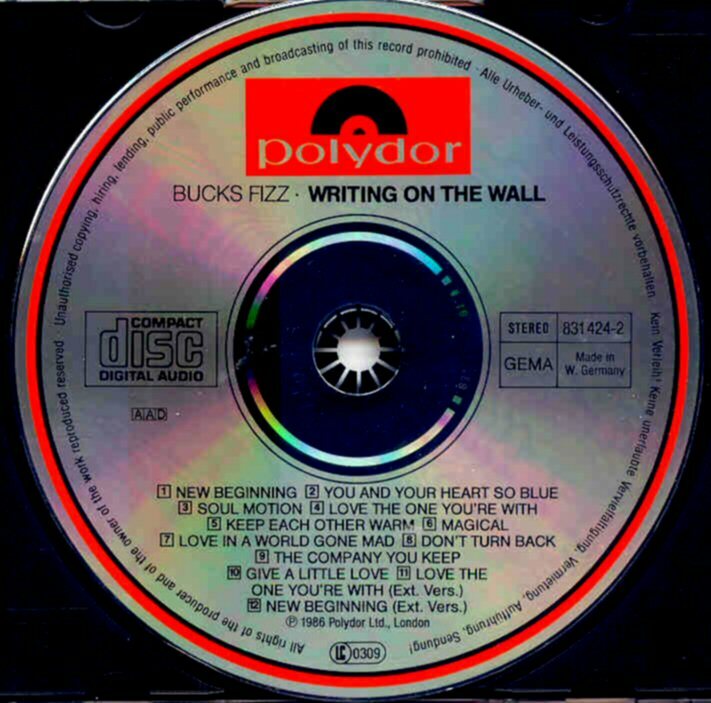 The single was released in three different versions: 7", a limited edition with bonus single containing "The Writing On the Wall Medley Part 1 & 2". 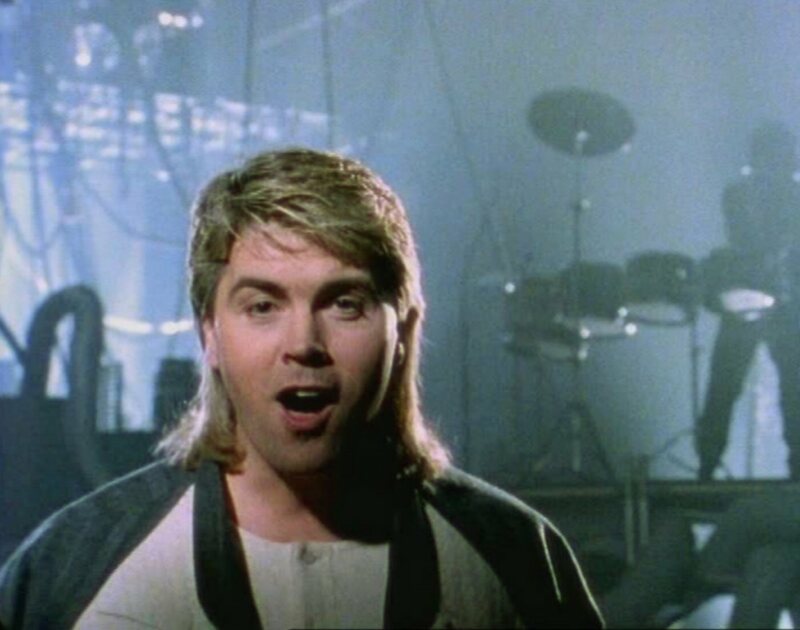 It was even released as a 12" (picture disc) with long version of "Keep Each Other Warm" and a remixed version of "Give a Little Love". The 7" single was even released in West Germany. 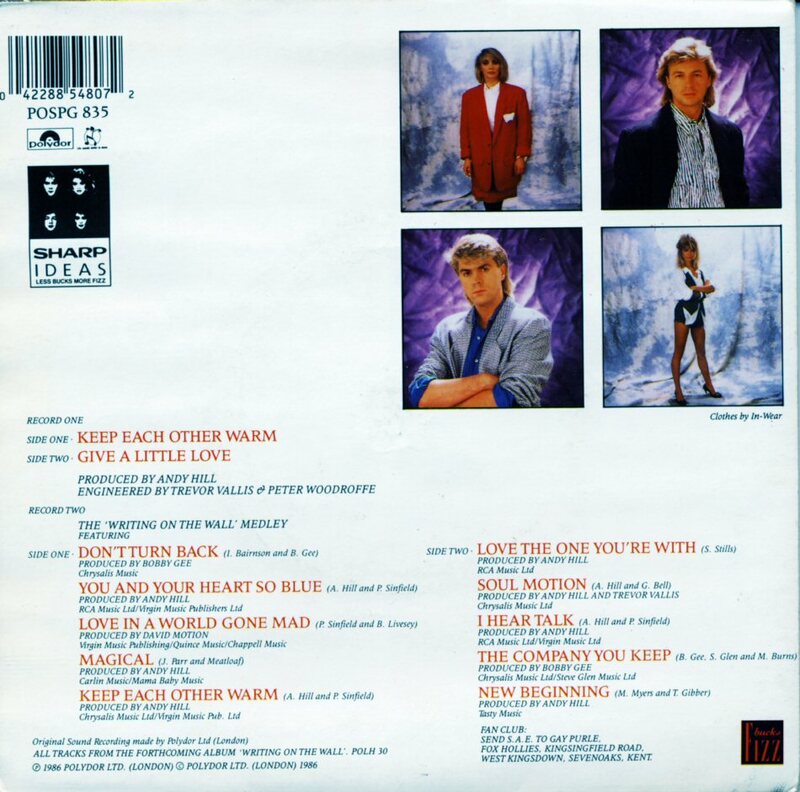 The long version of "Keep Each Other Warm" saw its release on maxi single and a picture disc maxi single. 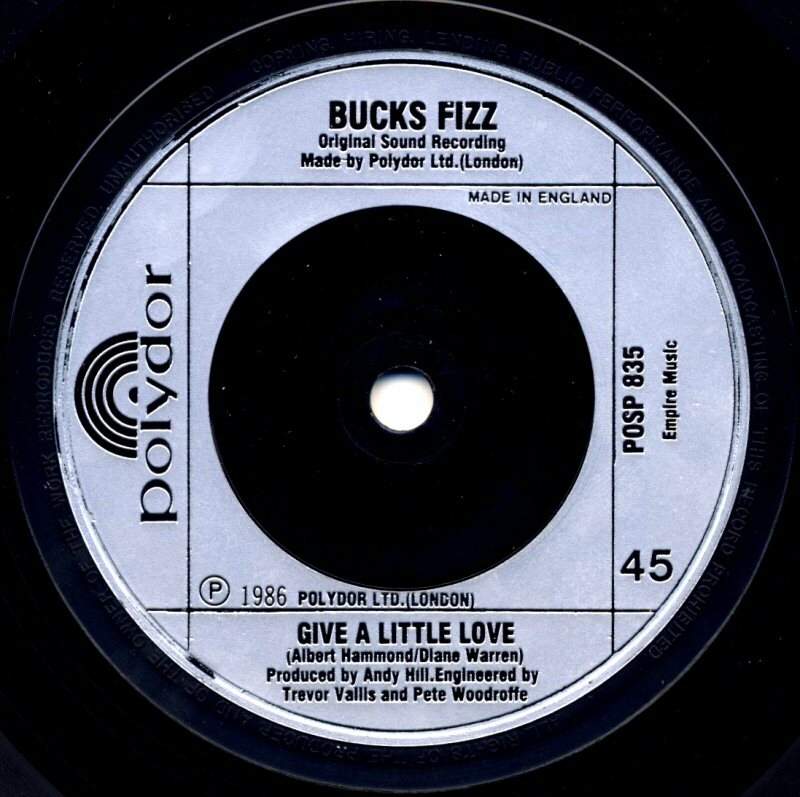 The B side of the 12" single contained long version of "Give a Little Love" which was not included on the UK version of the album "Writing on the Wall". 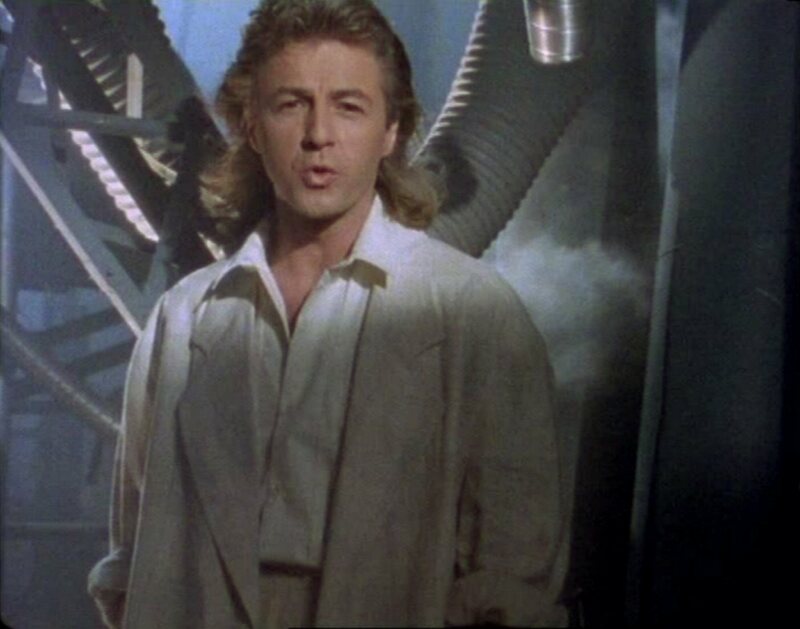 "Writing on the Wall" was a significant album for many reasons. 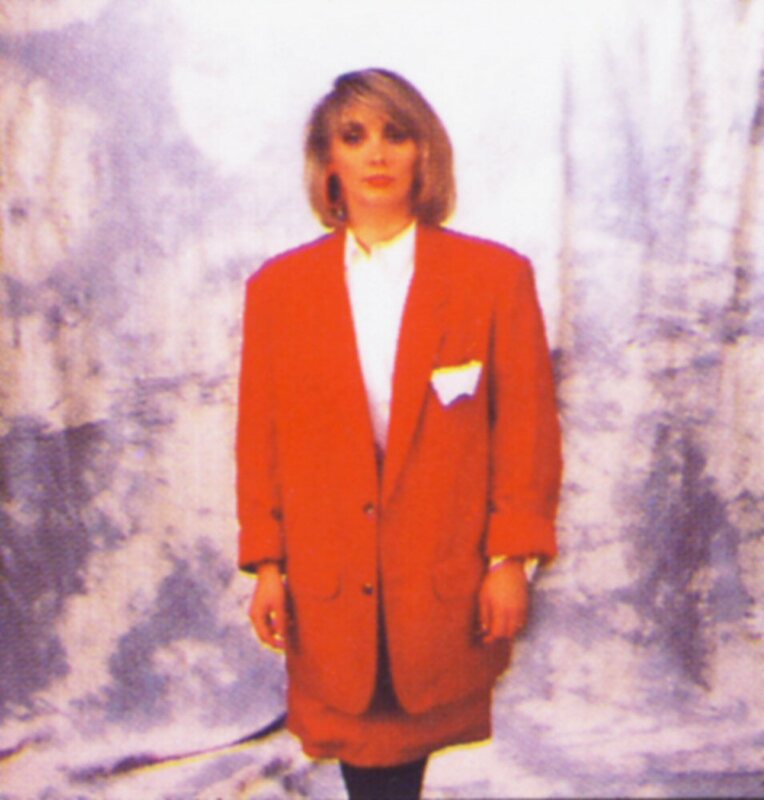 Apart from being Bucks Fizz final studio album, it was also the only one to feature newly recruited member Shelley Preston, who had replaced Jay Aston a year before. 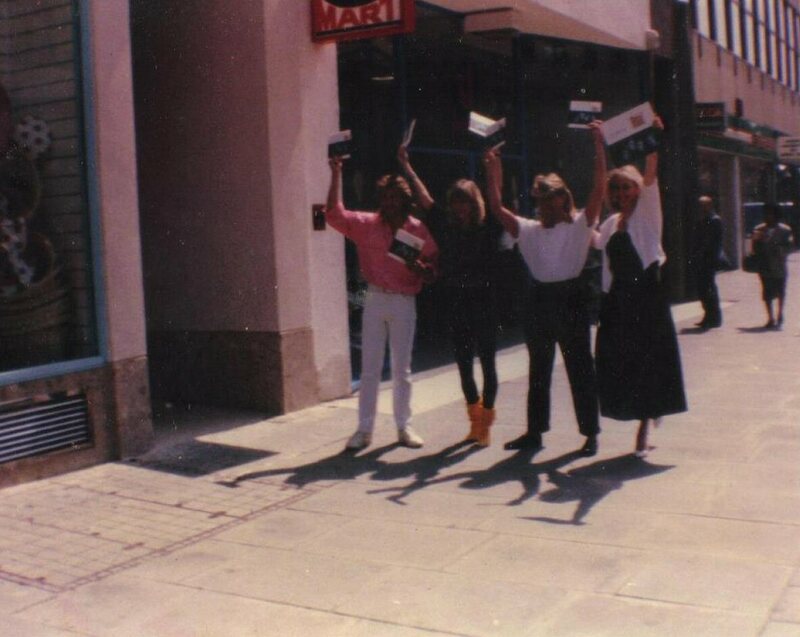 It was also their first album on a different record label — Polydor — after their 5-year contract with RCA had finished. 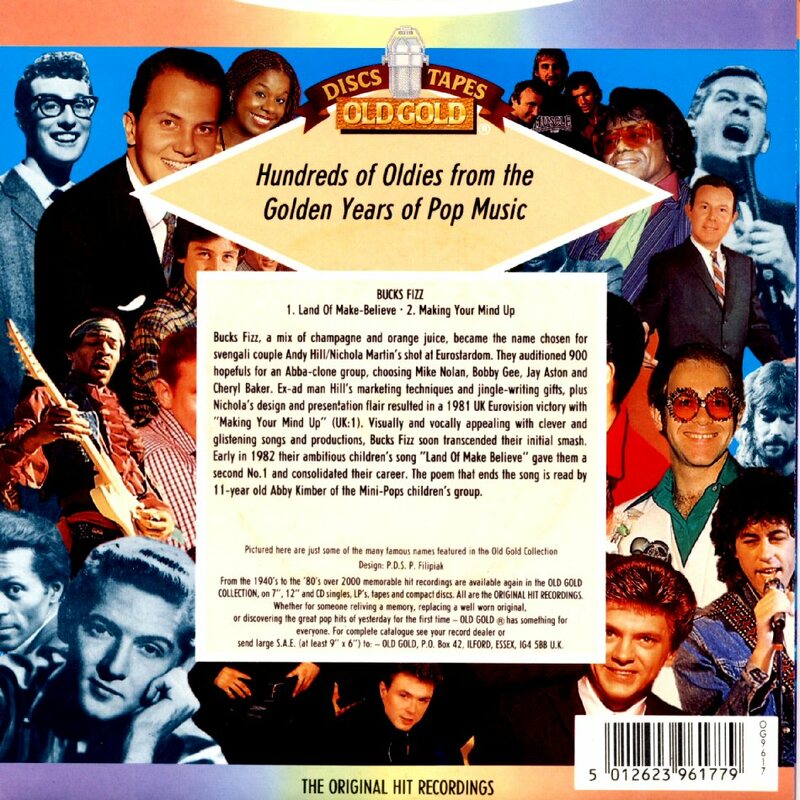 Despite this, the album contained three of its ten songs from the RCA days. 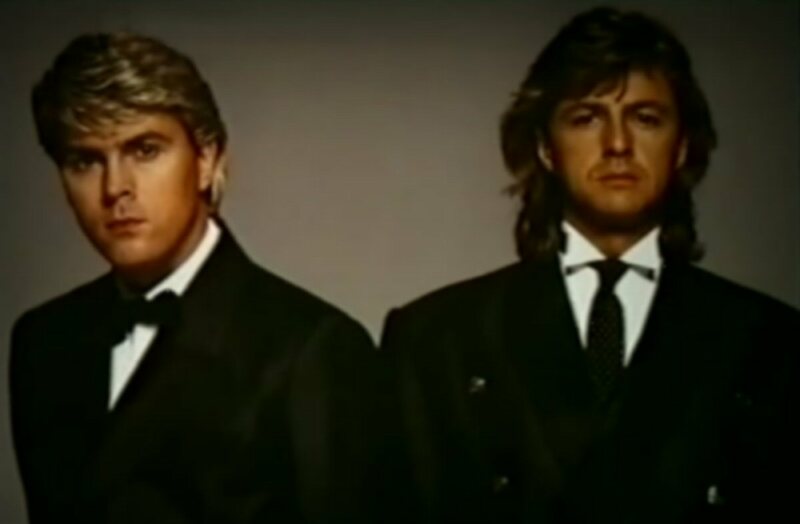 These being the first two singles, "You and Your Heart so Blue" and "Magical", along with a remix of "I Hear Talk", which was featured on their 1984 album of the same name, but included here as it had since become a big hit in the clubs in both the UK and US. 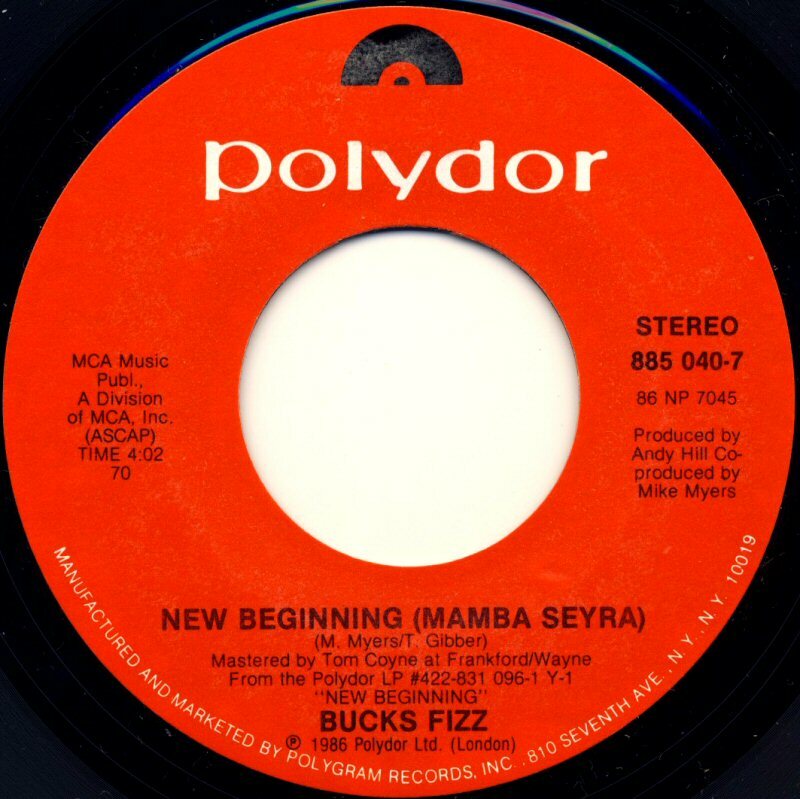 The biggest selling point of the album was the top ten comeback hit "New Beginning (Mamba Seyra)", released in May 1986. 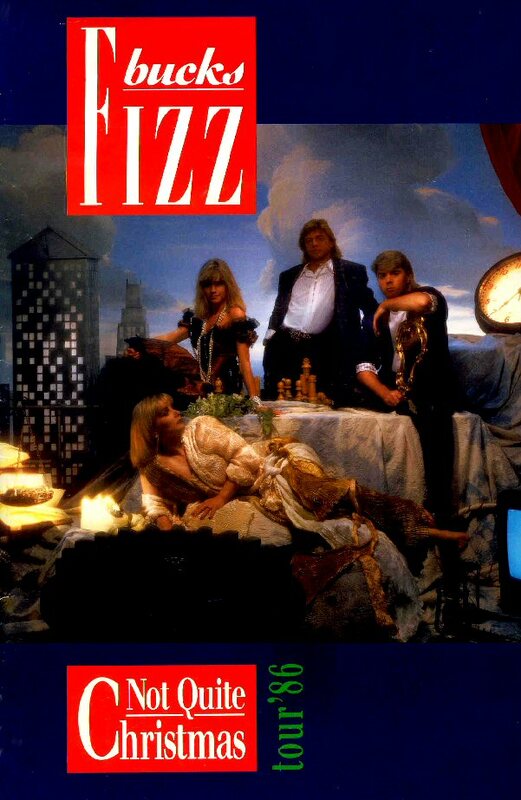 The song become their first big hit in some time and received some of their biggest critical acclaim. 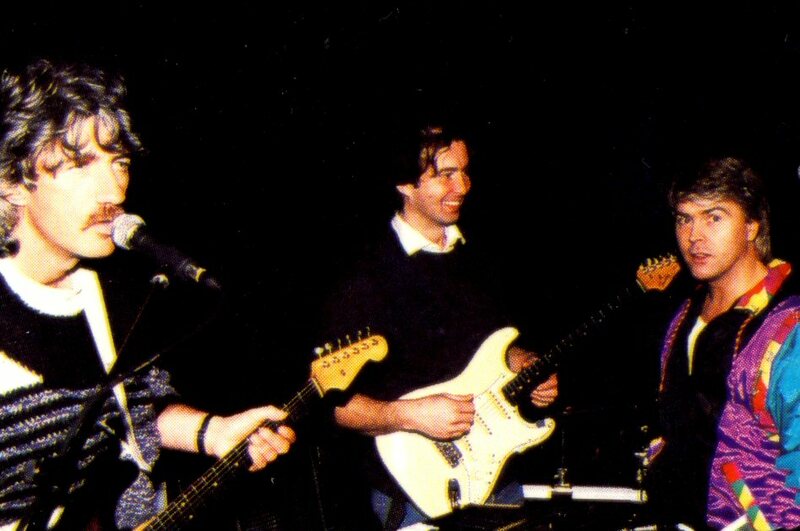 The group elected to release a cover version as the follow-up — a reworking of Stephen Stills' "Love the One You're With". 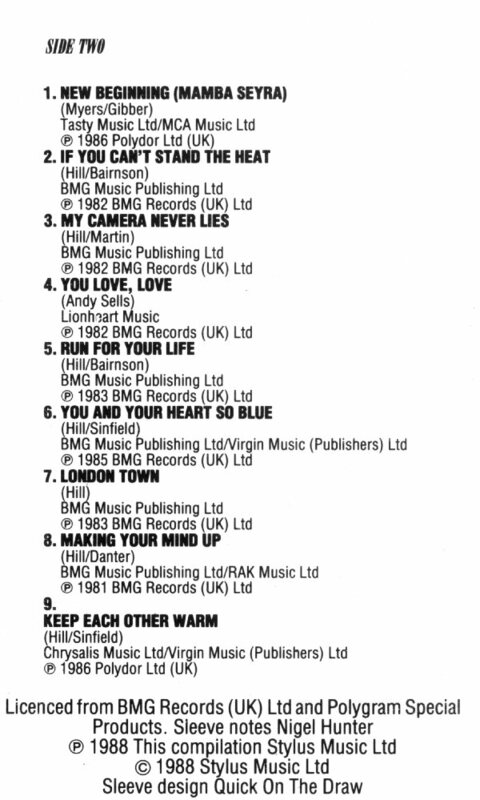 The song stalled outside the top 40 and the next single, "Keep Each Other Warm", also failed to sell well. 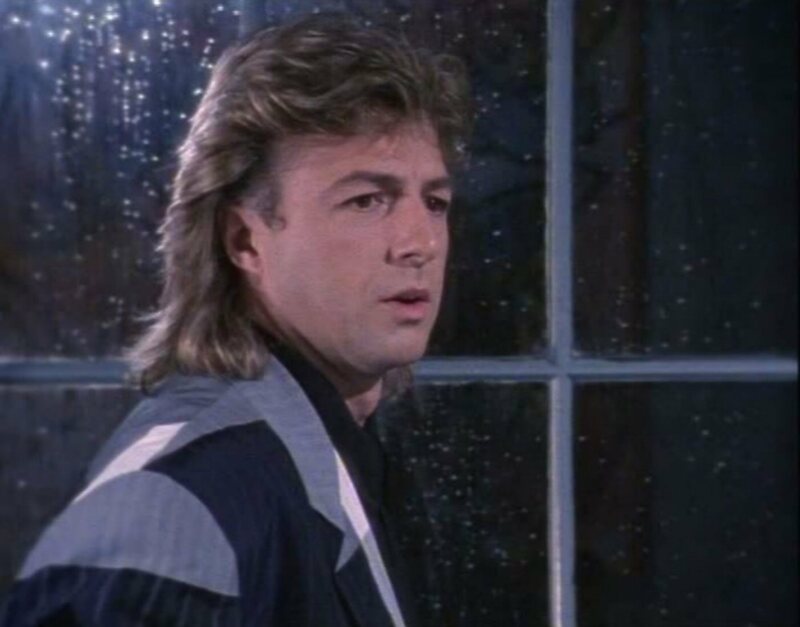 The album, released in November 1986, could not sustain the comeback success of the "New Beginning" single and, despite positive reviews, didn't make a great impression on the charts. 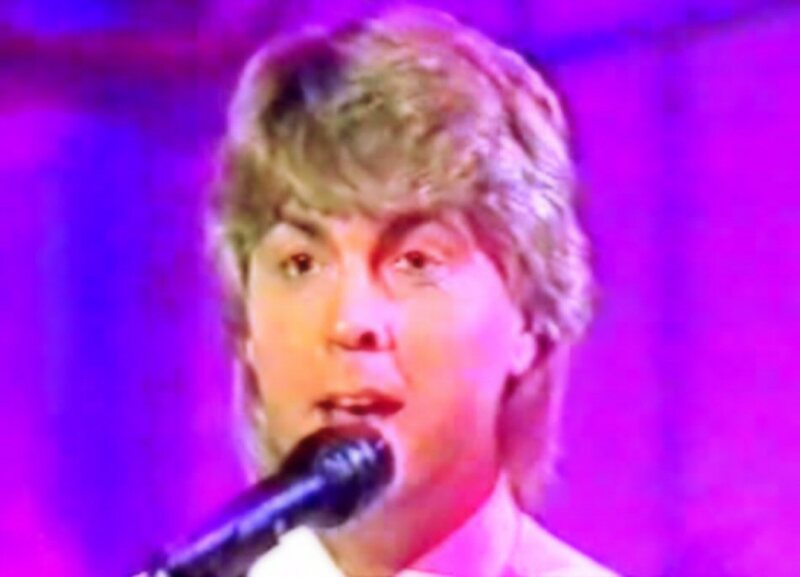 Because of this, a planned early 1987 single release of "Love in a World Gone Mad" was shelved. 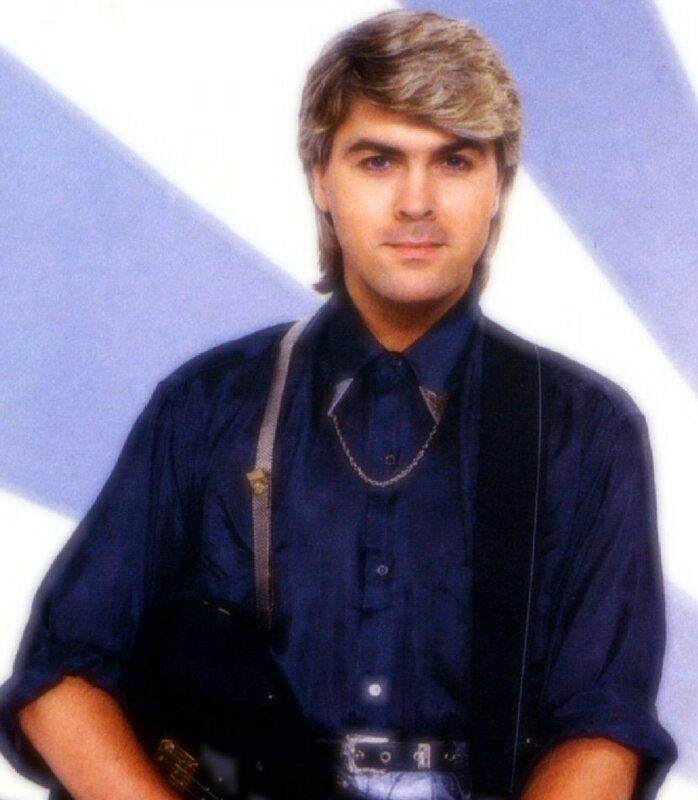 The album "Writing on the Wall" featured 10 songs including the smash hit "New Beginning" and two other 85/86 singles "You And Your Heart So Blue" and "Magical". 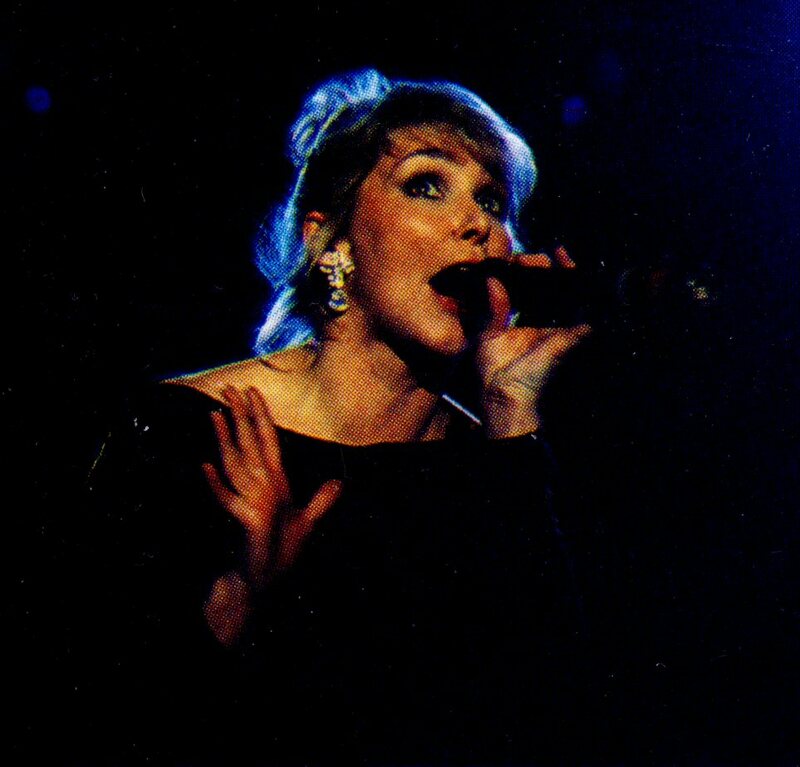 The song "Love in the World Gone Mad" sung by Cheryl would be covered one year later by Agnetha Fältskog on her solo album "I Stand Alone". 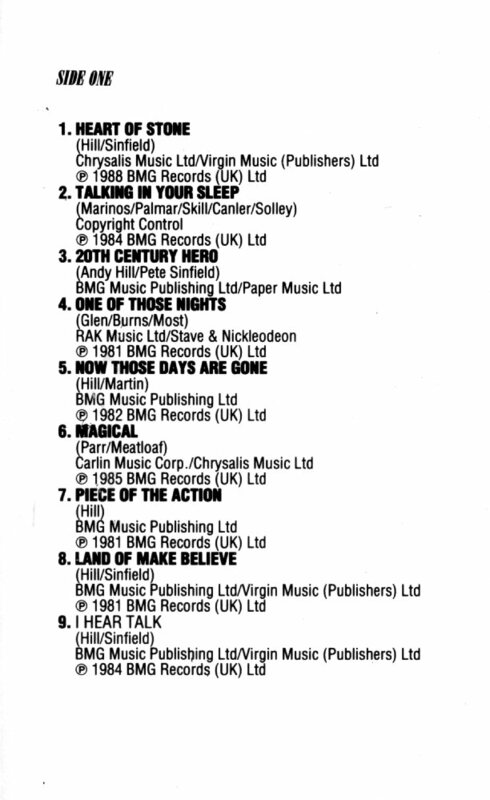 Cheryl sang lead even on "Give a Little Love", Mike on "The Company You Keep" and Bobby on the other 7 tracks. 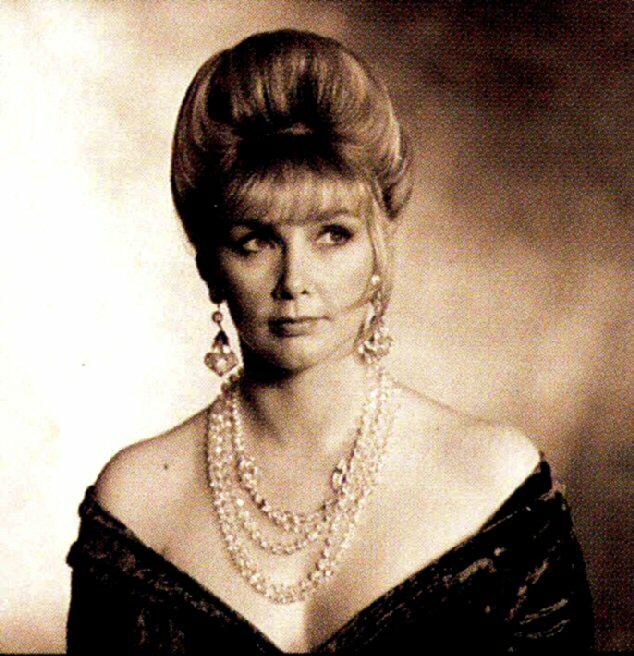 The new vocalist Shelley Preston did not get any lead vocal on the album. 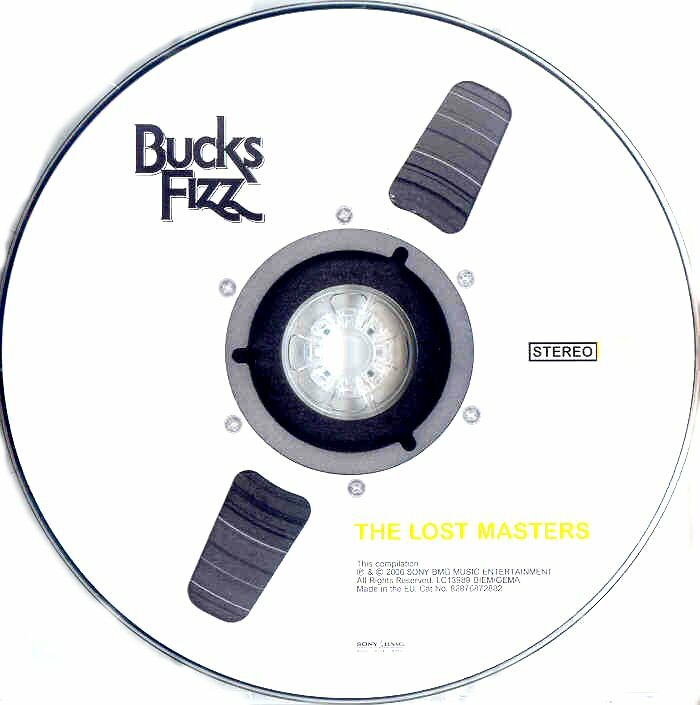 The LP was released in two different versions: the UK and the European. 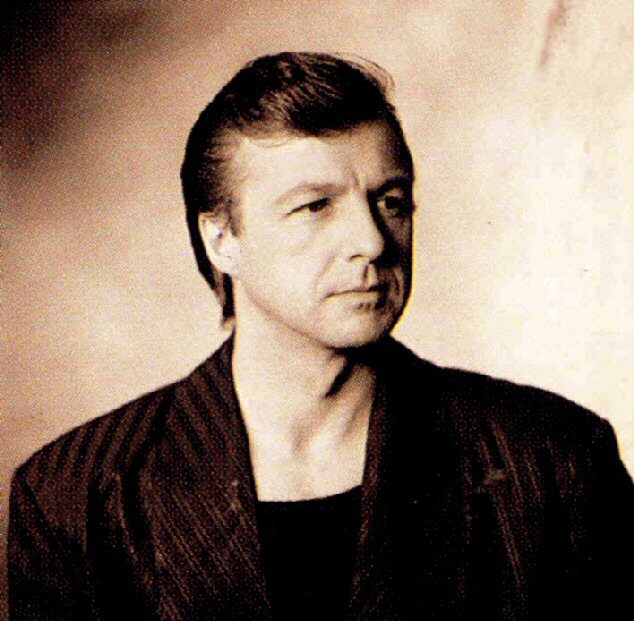 Polydor in the UK removed the track "Give a Little Love" and put in an extended version of "I Hear Talk" instead. 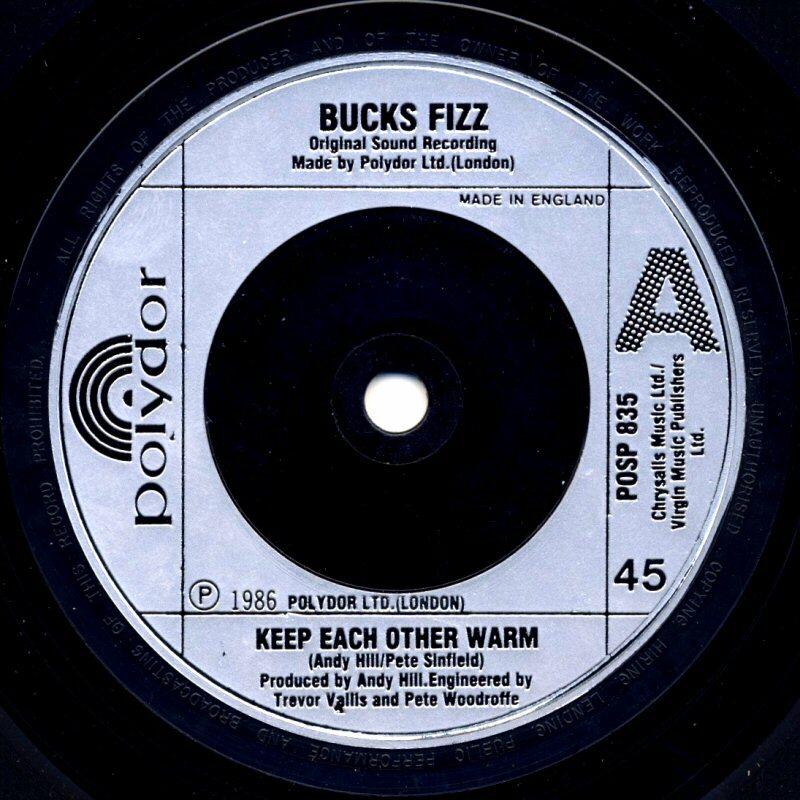 The UK version of the album contained even the long version of "Keep Each Other Warm". 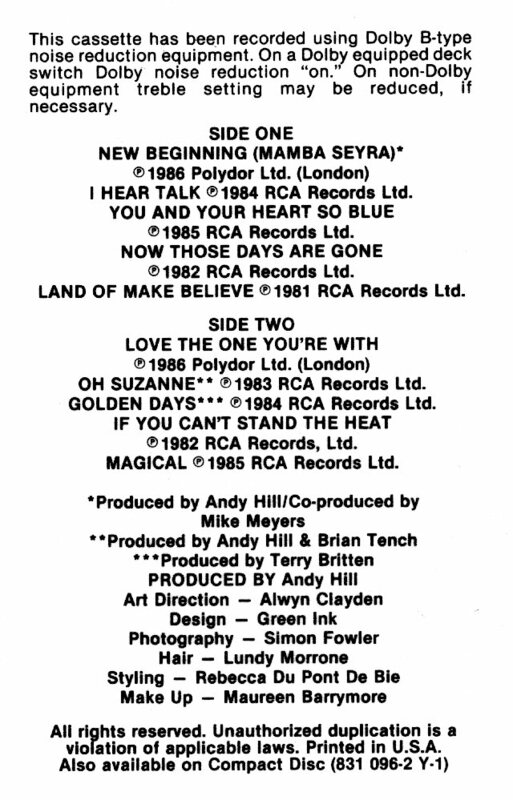 Track listings were different on the both versions. 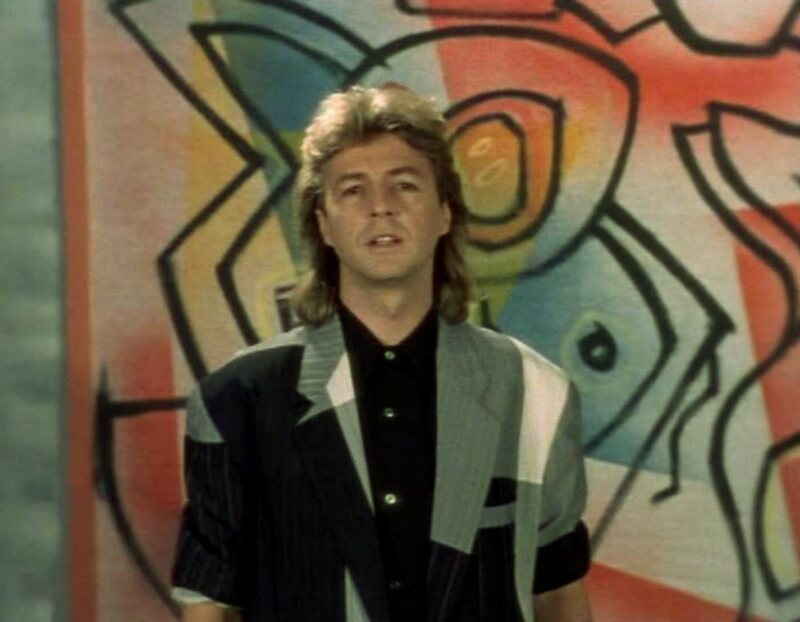 "Writing on the Wall" entered the British chart on 13 December 1986 where it stayed for only 1 week reaching #89. 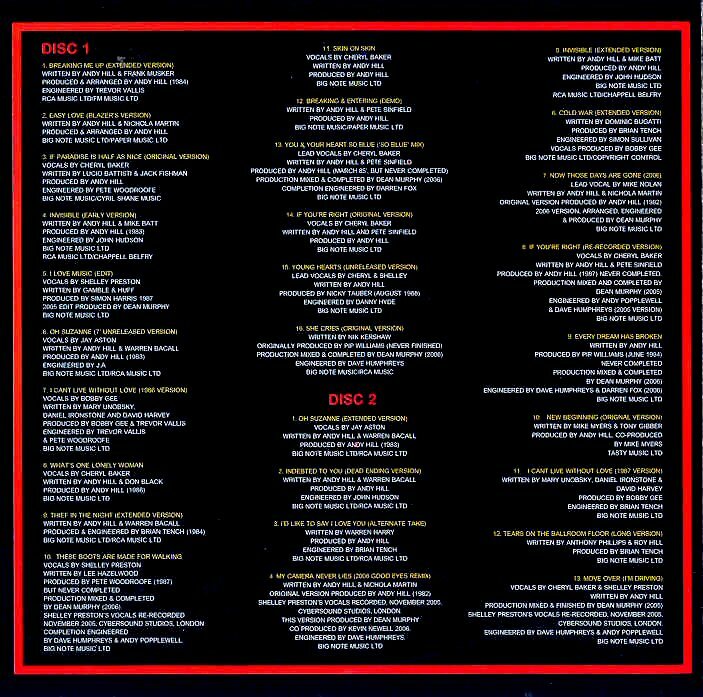 The cassette edition contained slightly different track listing. 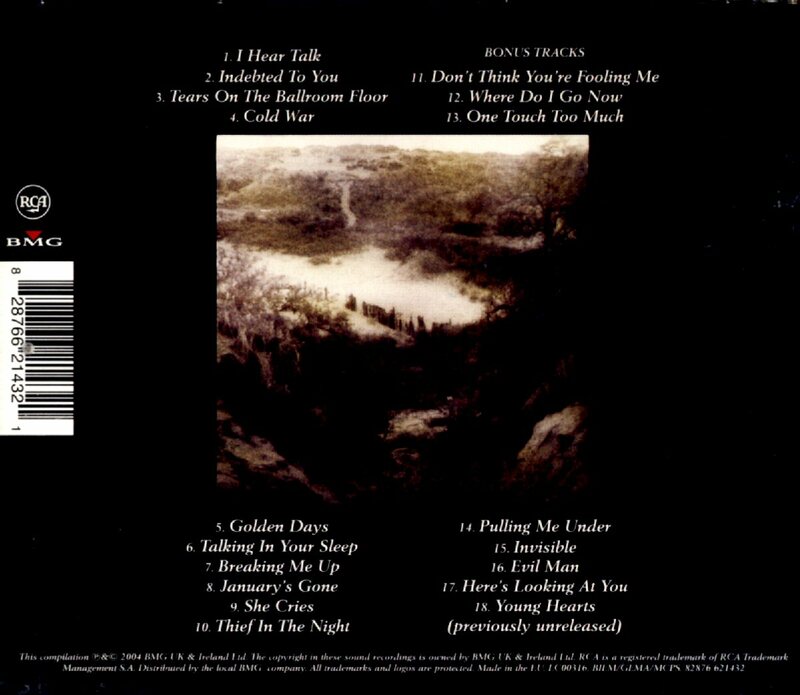 On the side A there were 9 tracks in the same order as on the LP. 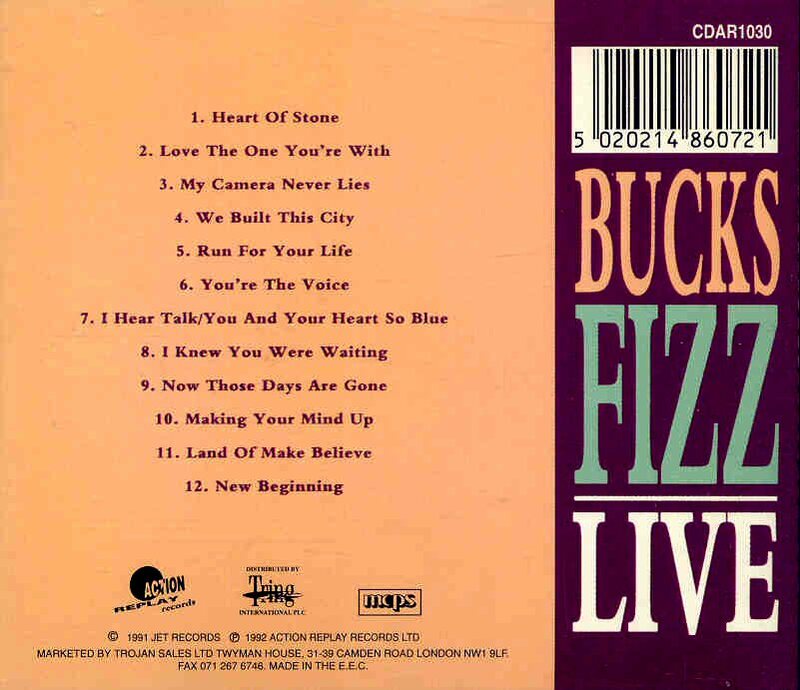 "Give a Little Love" was omitted on this release as well. 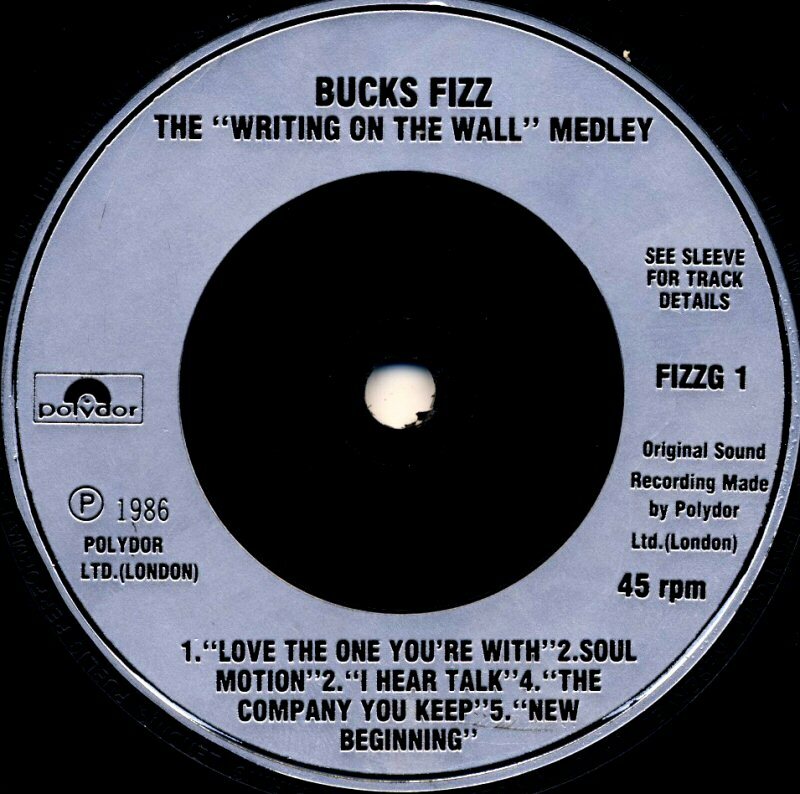 The B-side contained extended versions of "New Beginning", "I Hear Talk" and "Love The One You're With" as well as the long version of "Keep Each Other Warm". 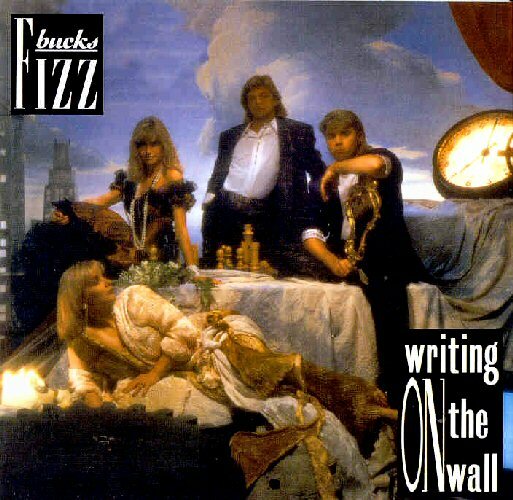 The CD era was starting at that time and "Writing on the Wall" was released by Polydor even on CD in quite limited edition which made this CD to an extremely-hard-to-find Bucks Fizz release. 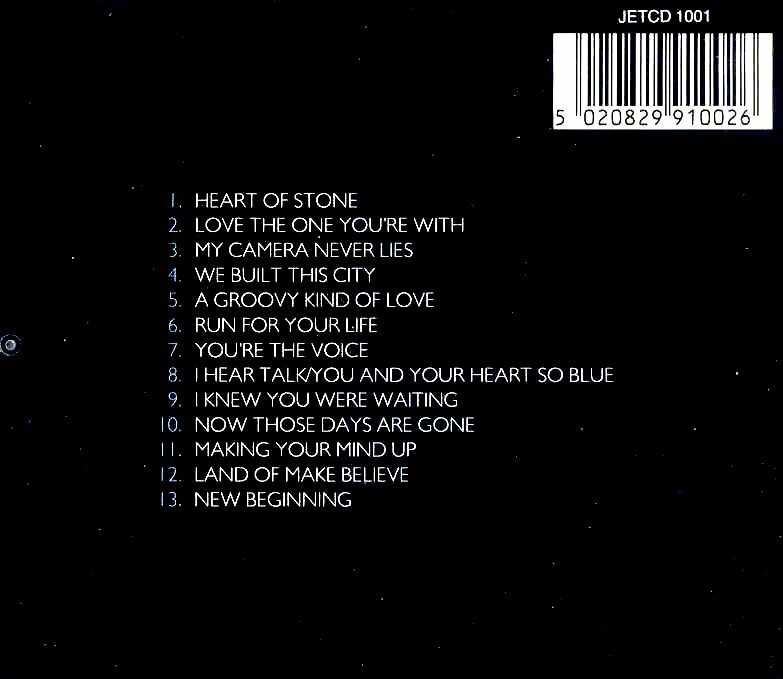 The CD contained 10 new studio songs (including: Give a Little Love) and two bonus tracks: Love the One You're With (extended version 7.51) and New Beginning (extended version 7.31). 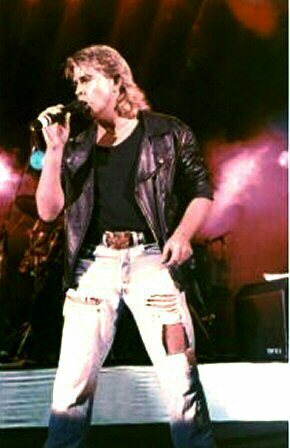 The group performed at the biggest nightclub in Birmingham - "The Dome" at the end of November 1986. 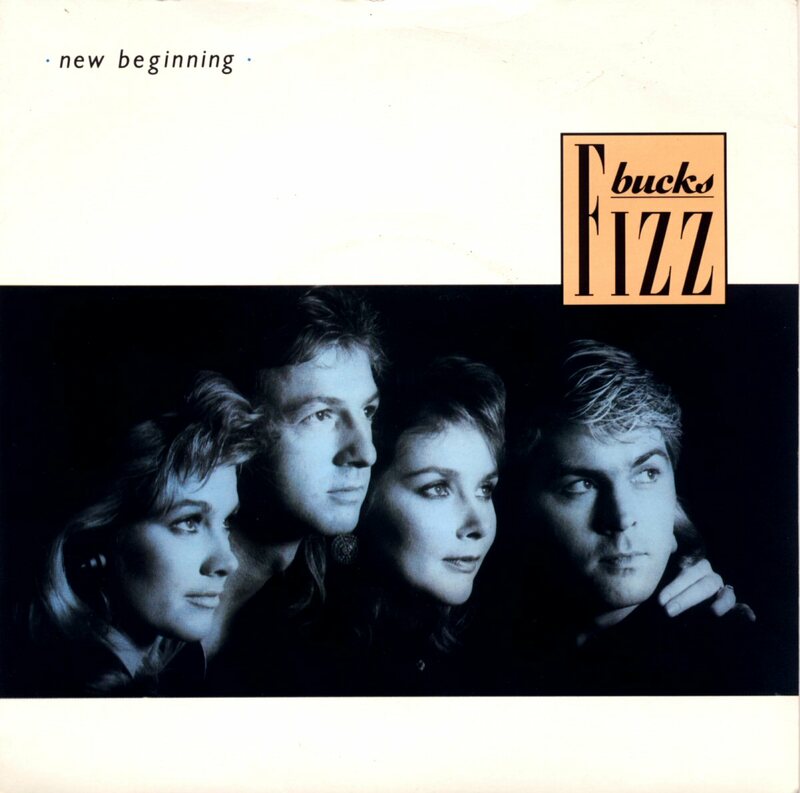 In USA Polydor released a compilation album entitled "New Beginning". 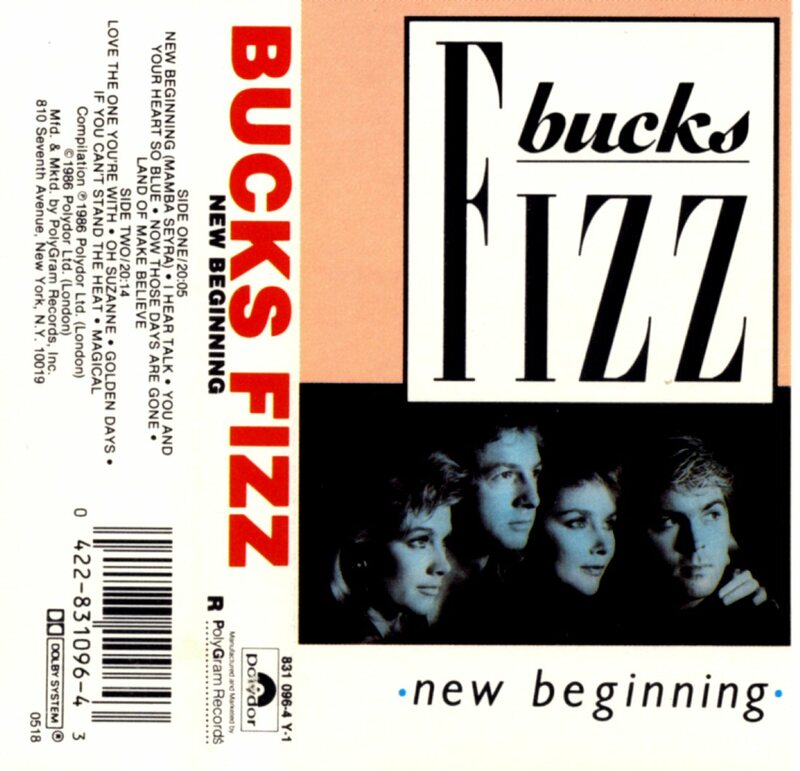 The album featured Bucks Fizz' latest chart hits as "New Beginning" and "Love The One You're With" as well as older hits such as: "I Hear Talk", "The Land of Make Believe", Magical" and many others - totally 10 tracks. 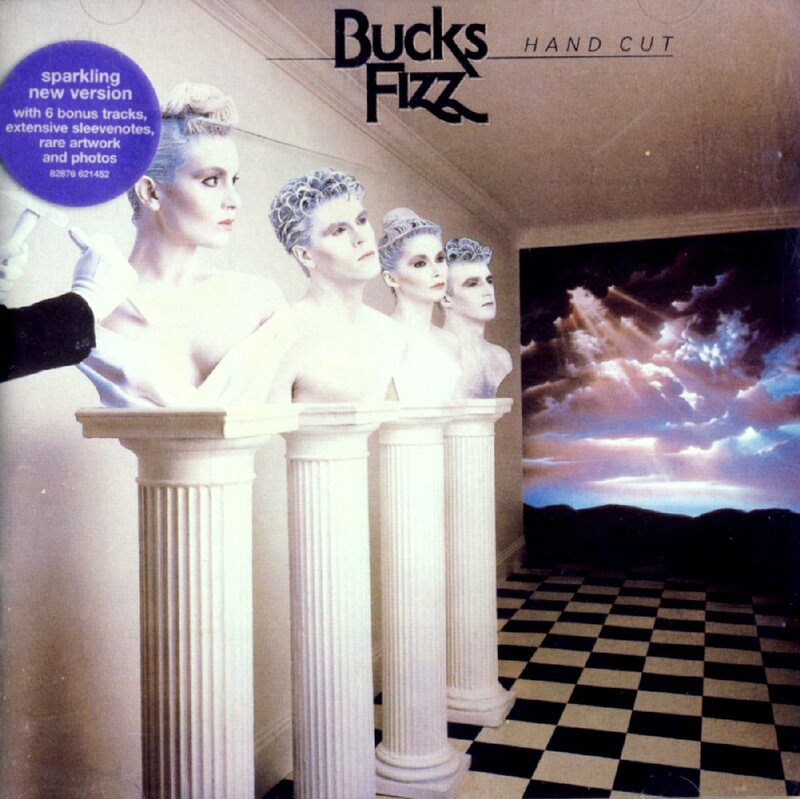 It was the second Bucks Fizz compilation album released in USA. 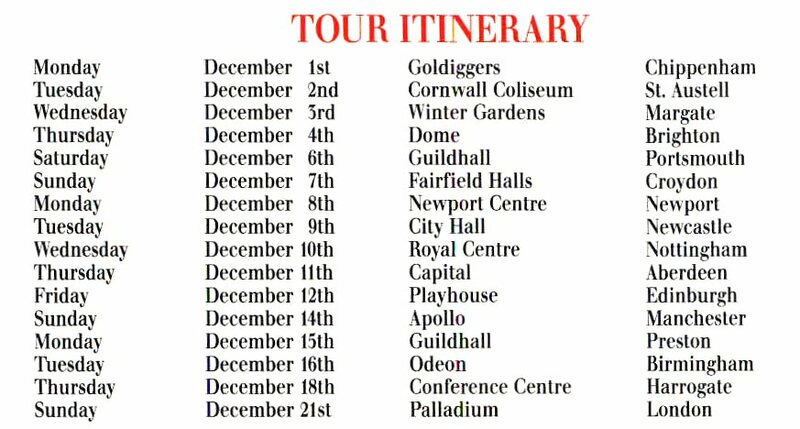 The December Tour was called "Not quite Christmas". 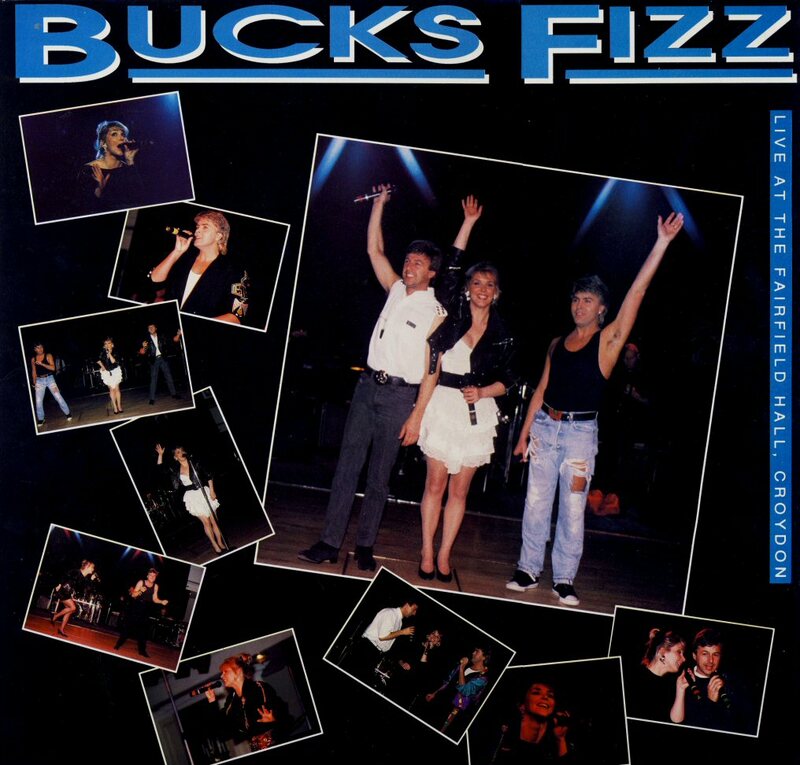 In June Bucks Fizz performed on the magazine "Woman" 50th Birthday Gala Concert at the London Palladium in the presence of Princess Diana. 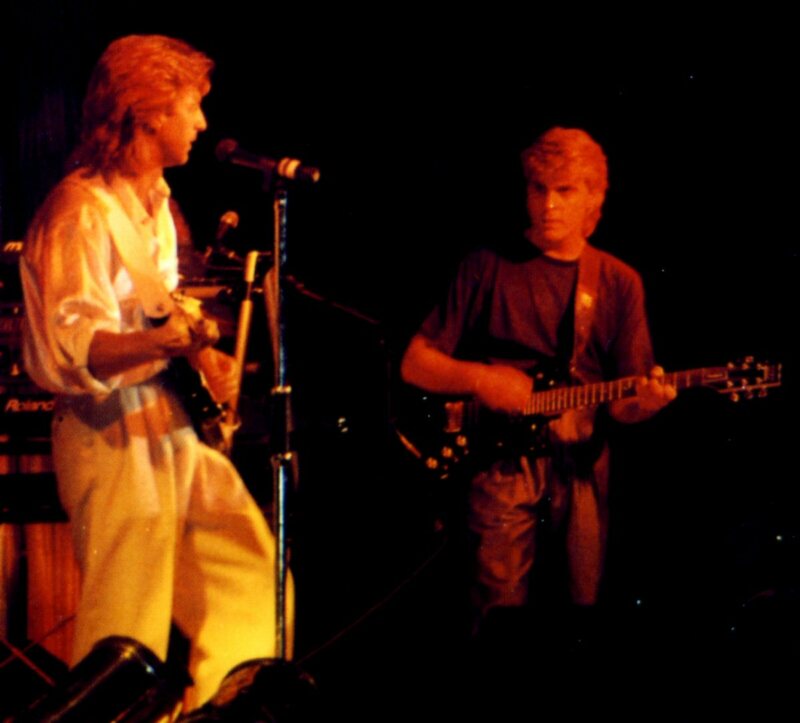 The year 1987 did not bring any new recordings from the band. 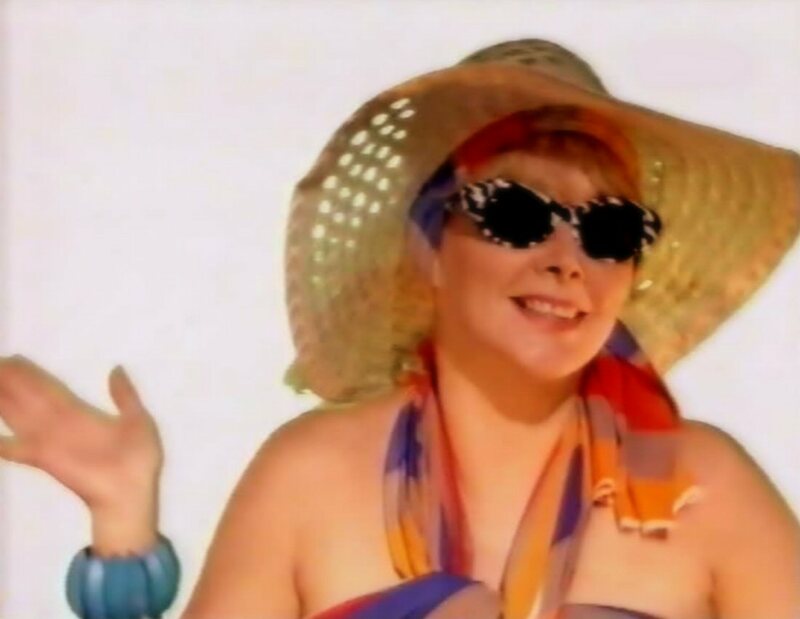 Due to the lack of activities in the group Cheryl Baker decided to do some music on her own. The original idea was to make a whole album but because of some different reasons the project was abandoned after a while. 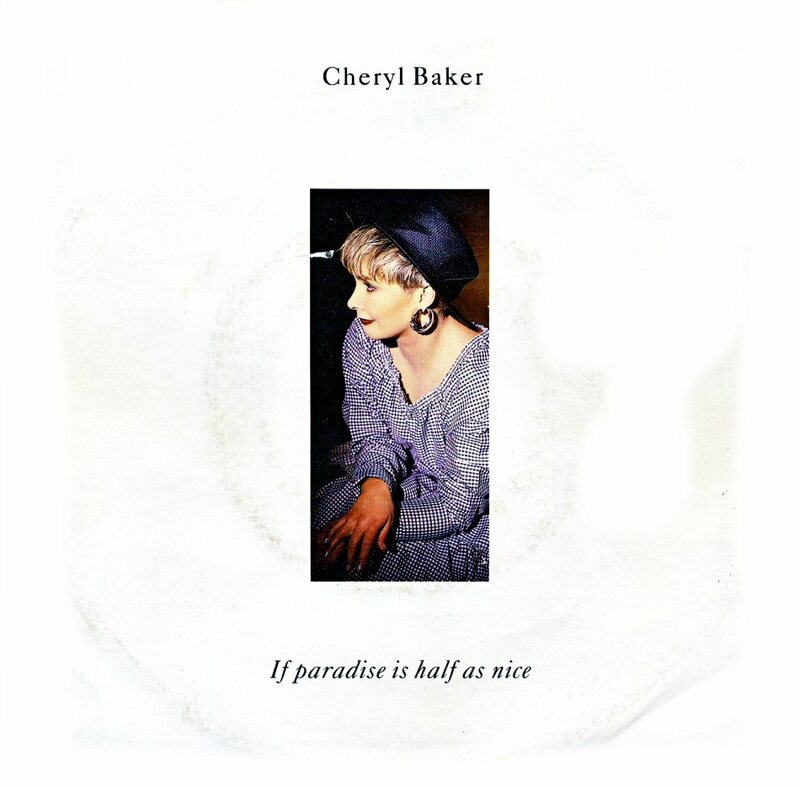 Cheryl recorded several new songs but only two of them were released on the single "If Paradise is Half as Nice" b/w "This Fragile Heart" - the latter written by the Bucks Fizz composer Andy Hill. 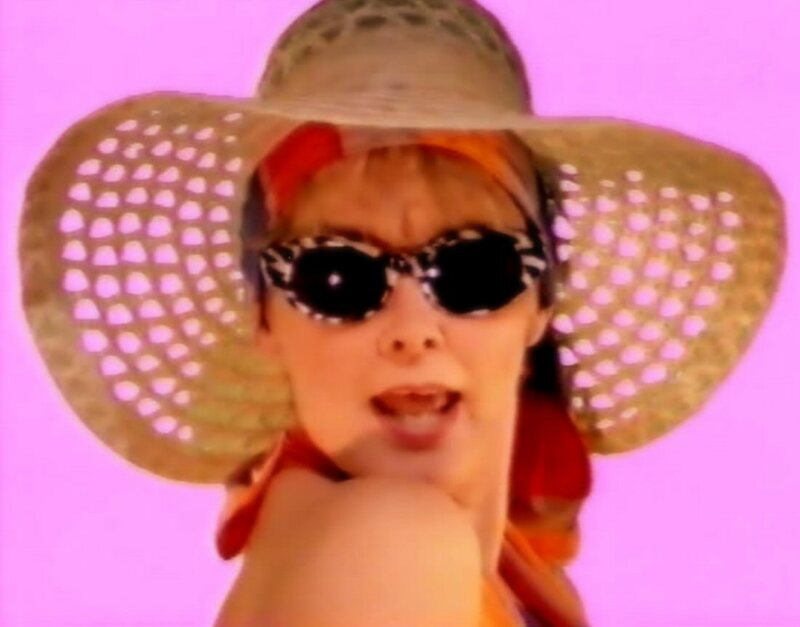 Both tracks were produced by Hill but even if the songs were great pop pieces the single did not enter the British single chart. 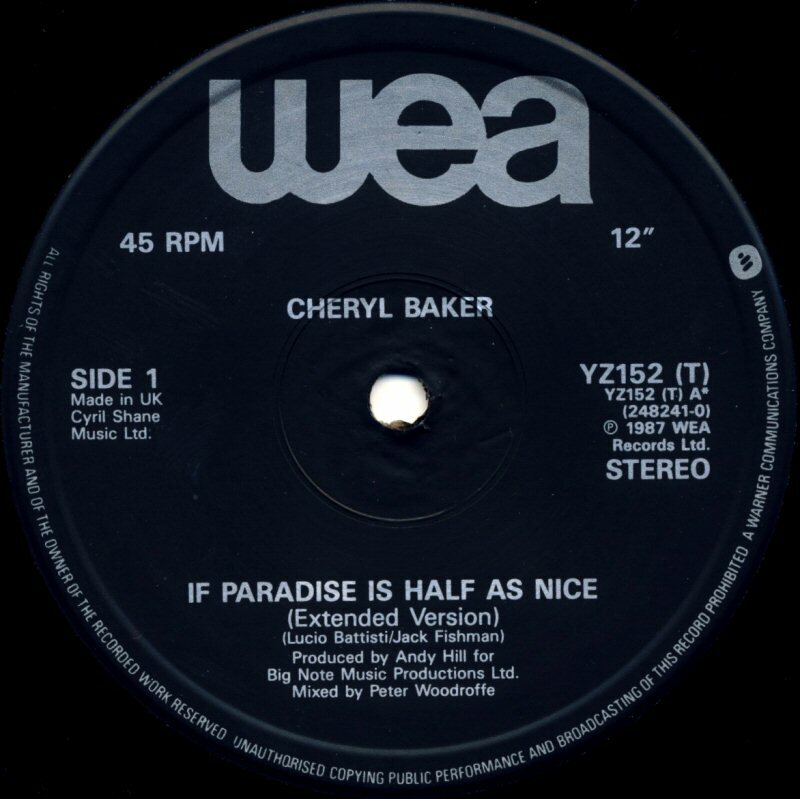 The single was released as 7" and 12" The 12" featured an extended version of "If Paradise is Half so Nice". 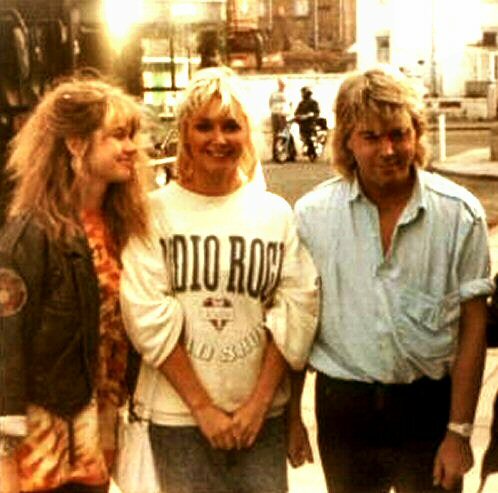 After the silent year 1987 Bucks Fizz got together again for a successful summer tour in Great Britain. At the same time they re-signed with record company, RCA. Their first single release was called "Heart of Stone" and it promoted the compilation album "The Story so Far". 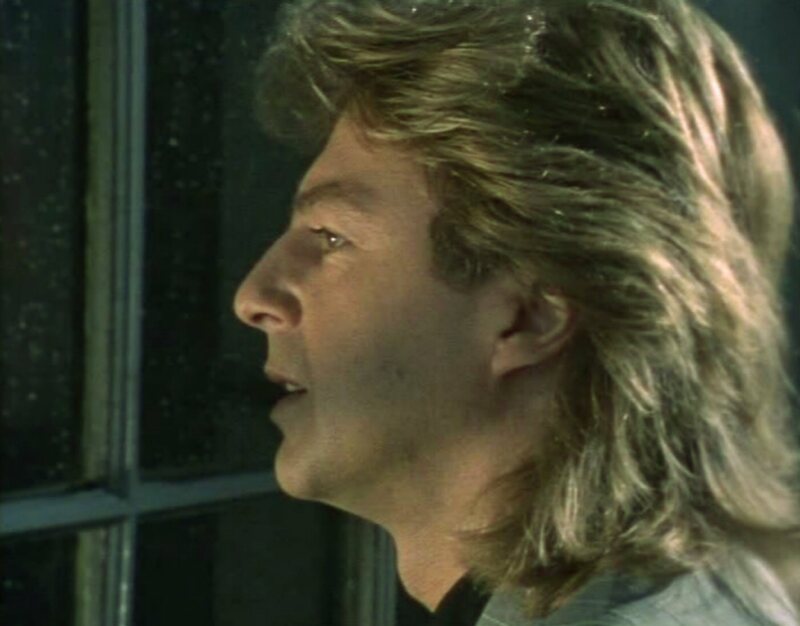 The song "Heart of Stone" had an extremely strong melody and it is still unbelievable that it reached only #50 on the UK chart. 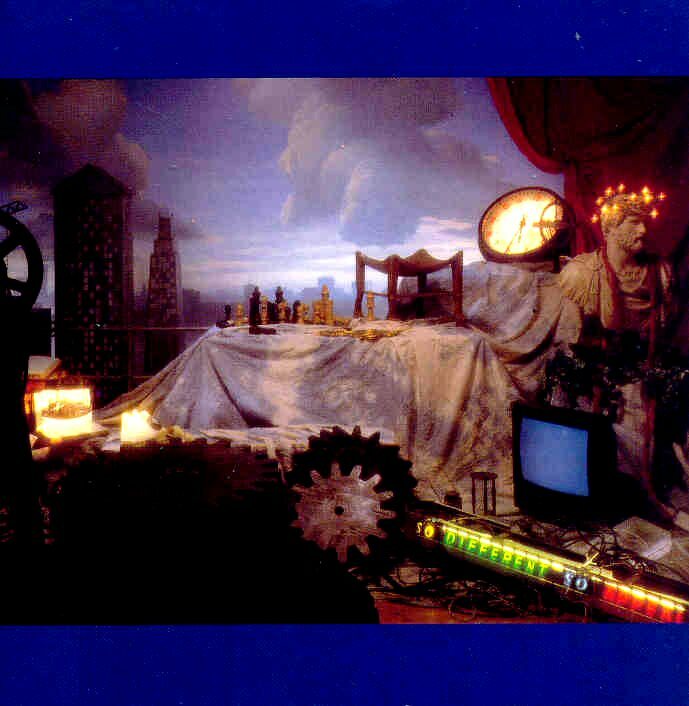 The single was released on October 24th, 1988 and it entered the UK chart on November 5th, 1988 where it stayed for 3 weeks. 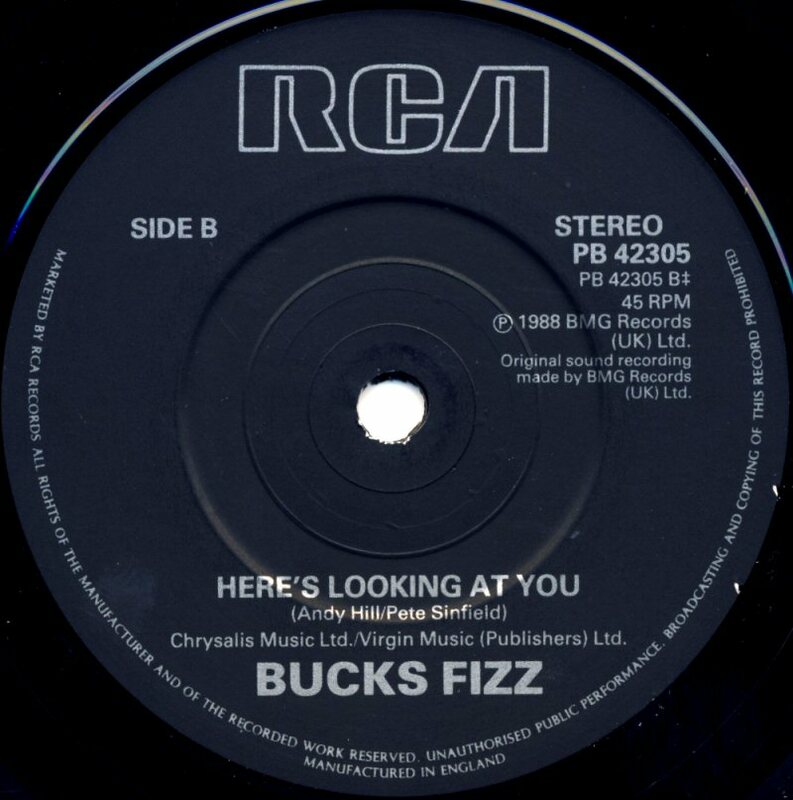 The B-side of the single featured one more great composition "Here's Looking At You". 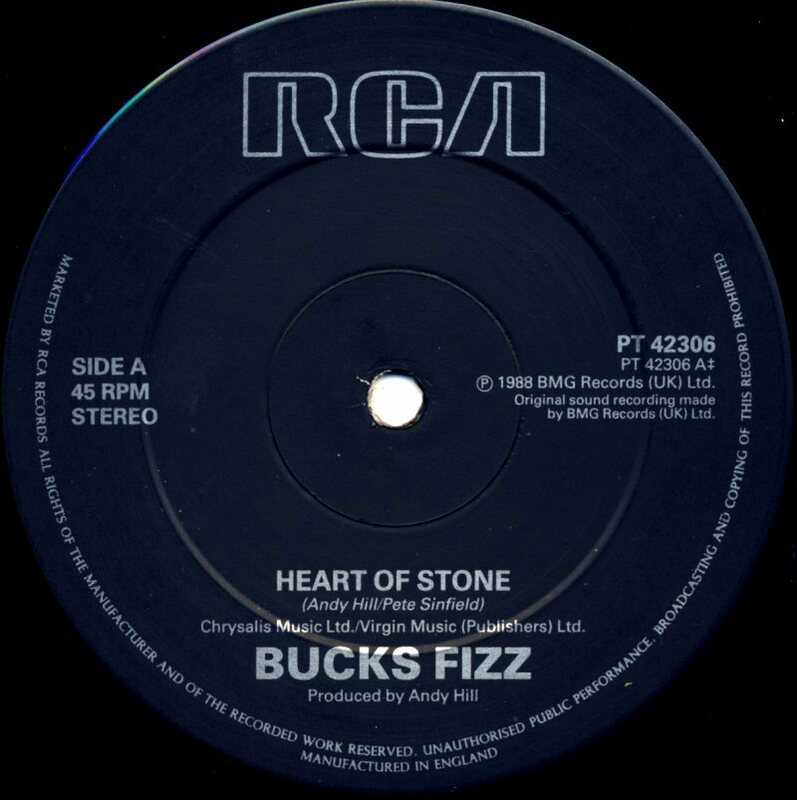 The single was even released as 12" but it contained exactly the same version of "Heart of Stone" as the 7". 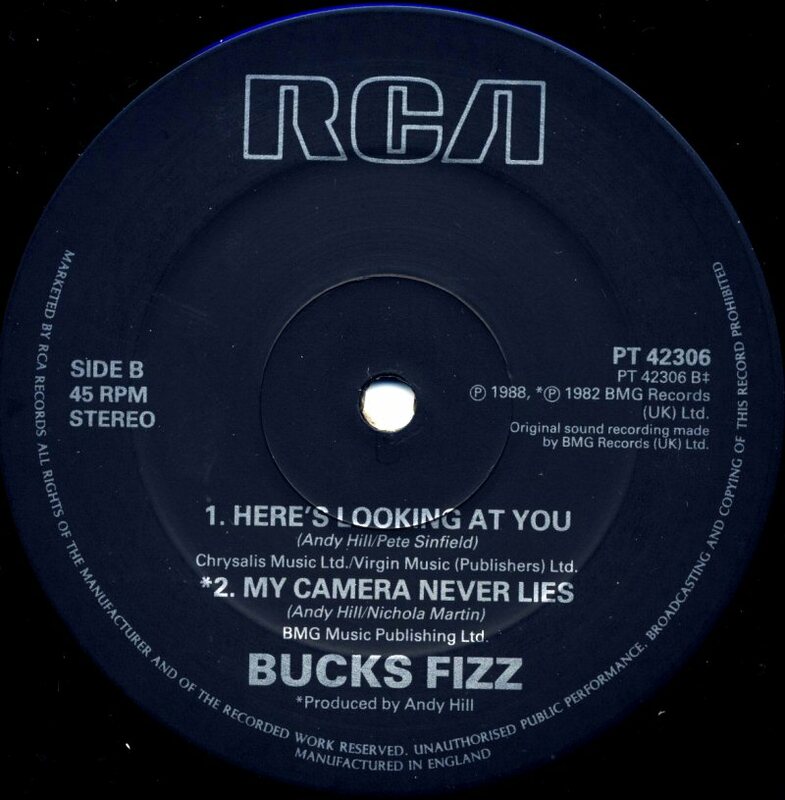 The only difference was a bonus track on the B-side, their no 1 from 1982 "My Camera Never Lies" (the LP version). The single was recorded at the famous Abbey Road Studios in London. 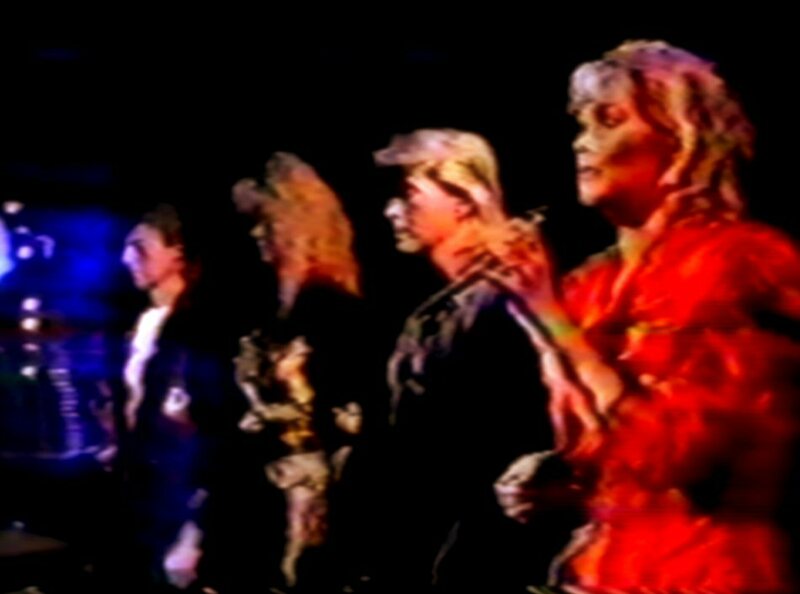 The group promoted their new single in several TV shows. 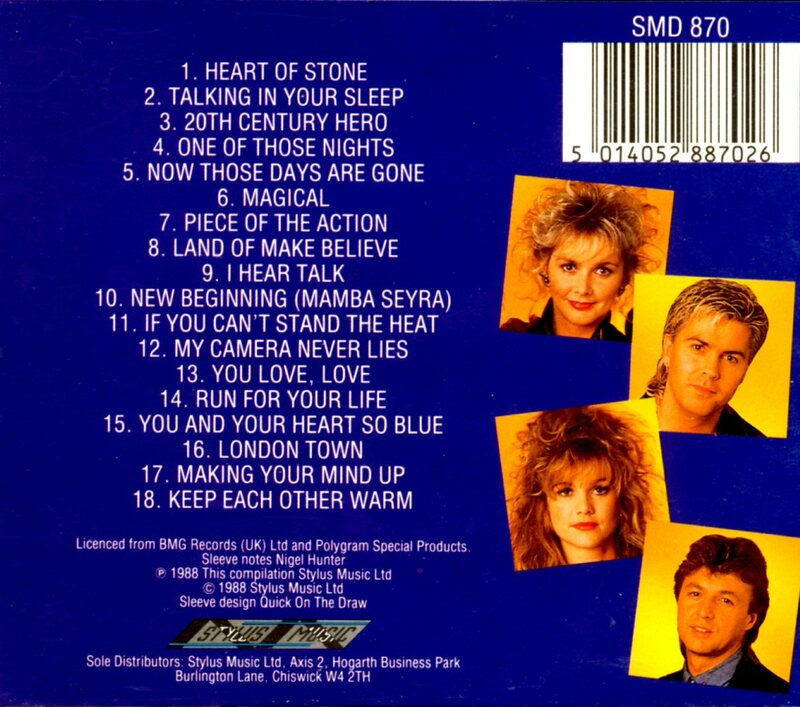 The compilation album including featuring their new single "Heart of Stone" was released in November 1988 as LP, MC and CD on the Stylus record label - which had licenced the tracks from Bucks Fizz's record companies, RCA and Polydor. 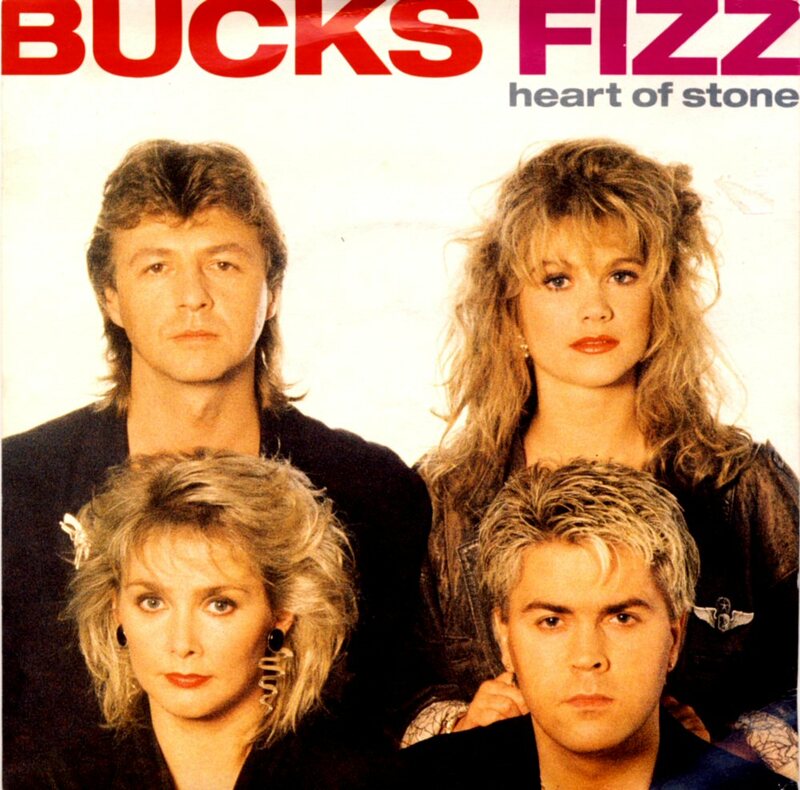 At the time, the group had just released the single, "Heart of Stone" - which became their 20th and final hit and was the only new song featured on this collection. 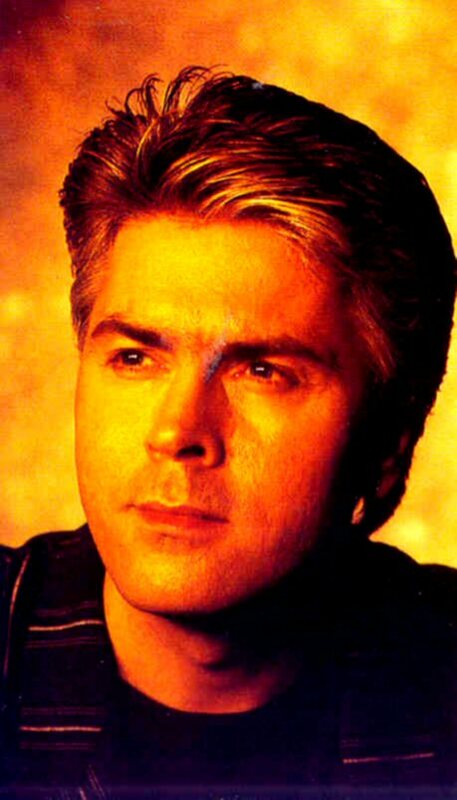 It contained 18 tracks and among them the live version of "20th Century Hero" as well as the song "You Love Love" from 1983. 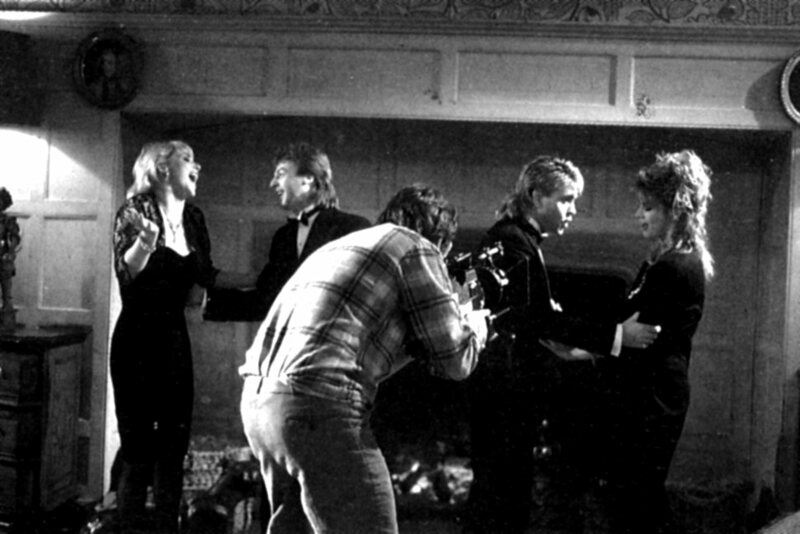 "You love love" would be released as a single at the beginning of 1989. 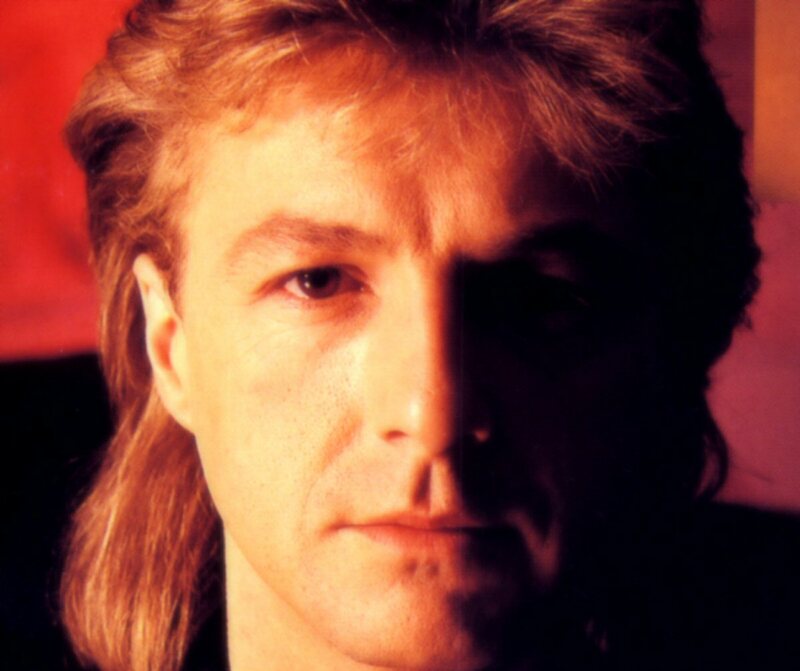 Other tracks were the bulk of the group's hit singles and two album tracks. 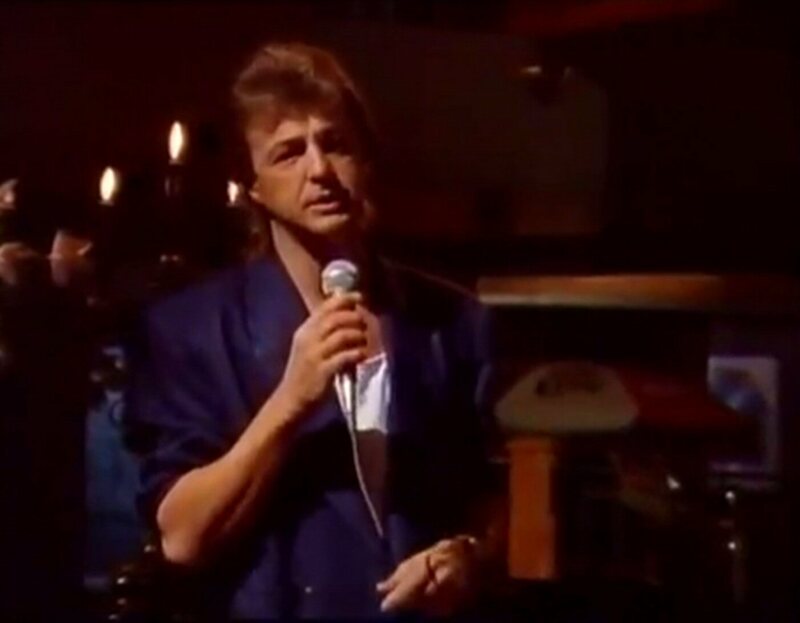 One notable omission however was "When We Were Young" - one of the group's biggest hits. 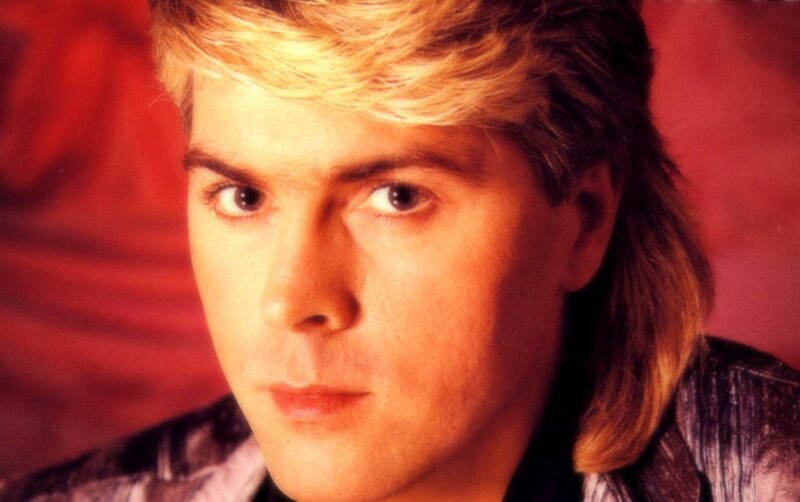 This was most likely because lead singer of the track, Jay Aston was no longer with the band. 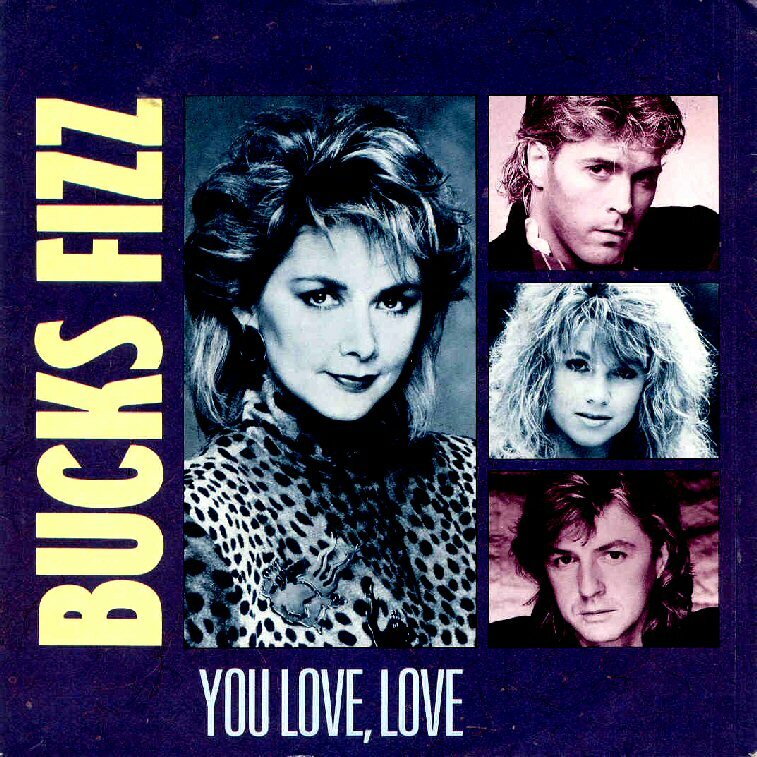 Another single, "You Love Love" from this album was released in 1989, but this was an old song from 1983 album, Hand Cut. 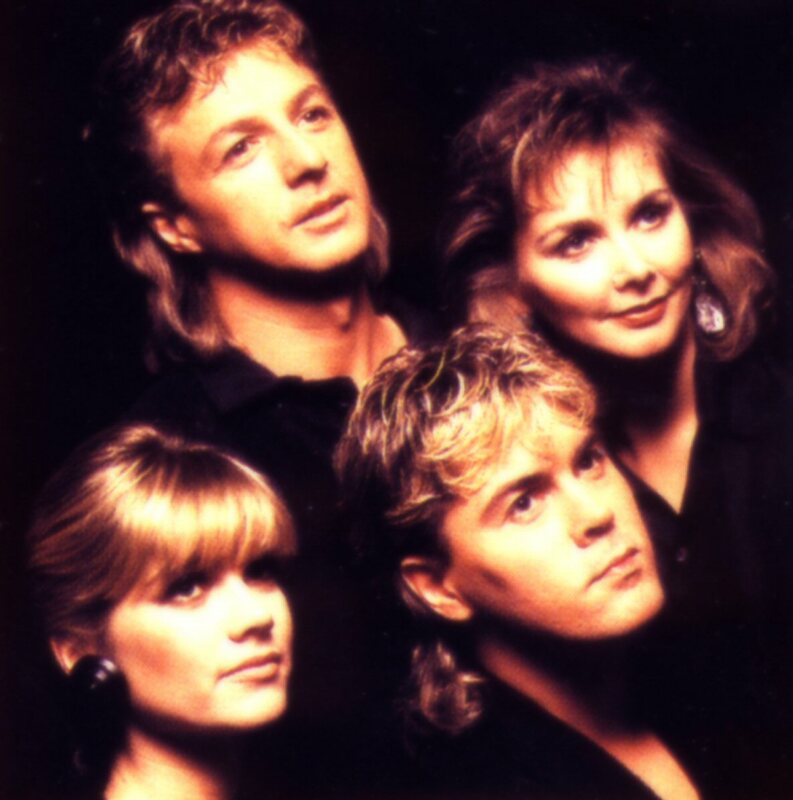 The album failed to chart despite TV advertising and was the last album Bucks Fizz released featuring this line-up. 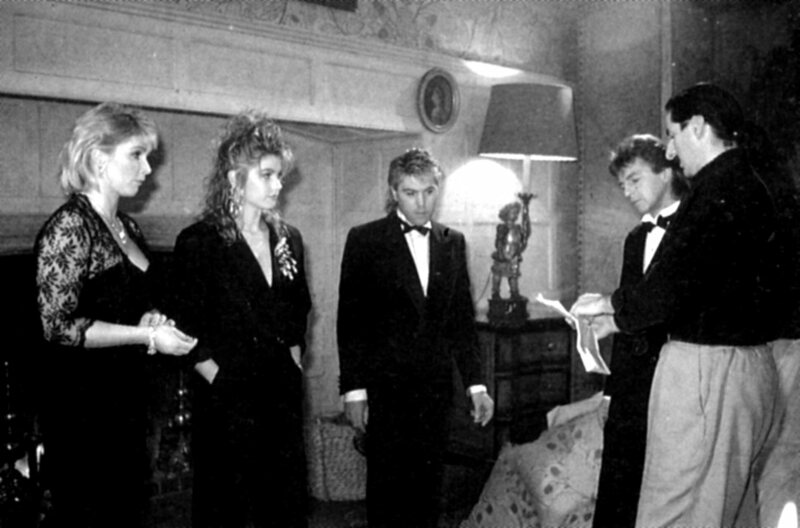 One of the last "real" photo sessions featuring all four members of Bucks Fizz was taken for the cover of the "The Story So Far" album. 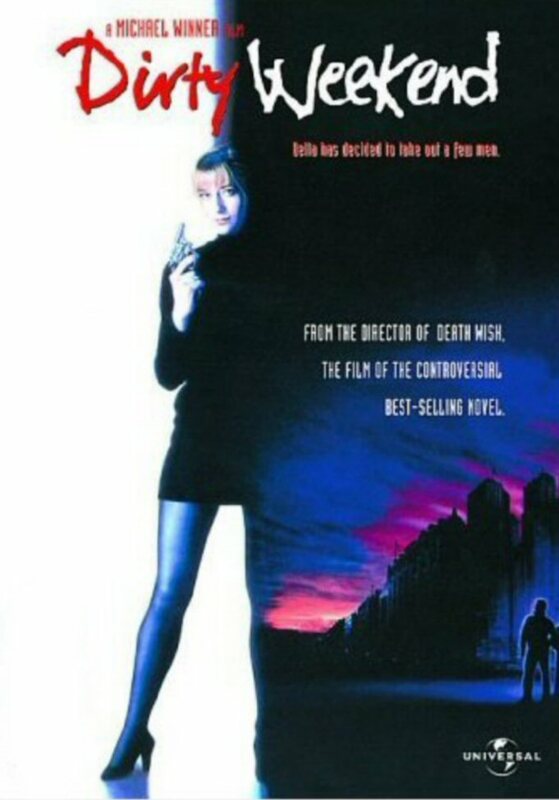 The funny thing was that the cover picture became laterally reversed. See the right version of the cover photo below. 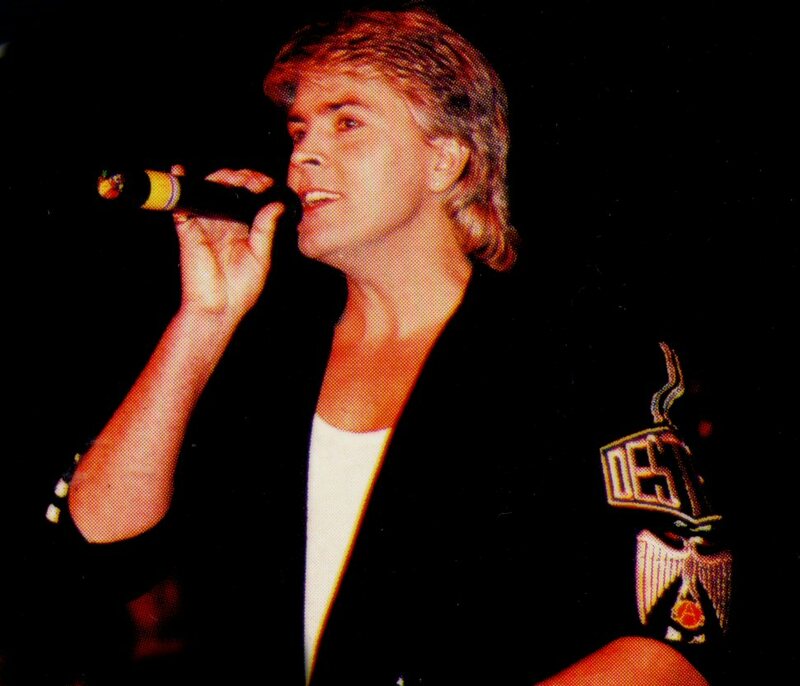 The group toured in Great Britain in autumn 1988. 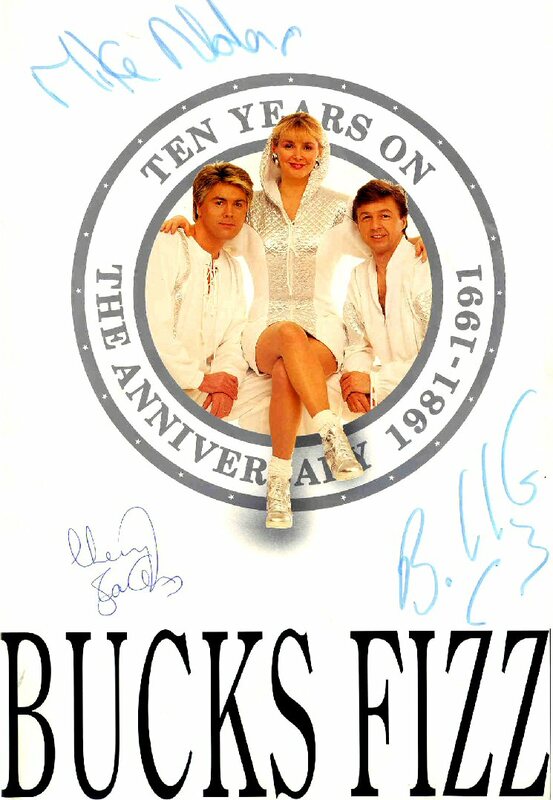 Bucks Fizz embarked on their 1989 tour on April 6th, 1989. 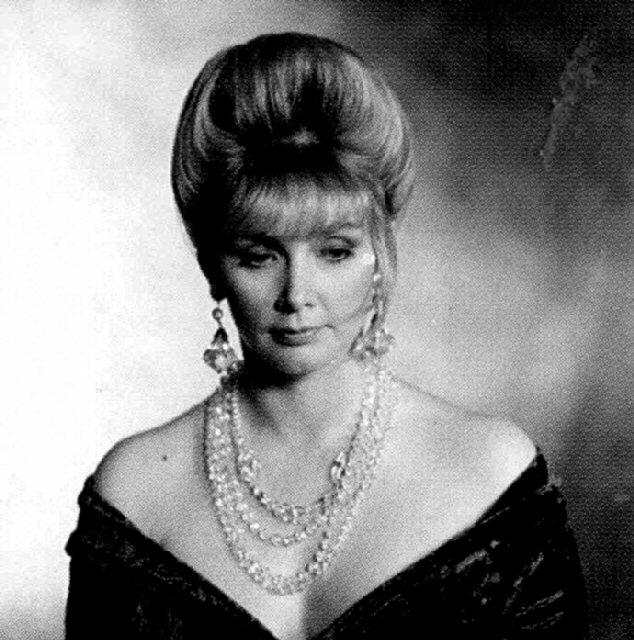 Cheryl Baker worked more and more on TV even if she was still very much part of Bucks Fizz. 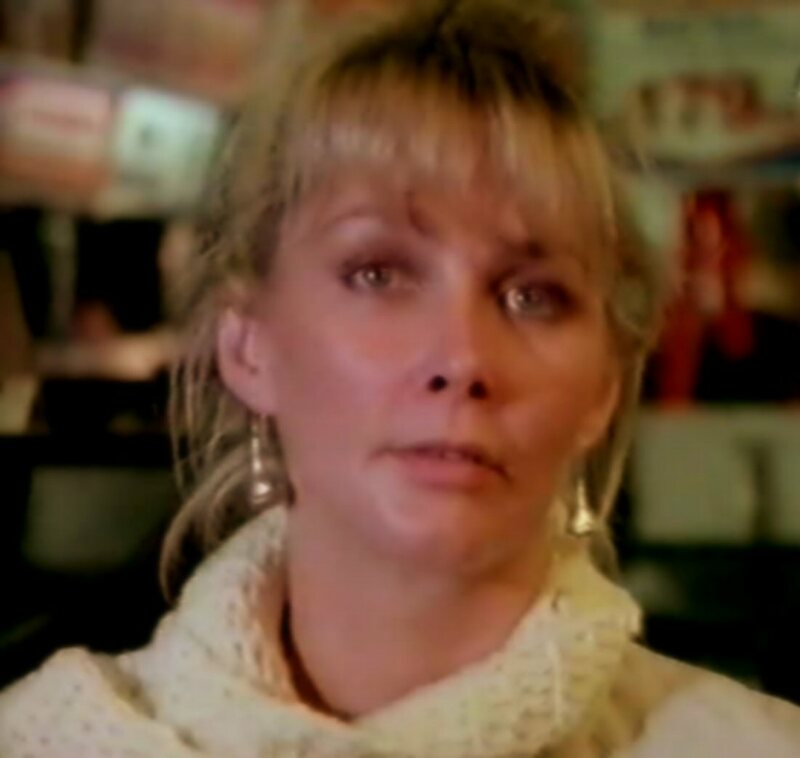 From April 15th, 1989 she hosted her own Saturday night show on ITV called My Secret Desire, a sort of adult Jim'll Fix It. 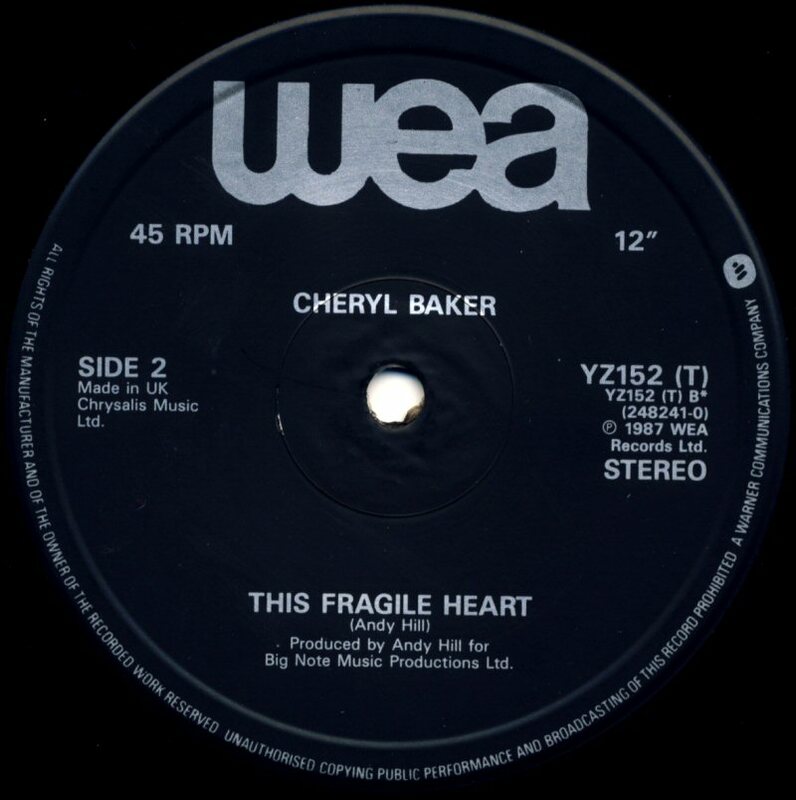 As a part of the promotion of "The Story So Far" album RCA released in May a new single containing the song "You Love Love" originally recorded for the album "Hand Cut" in 1983 and performed by Cheryl. 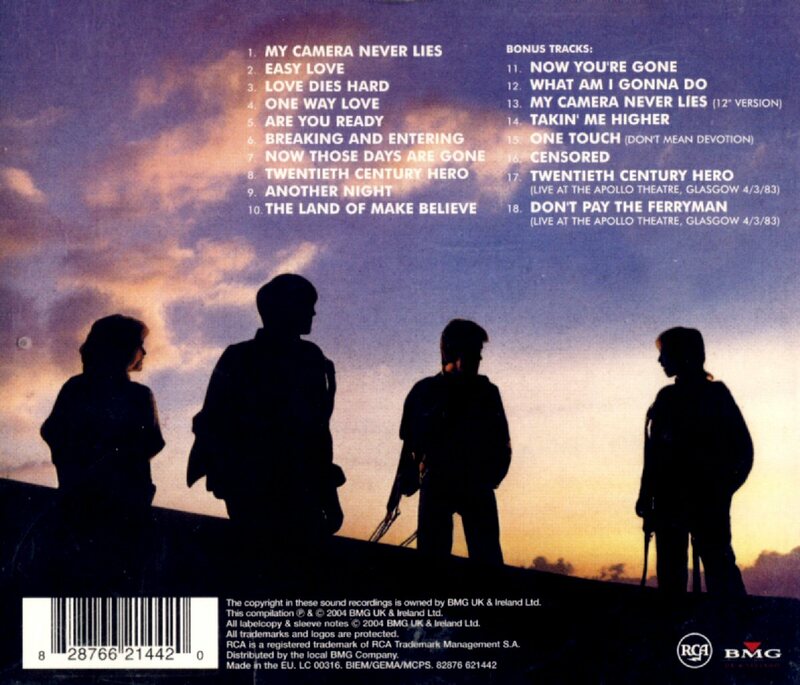 On the B-side there was a live version of "20th Century Hero" - a track from the "Are You Ready" album. 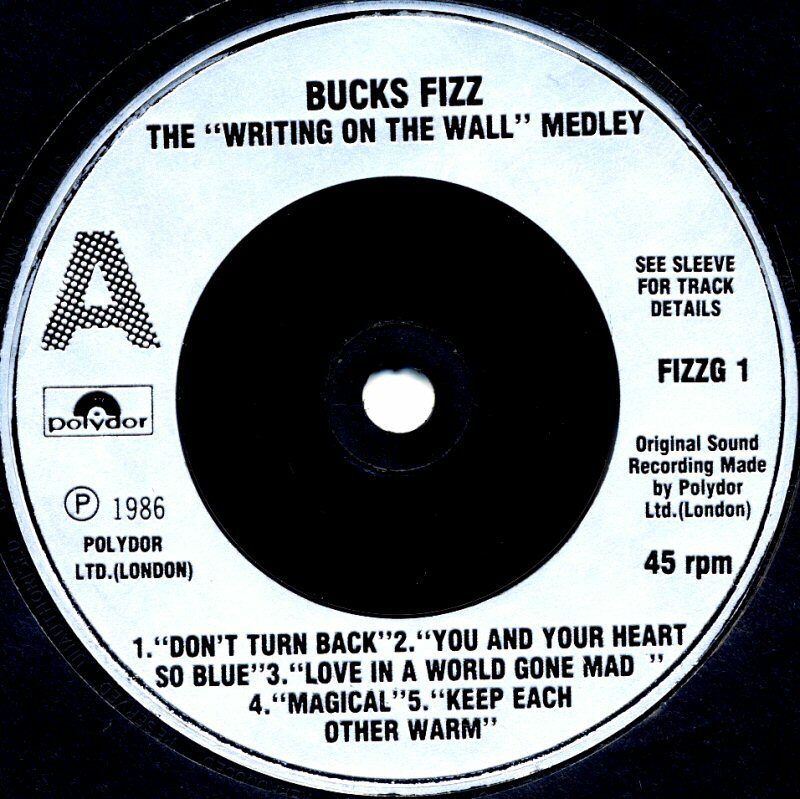 Bucks Fizz promoted the single in some TV shows but the single did not make the British chart. 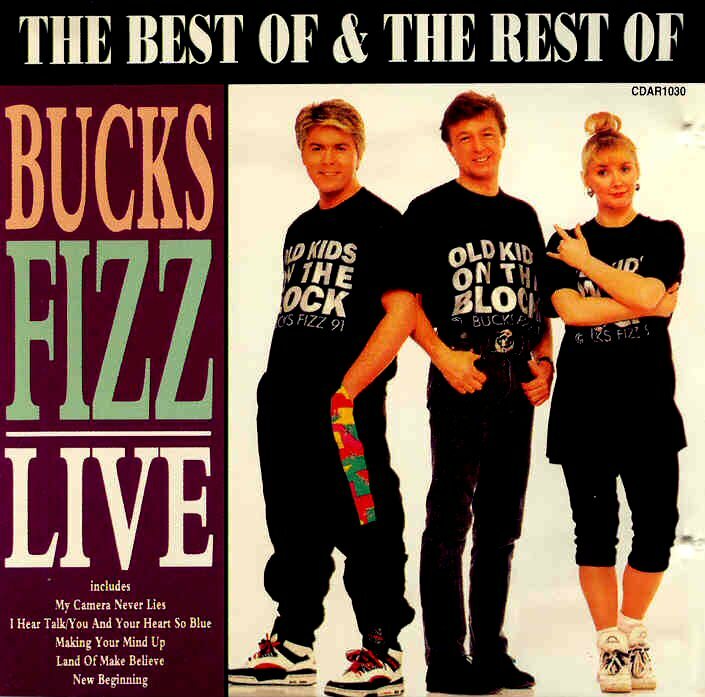 Bucks Fizz recorded their live album as a trio (Cheryl, Bobby & Mike) at the end of 1990 during their concert in Croydon outside London. 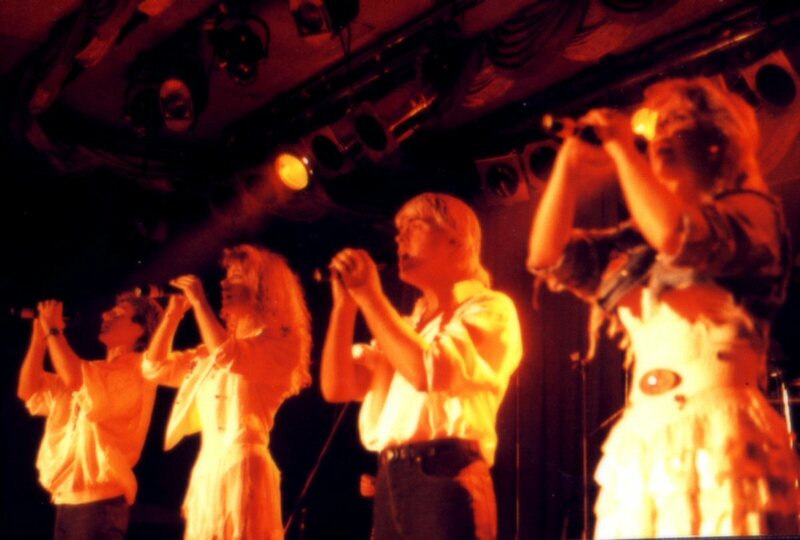 The live album confirmed that the singers were vocally very strong even if they performed as a trio. 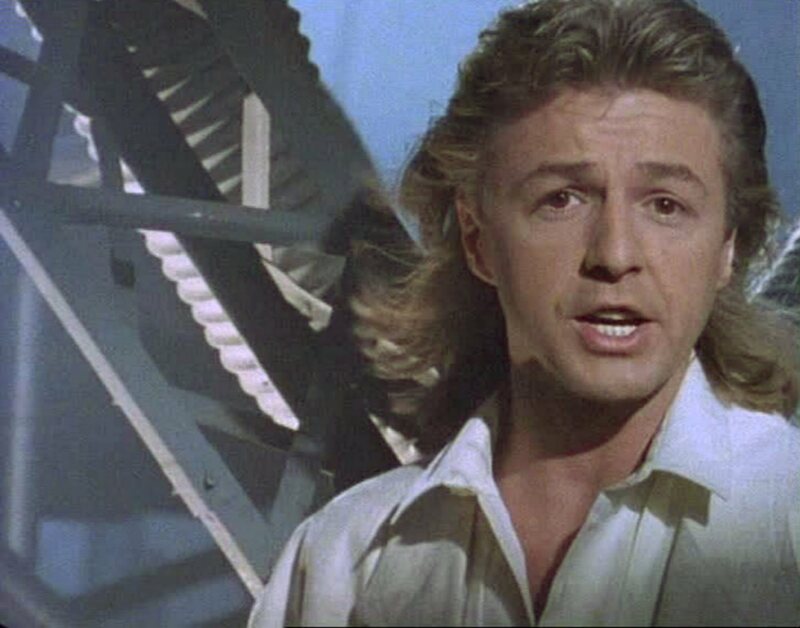 The album did not enter the British chart but it became one of the fan favorites anyway. 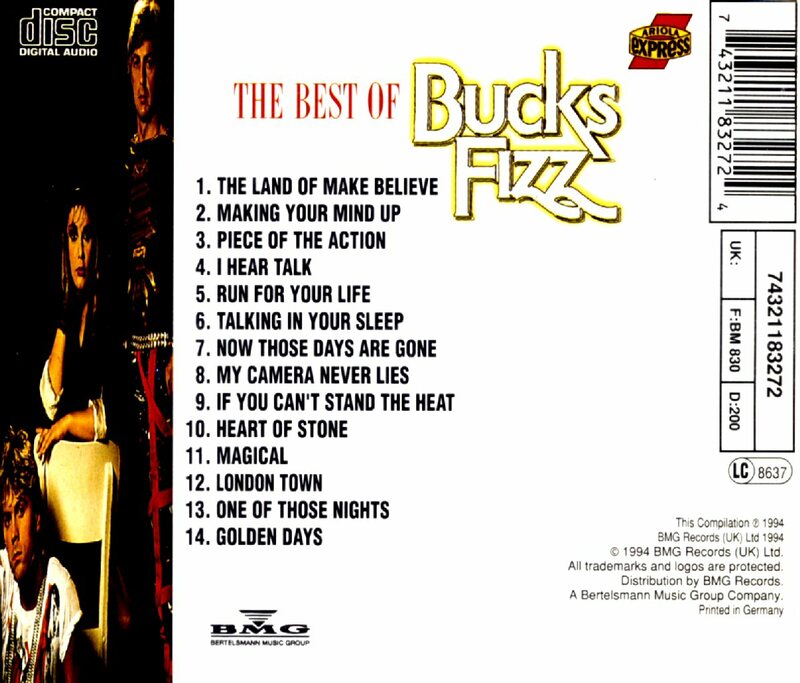 The first edition of the album contained 13 songs including all Bucks Fizz classics as: The Land Of Make Believe, New Beginning, My Camera Never Lies, I Hear Talk and of course Making Your Mind Up. 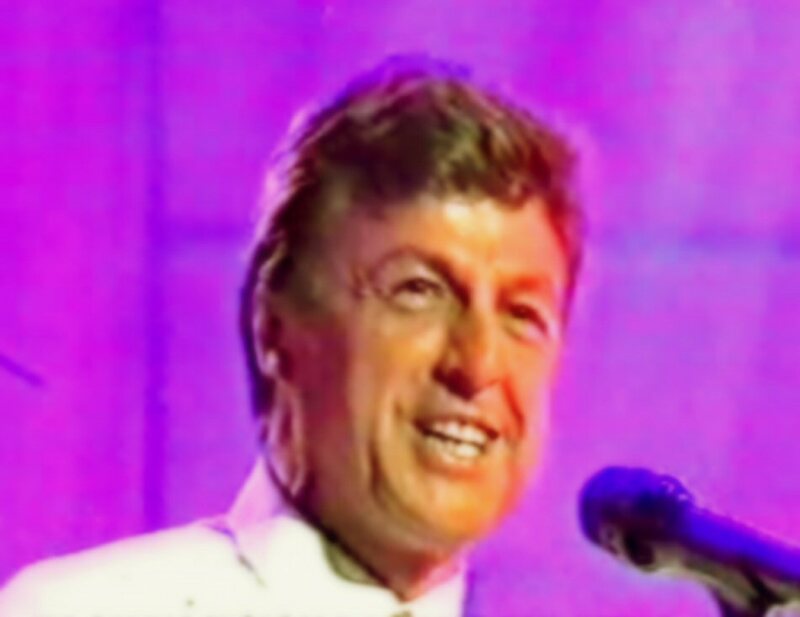 As a non-active studio group they did not perform any new own material but several covers of well-known hits as: You're the Voice, A Groovy Kind of Love, and I Knew You Were Waiting. 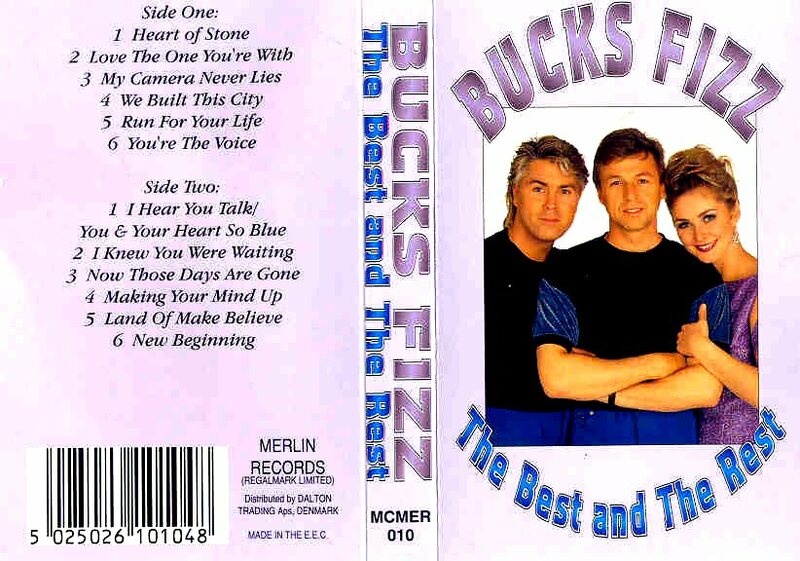 Surprisingly the later editions of the album entitled "The Best and The Rest" did not include A Groovy Kind of Love (sung by Cheryl). 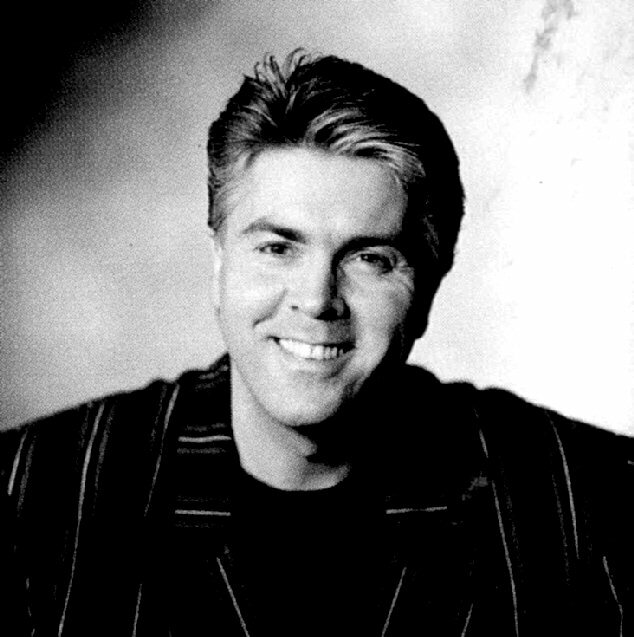 The album was released in 1991 as LP, CD and MC. 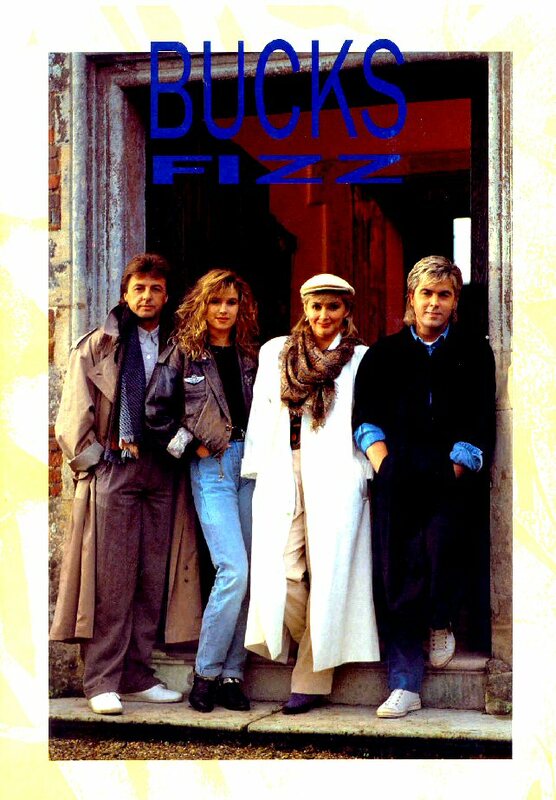 In 1991 Bucks Fizz celebrated the 10 years anniversary as a group. 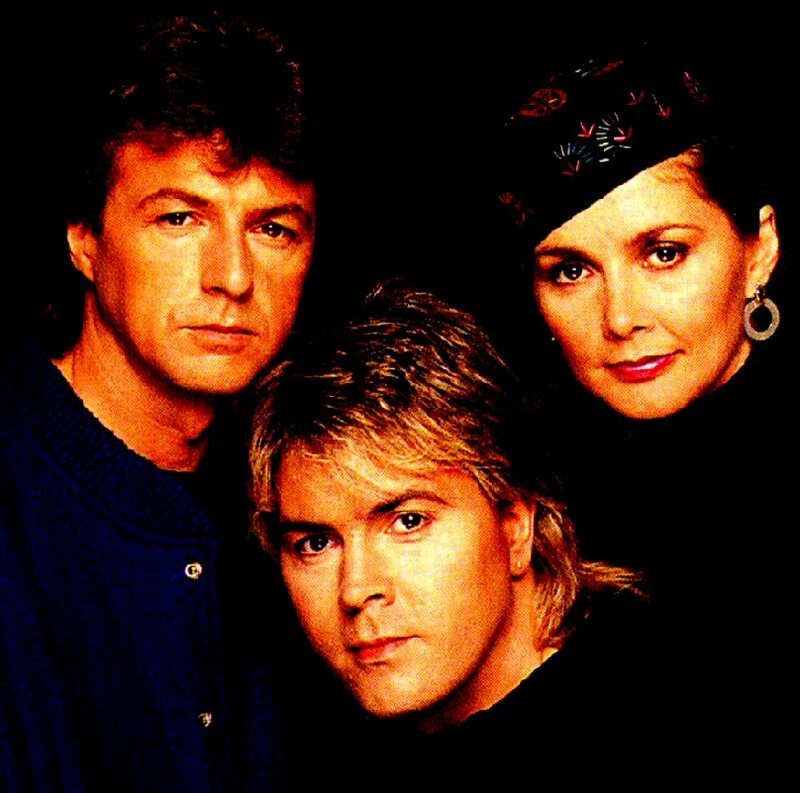 They got together for a gig in Great Britain as a trio (Shelley had left the group in 1989). 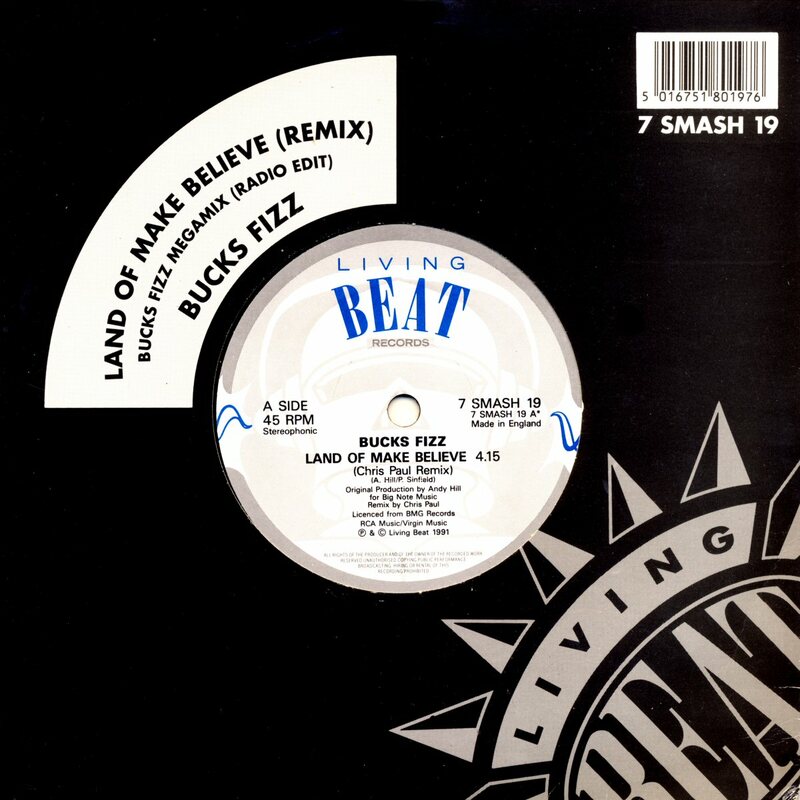 A remixed version of "The Land Of Make Belive" was released by "Living Beat Records" in 1991. 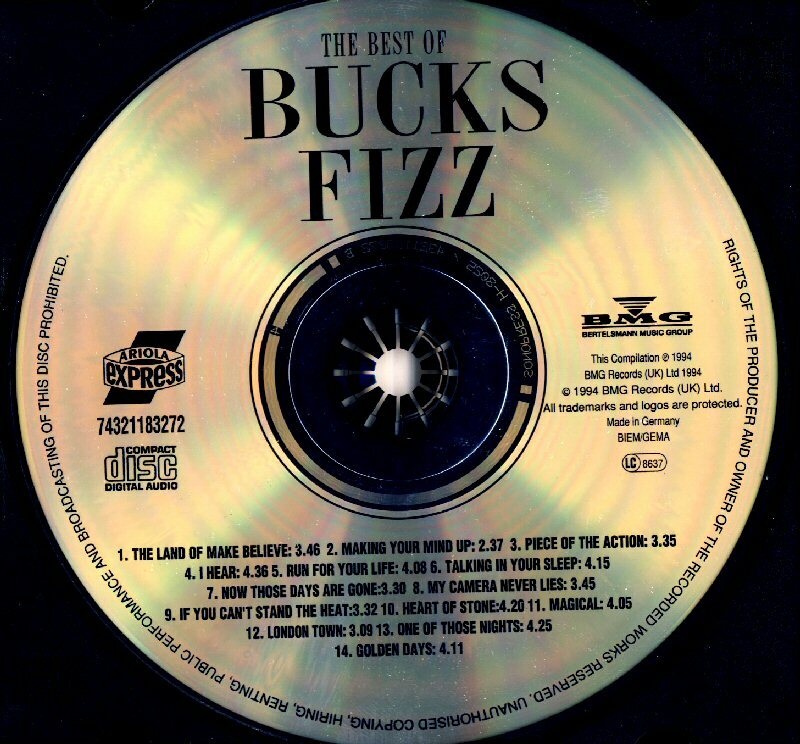 The single featured the Chris Paul Remix on the side A and the Bucks Fizz megamix on the side B. 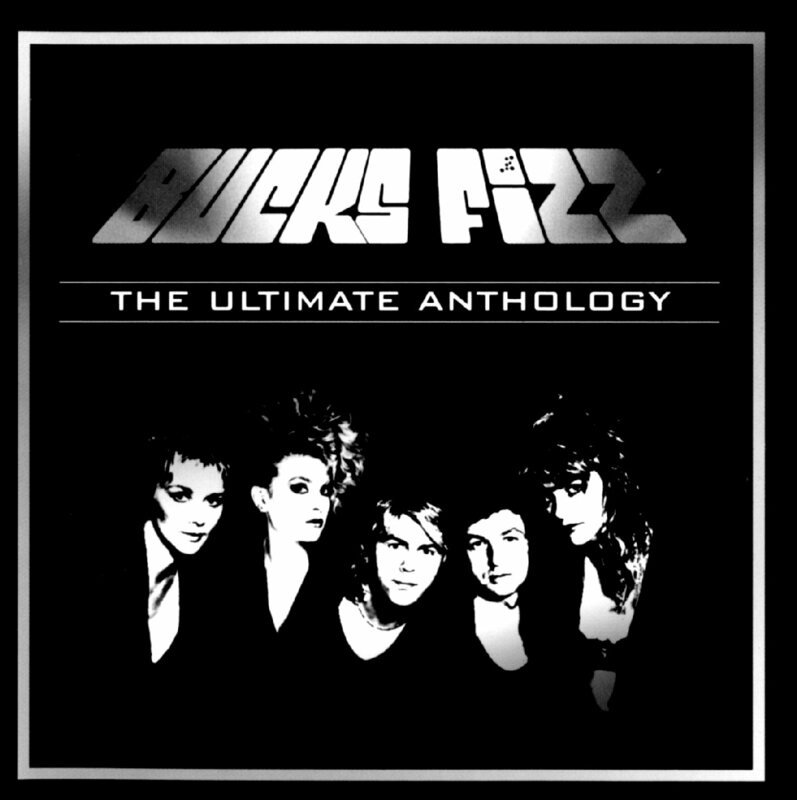 The version of "The Land of Make Believe" would appear on the 2006 compilation "The Ultimate Anthology". 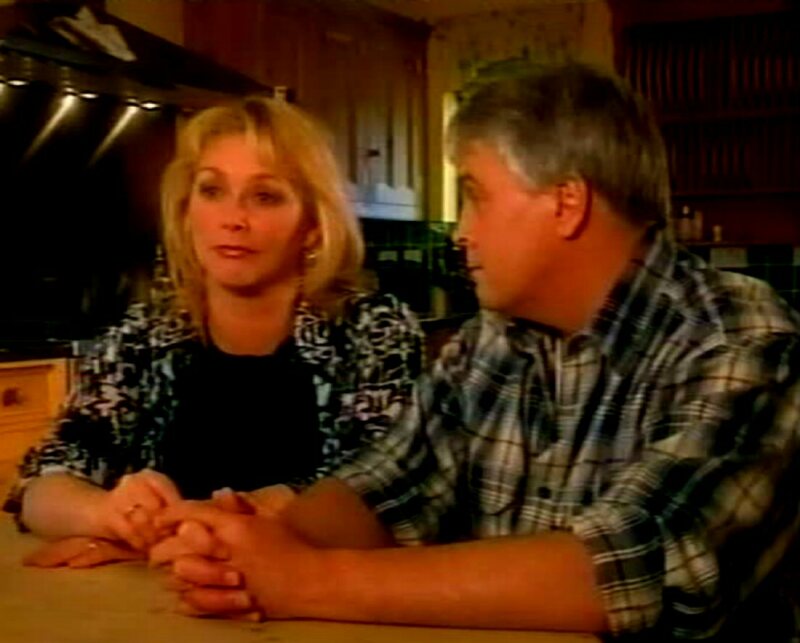 In 1992 Mike and Cheryl appeared in a British talk show "Fighting back" where they were remembering the bus crash in 1984 and Mike's long recovery after his damages. 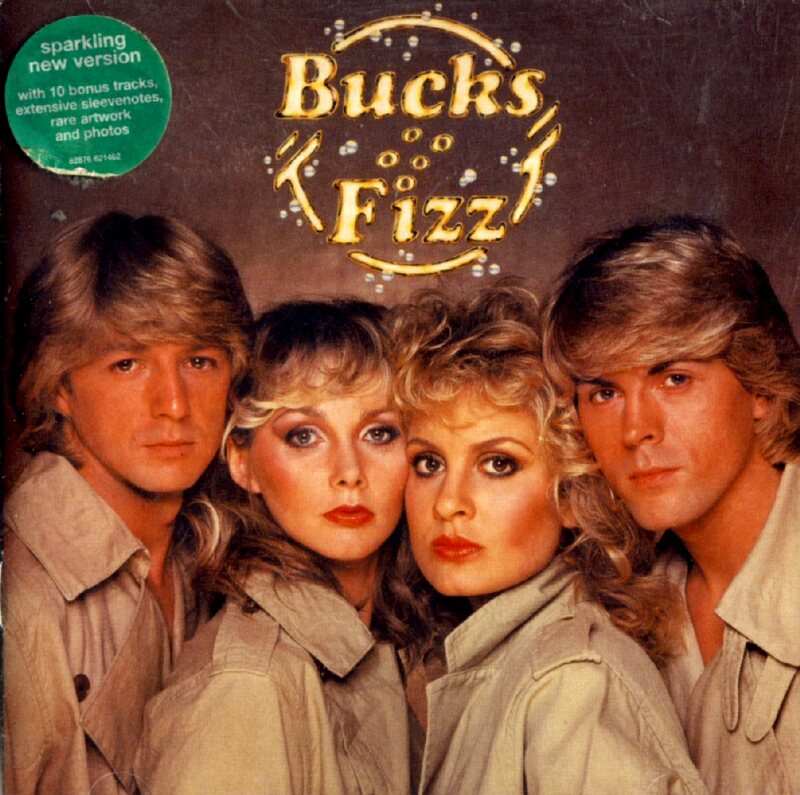 They did not talk about Bucks Fizz. 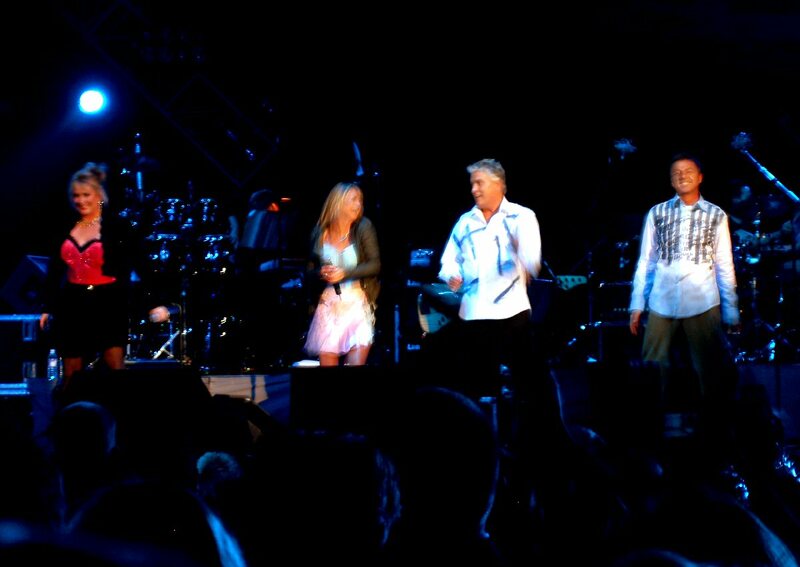 Bucks Fizz as a group did not exist any more but Cheryl, Mike and Bobby performed occasionally anyway. 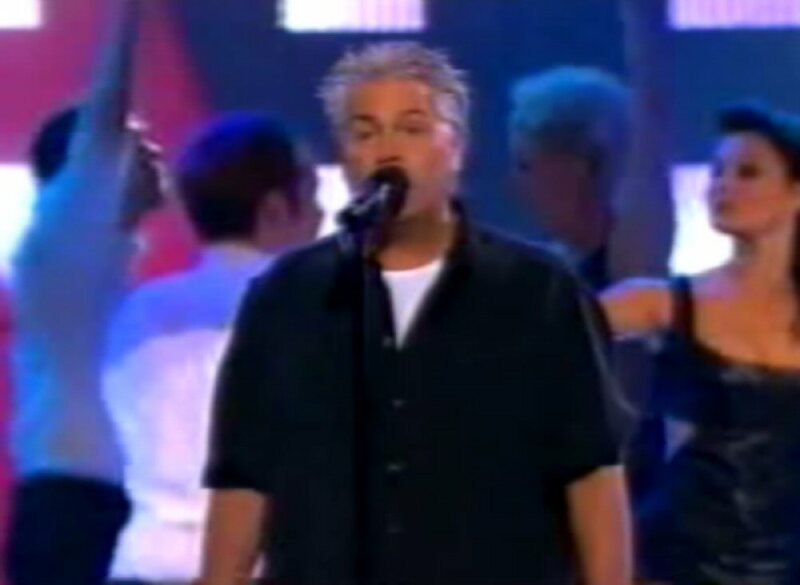 One of the rare appearances was in the TV show "Telethon" where they performed "The Land Of Make Believe" live. 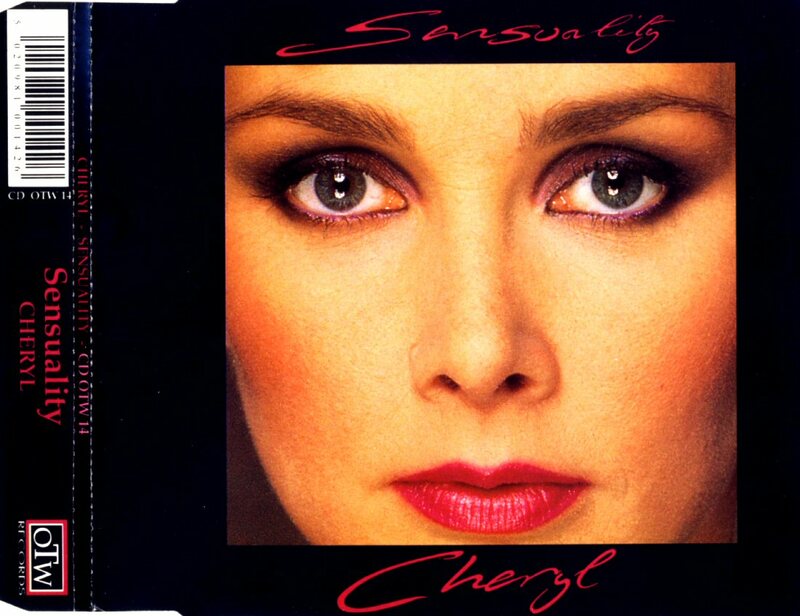 Cheryl reactivated her solo career in 1992 by releasing a new solo single: "Sensuality" b/w "Love To Love". 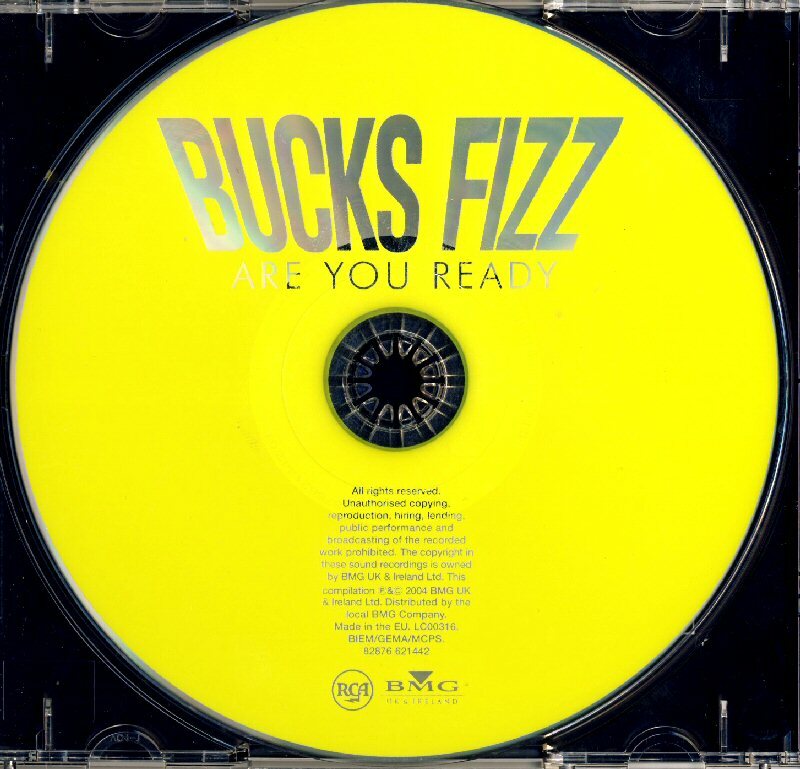 The single was released as 7", 12" and CDS. 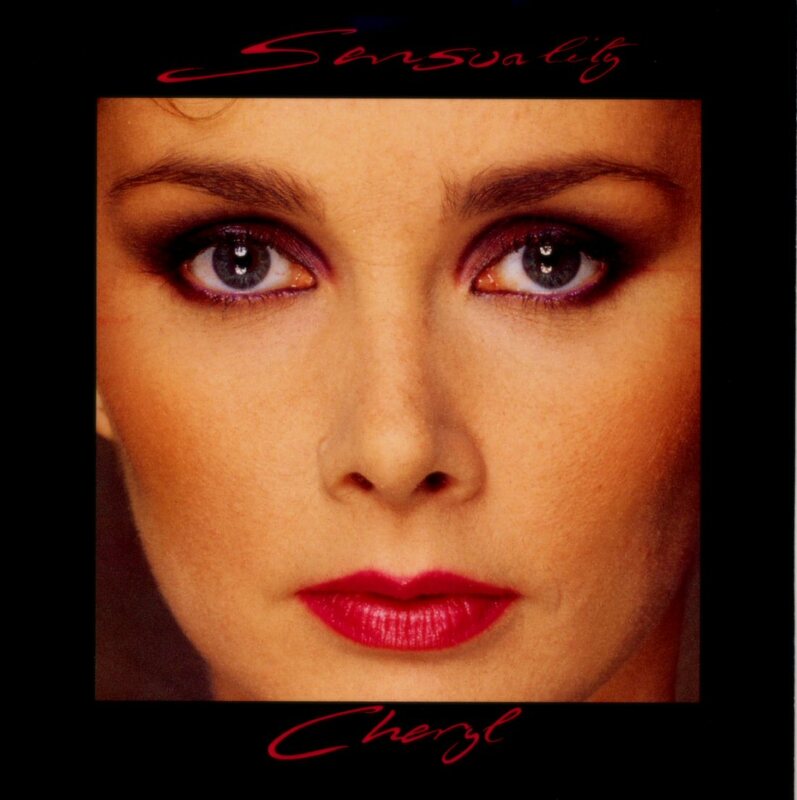 "Sensuality" did not enter the UK chart. 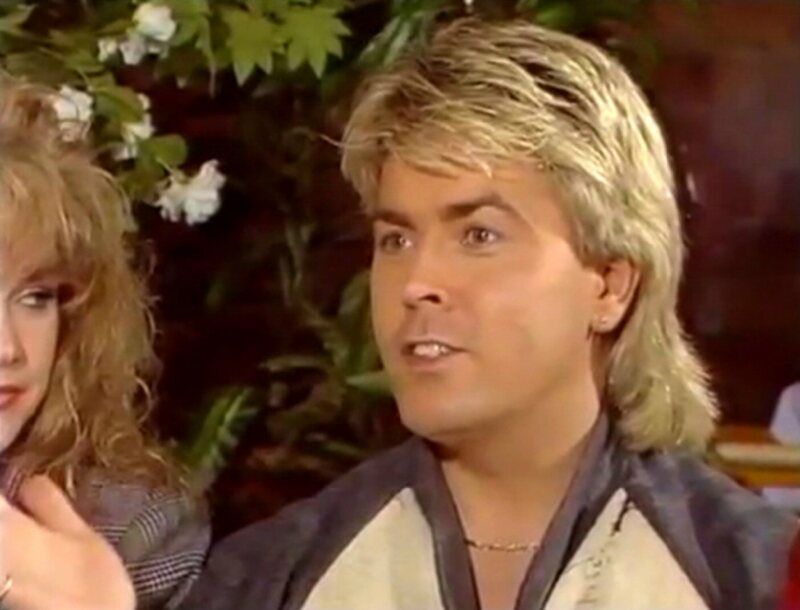 At the beginning of 1990s Cheryl became more and more TV personality than a Bucks Fizz singer. 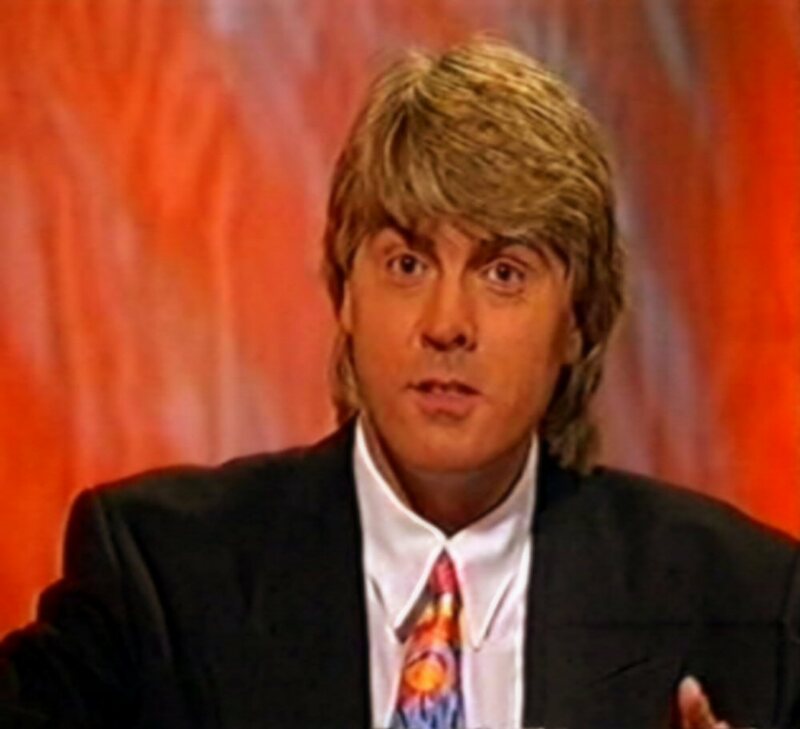 She hosted several shows on BBC like "Record Breakers" and "Egg's'n'Baker". 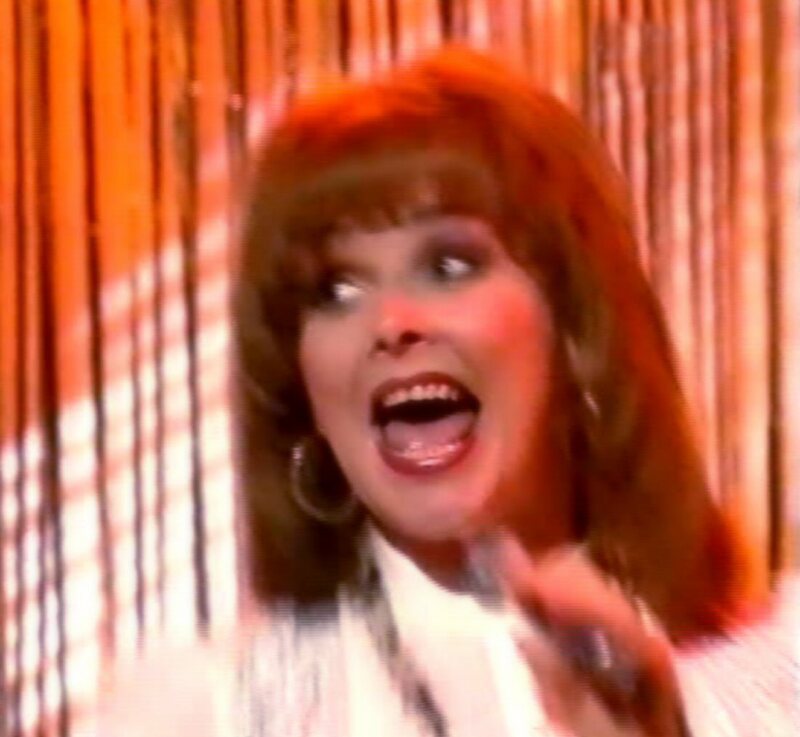 In each show she performed one song, usually cover of a well-known world hit. 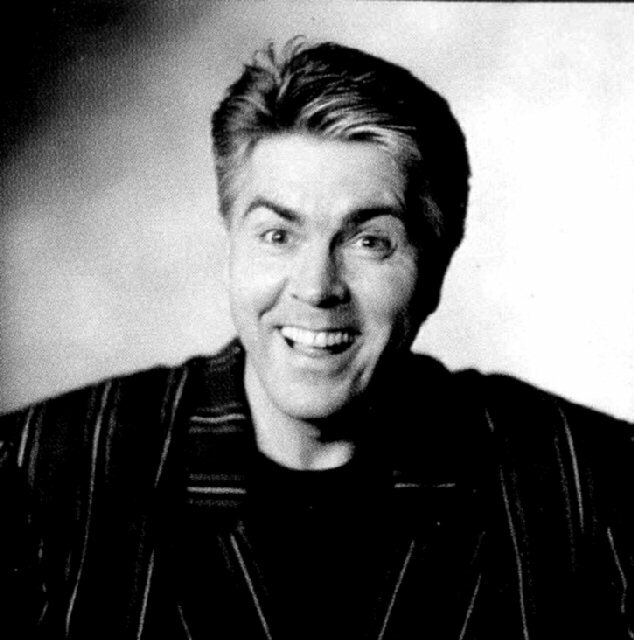 Jay recorded a song "Wish I Was Here" written by Mark Smith for Michel Winner's movie "Dirty weekend" that had its premiere in 1993. 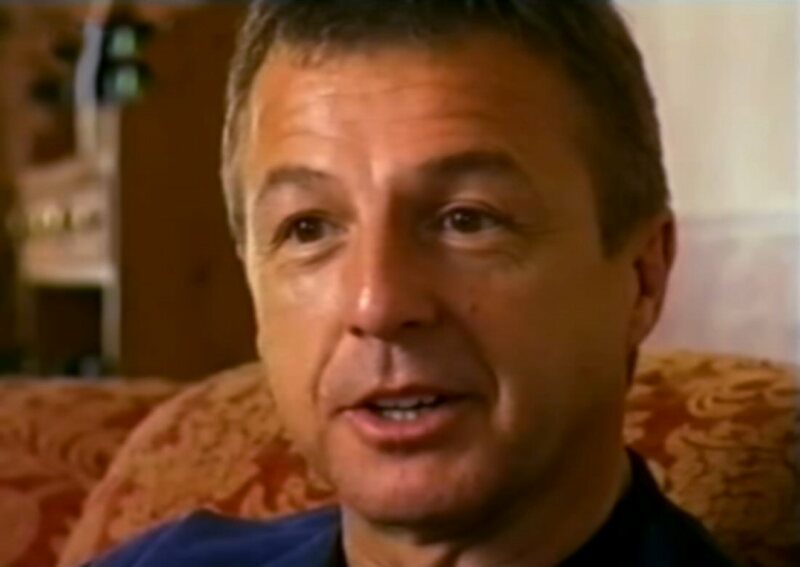 On August 1st, 1993 Cheryl, Mike and Bobby appeared live on GMTV where they performed "We Built This City". 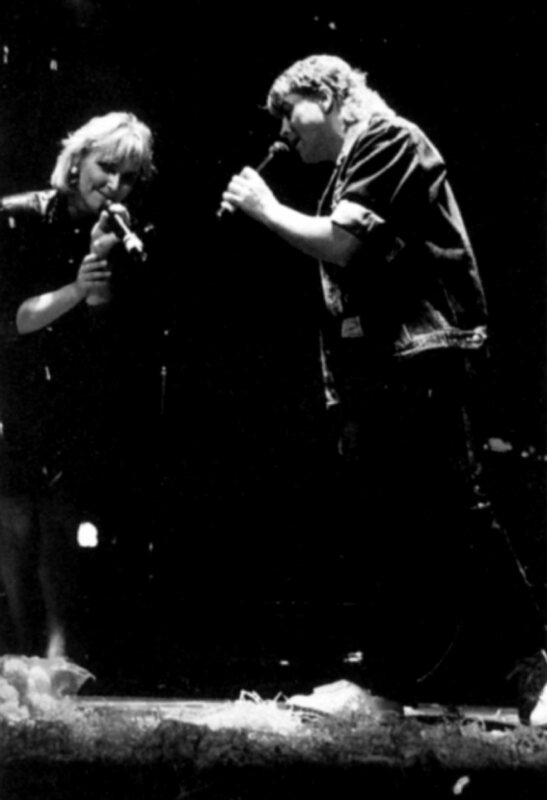 It was one of their last appearance together in the 1990s. 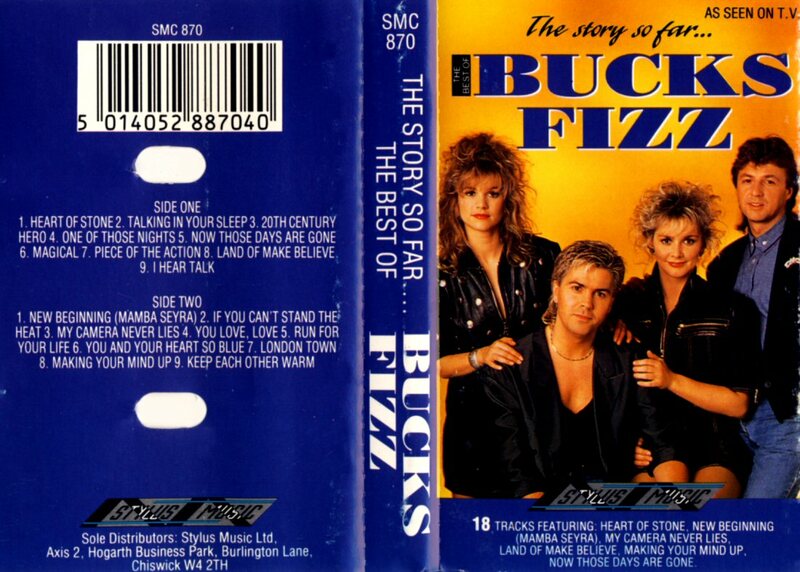 The year 1994 was absolutely not interesting for Bucks Fizz fans. 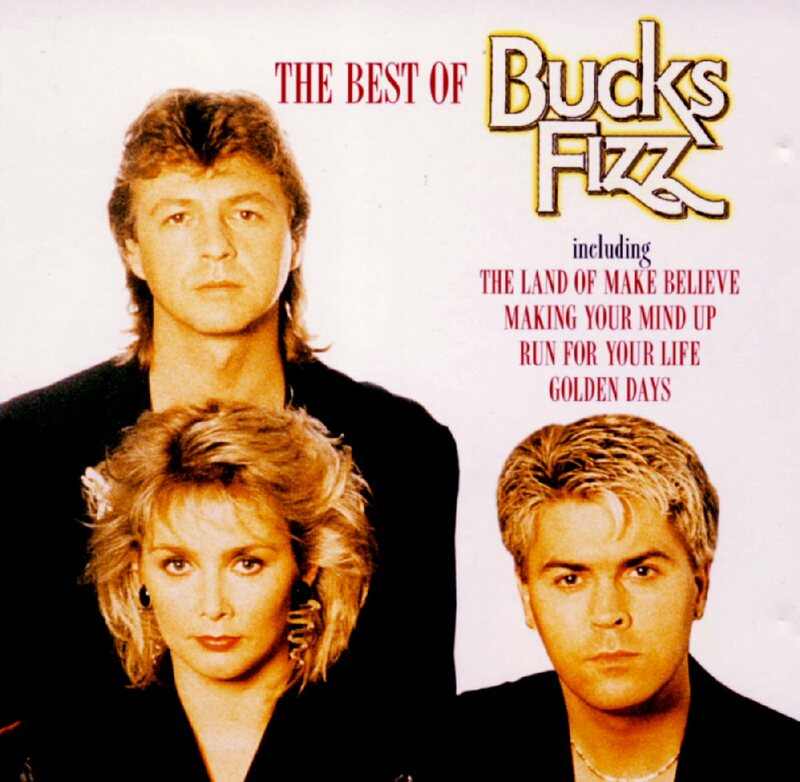 The members of the group Cheryl, Bobby and Mike did their own projects and the only Bucks Fizz related release this year was a new compilation CD "The best of Bucks Fizz". 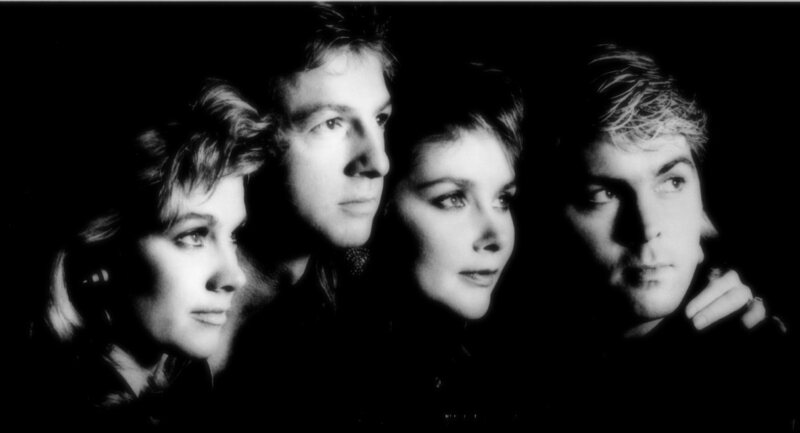 The cover featured a picture from the 1988 Magical photo sessions and the only difference was that Shelley had been removed from the picture and the group was officially a trio. 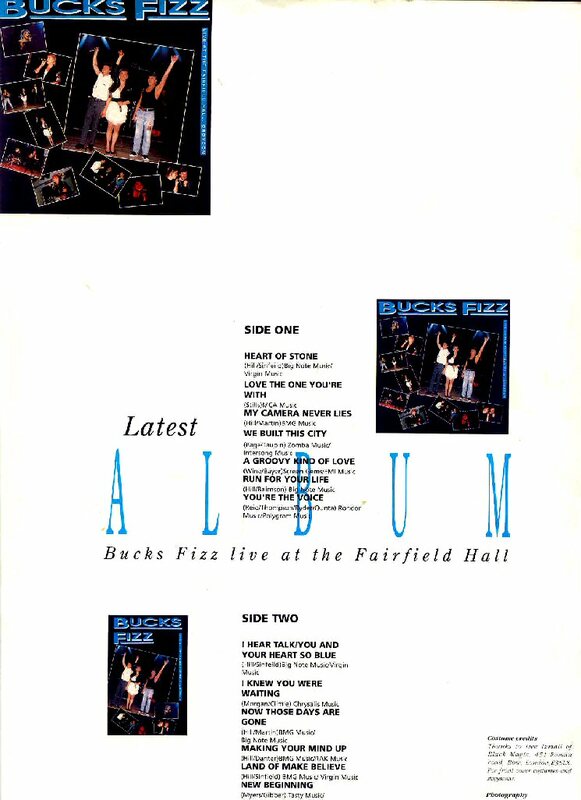 The track listing contained all BF great hits excluding though "When We Were Young" as it had been performed by Jay in lead vocals. 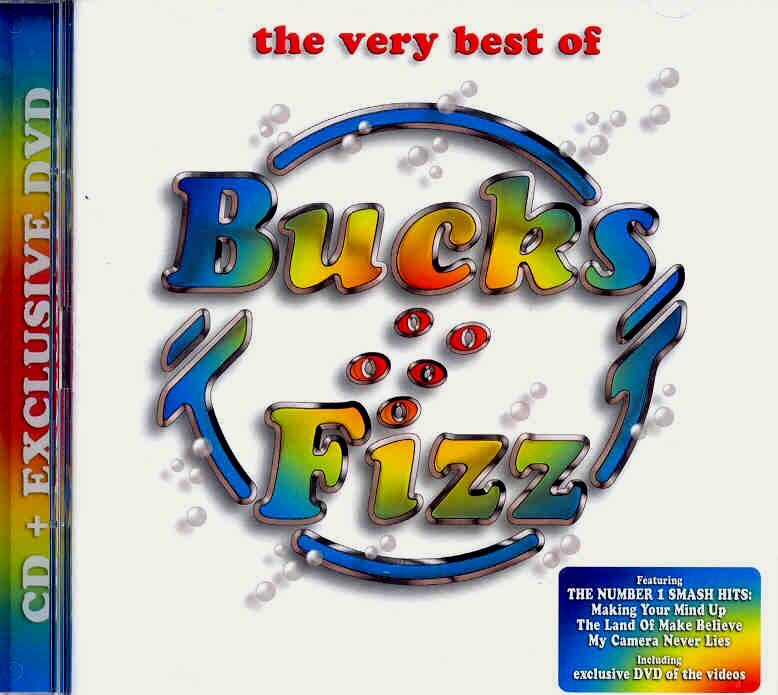 Totally 14 songs were included on this CD. 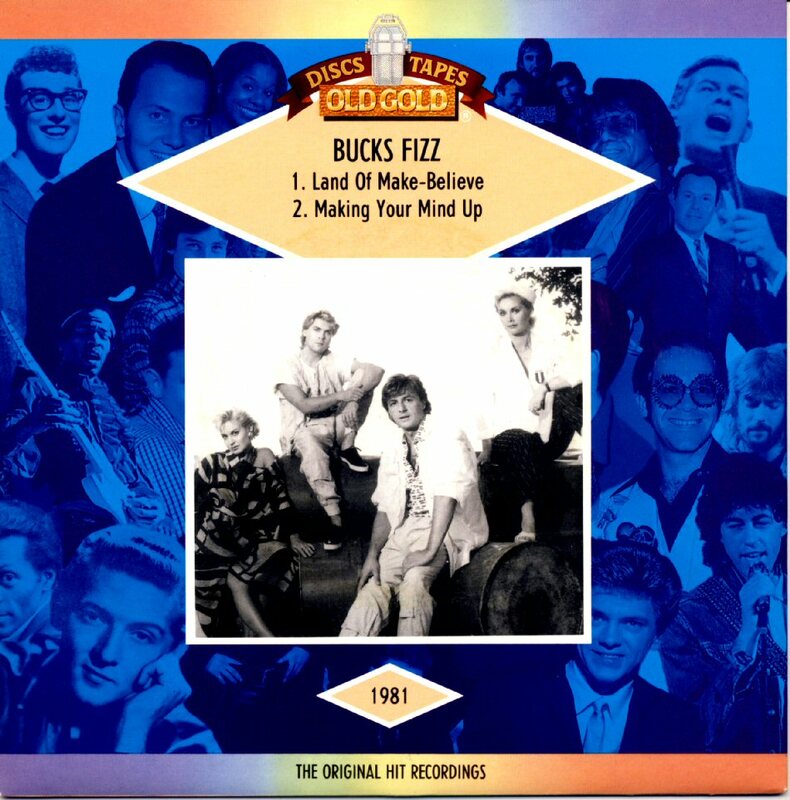 "The Land of Make Believe" was the third single by the British band allSTARS*. 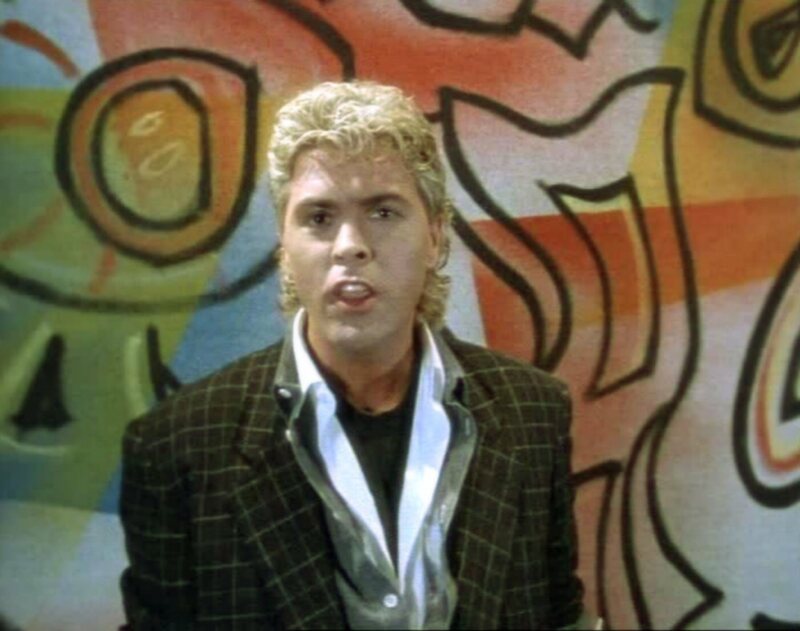 The single was slightly faster than the original version and had a more euro-pop sound. 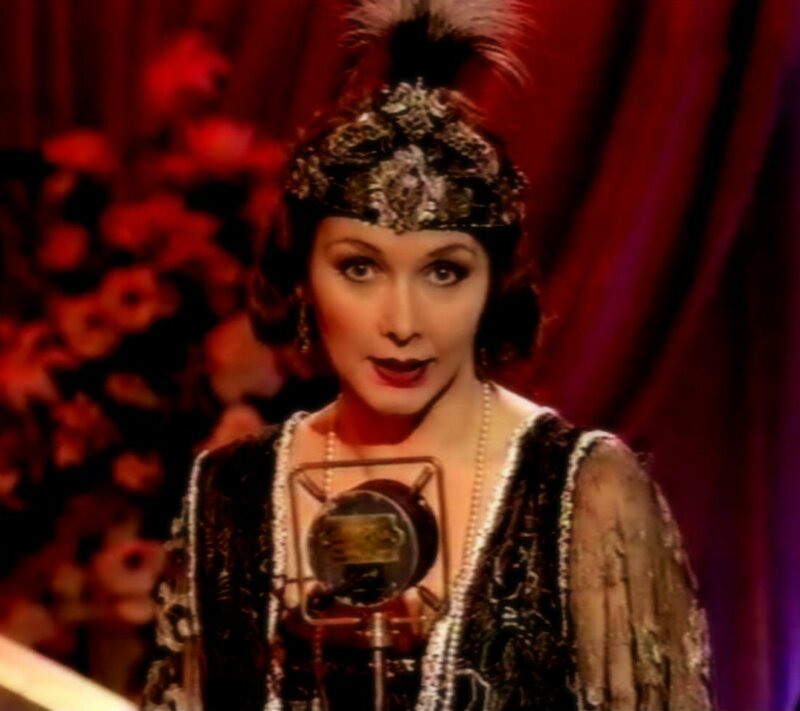 The music video was set in a circus tent, with each individual member of the band performing tricks e.g. being cut in half, levitating or juggling. 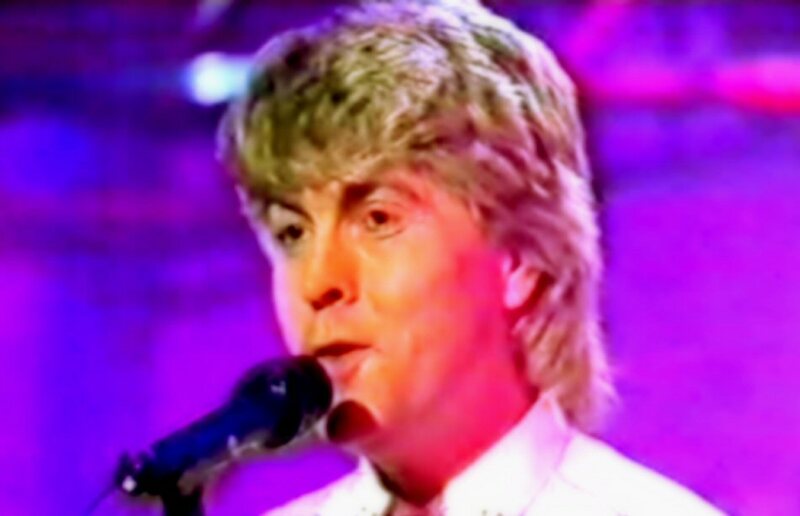 The single performed to moderate success, achieving allSTARS*' highest UK chart position of No.9. 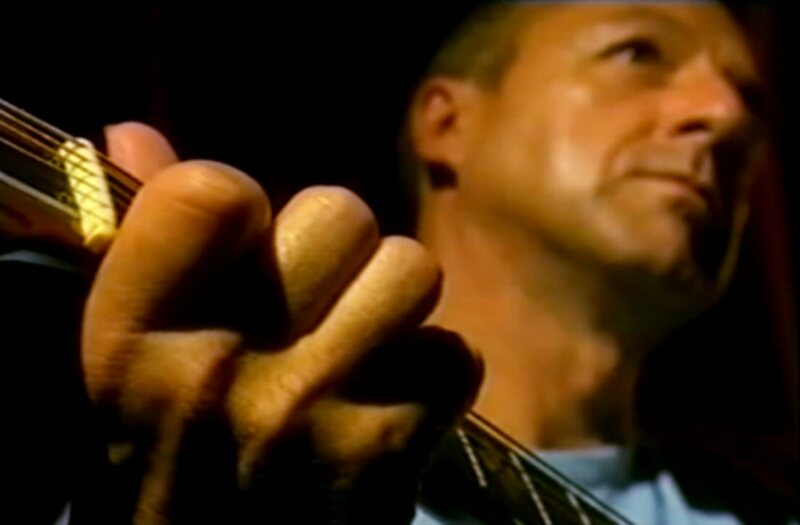 The single was released on January 14th, 2002. 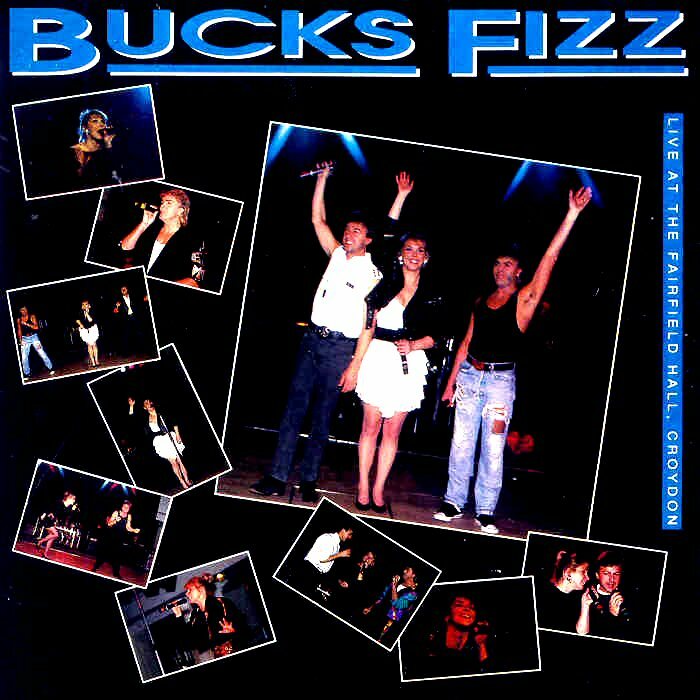 The both Bucks Fizz groups existing during the period 1999-2002 wanted to have rights to the name. 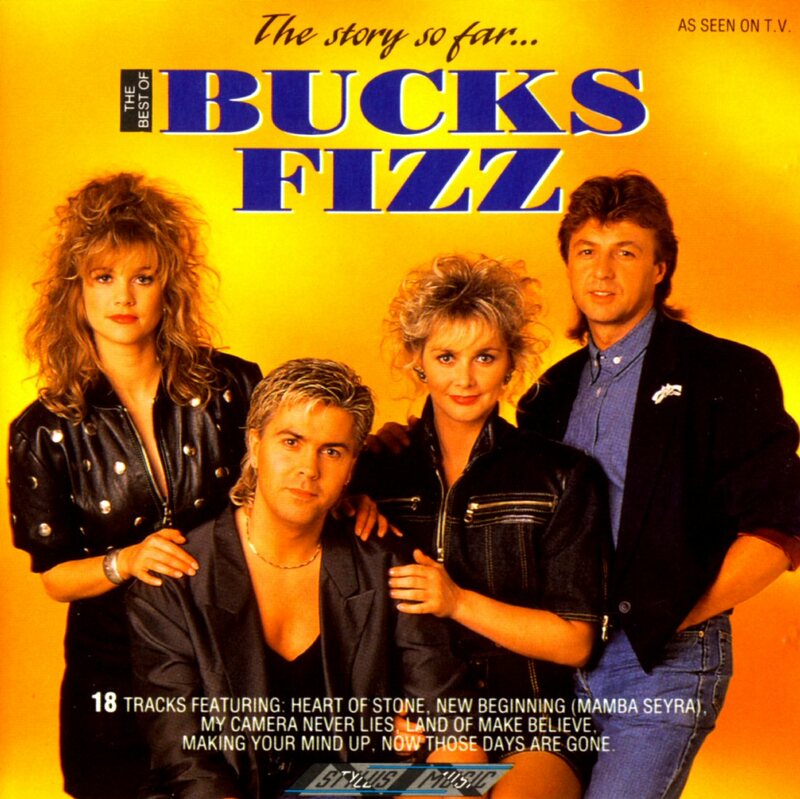 It was Bobby's Bucks Fizz that won the full right to the name after the court judge in August 2002. 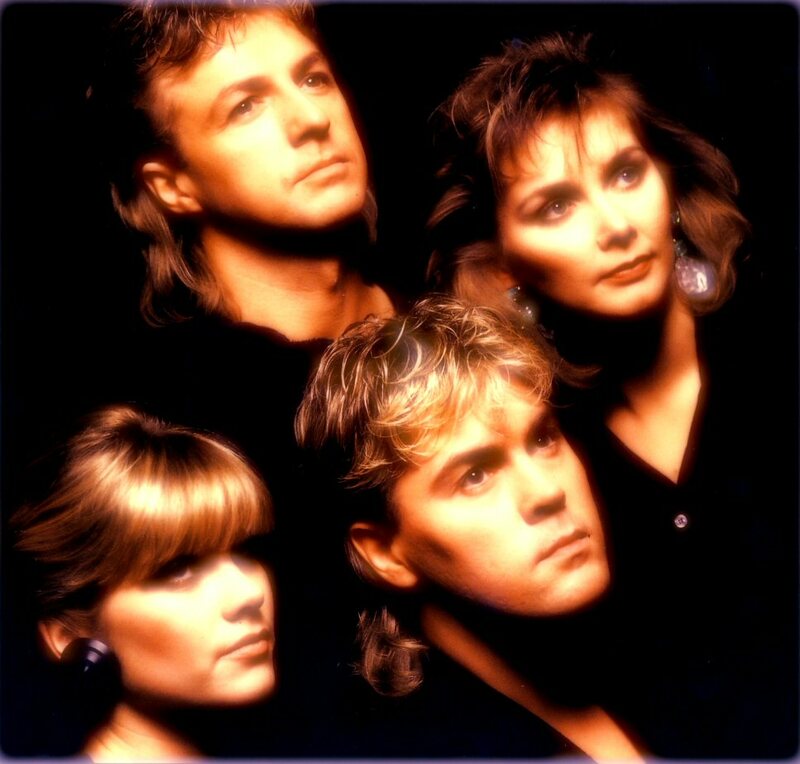 Mike left his "Bucks Fizz" group and it finally ceased later in 2002. 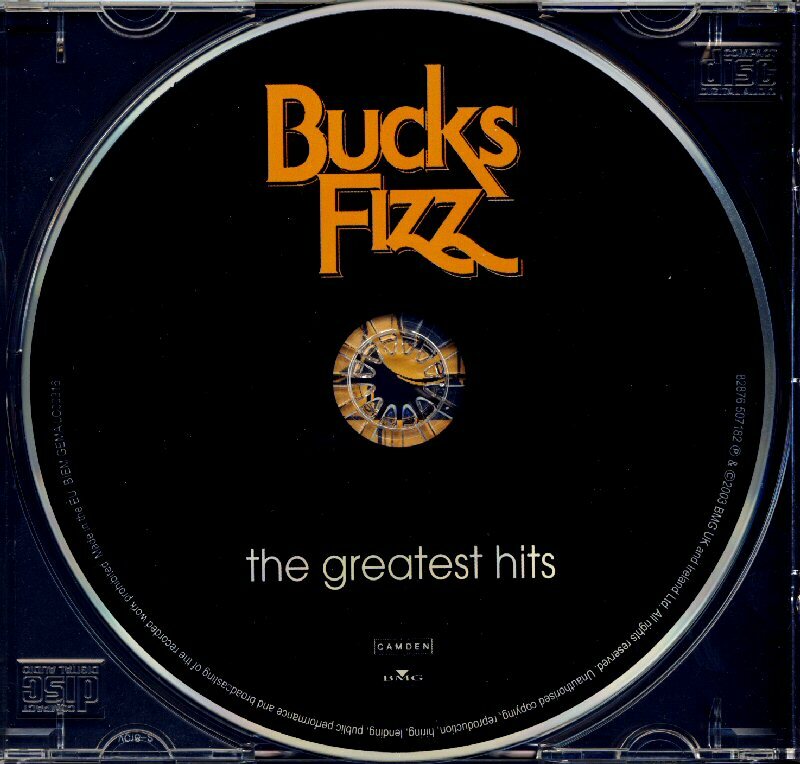 The compilation "The Greatest Hits" was released in 2003 contained all single hits released by RCA between March 1981 and September 1985. 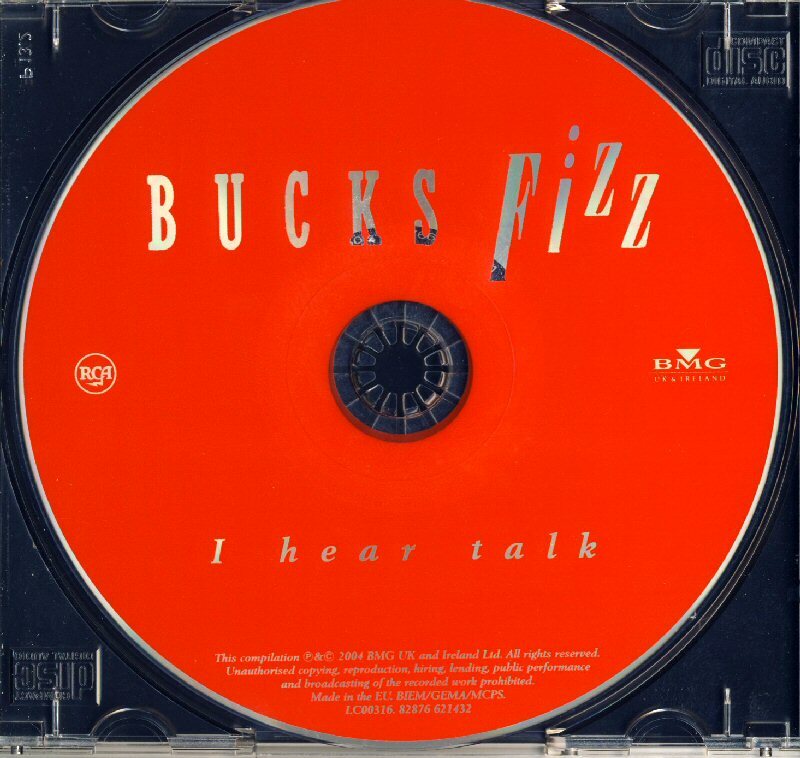 "Talking In Your Sleep" and "I Hear Talk" appeared in maxi versions. 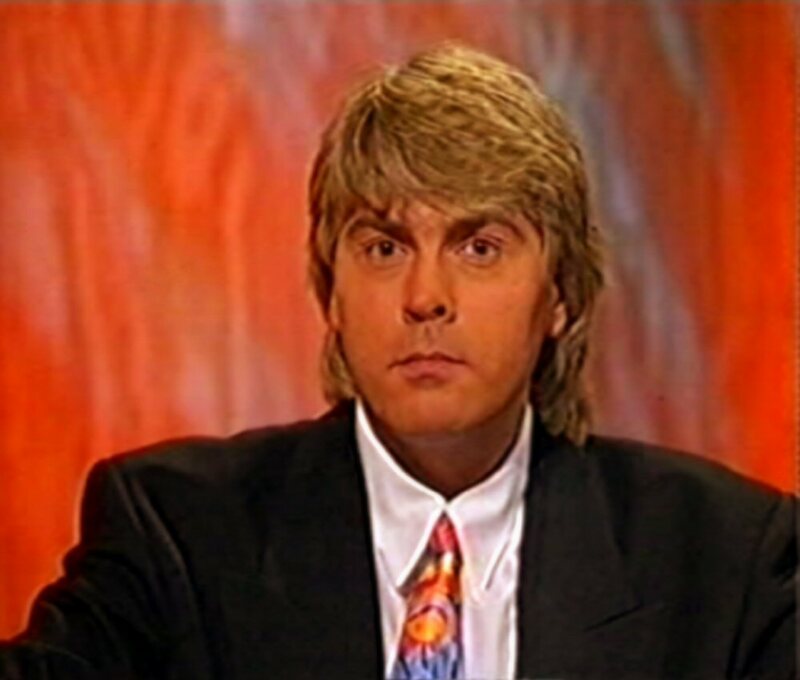 The Bucks Fizz diva Jay Aston made comeback in 2003. 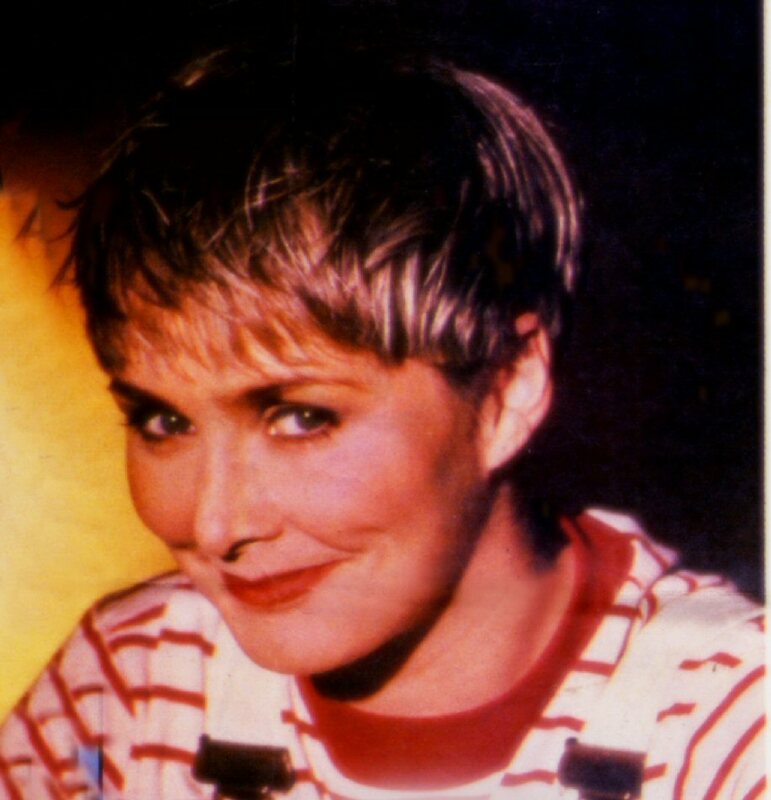 Her first solo album since she left Bucks Fizz in 1985 was entitled "Alive and well" and contained 13 tracks which had been mostly written by Jay herself. 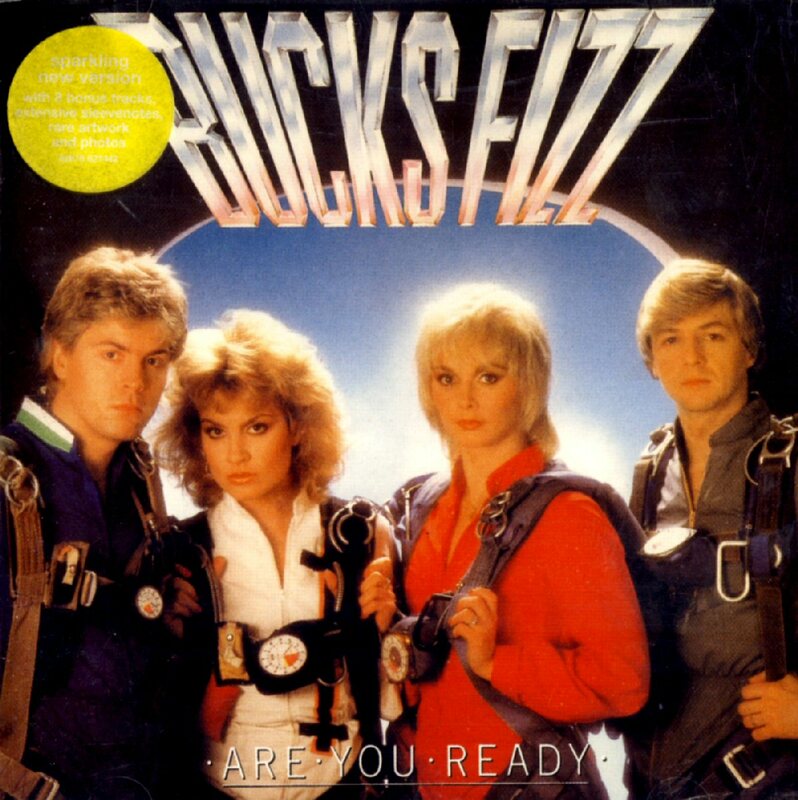 The album's sound was quite different to the Fizz style from the beginning of 1980s and it featured both rocky songs and some beautiful ballads as "Stay with me" and "Waiting for the Day". 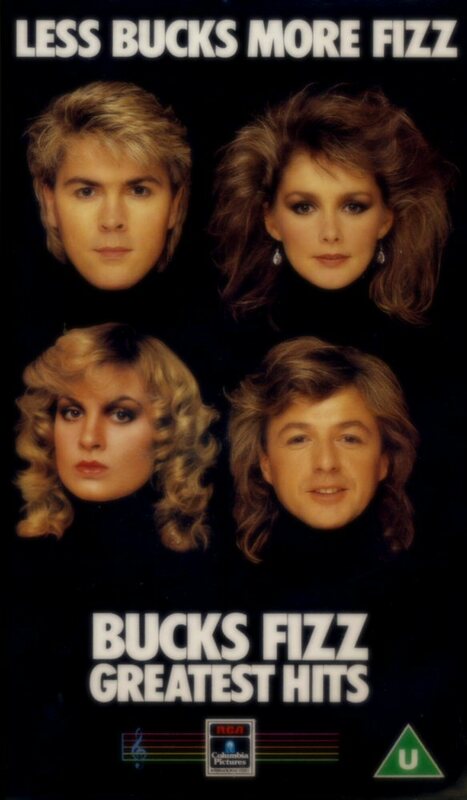 The album was a big surprise for all Bucks Fizz fans. 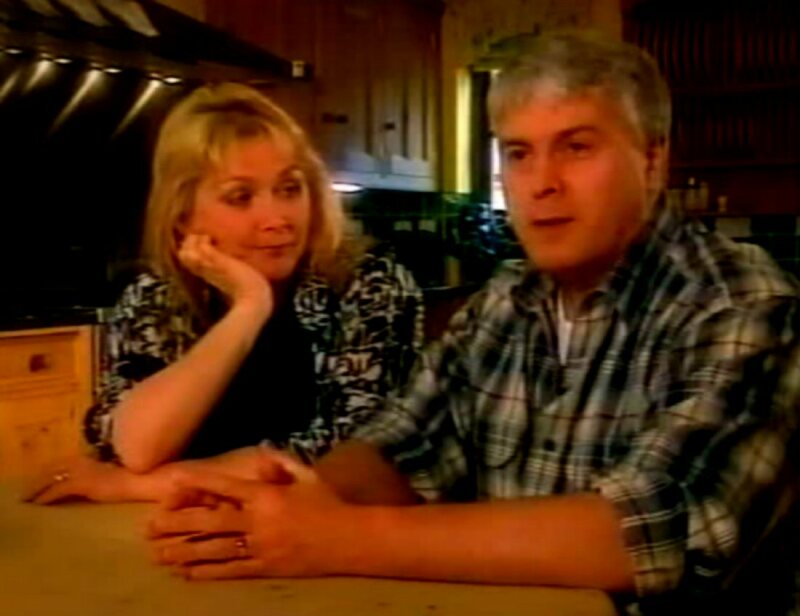 Cheryl Baker was featured in the UK celebrity magazine "Now" talking about her healthy diet in March 2004. 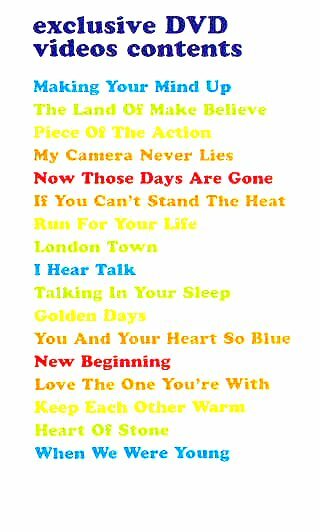 The first 4 albums recorded by the group between 1981 and 1984 were released on CD on 21 June 2004 in Great Britain. 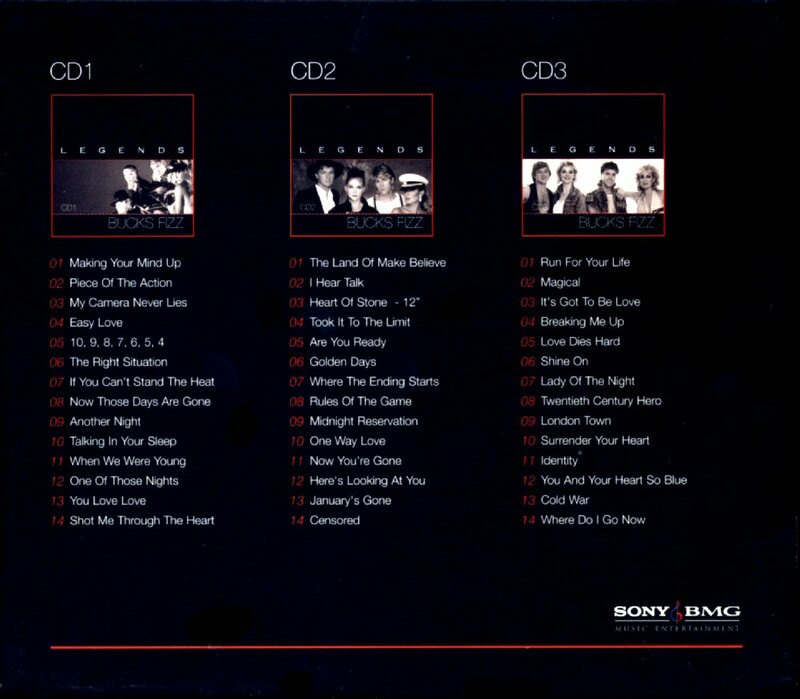 Each disc contained bonus tracks, previously unreleased songs and alternative mixes of well-known hits. 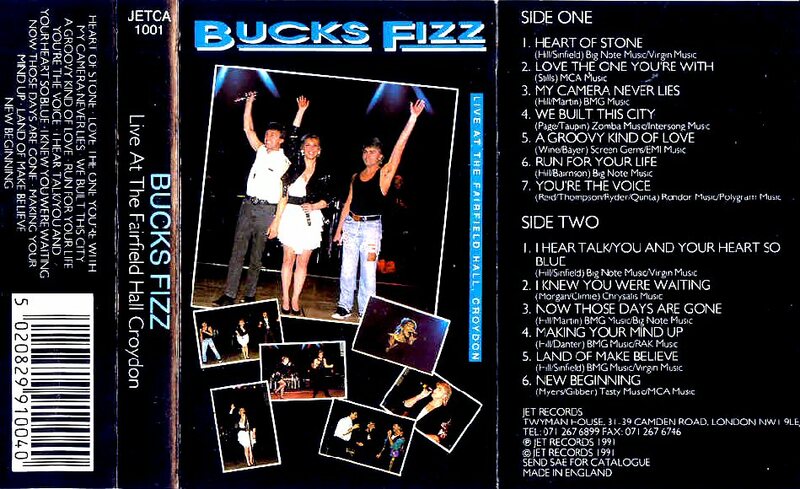 Bucks Fizz had recorded a lot of songs which only appeared on B-sides of their singles and maxi singles in 1980s. 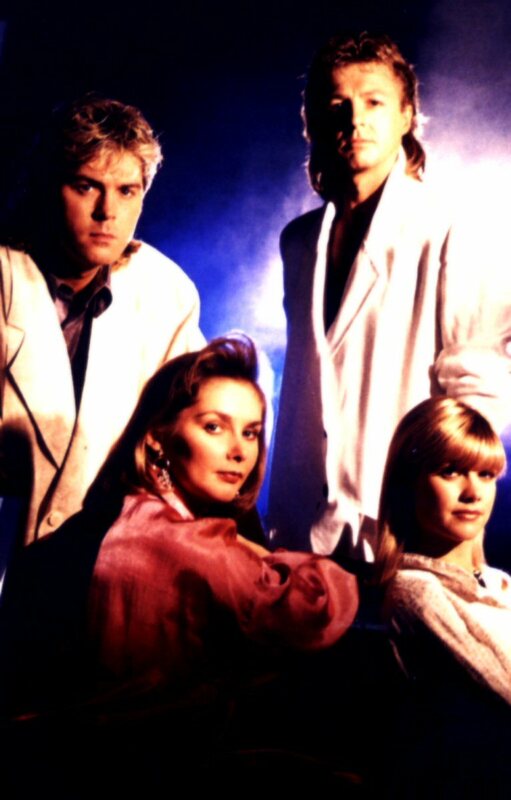 The group released a Spanish album in late 1982 but this album remainedl unavailable and only some songs were added as bonus tracks on the CD containing the first album "Bucks Fizz" from 1981. 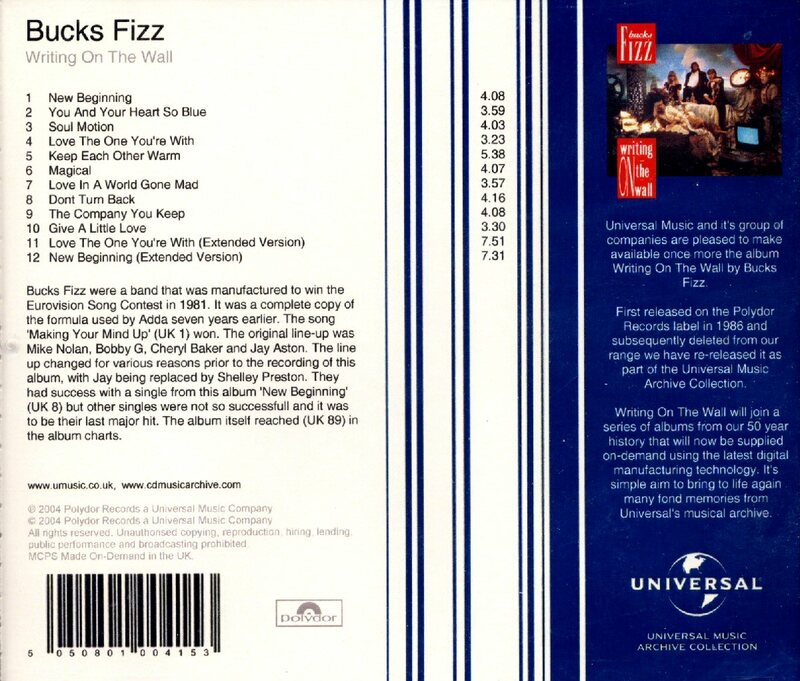 The year 2004 saw two CD re-releases of the 1986 album "Writing On The Wall". 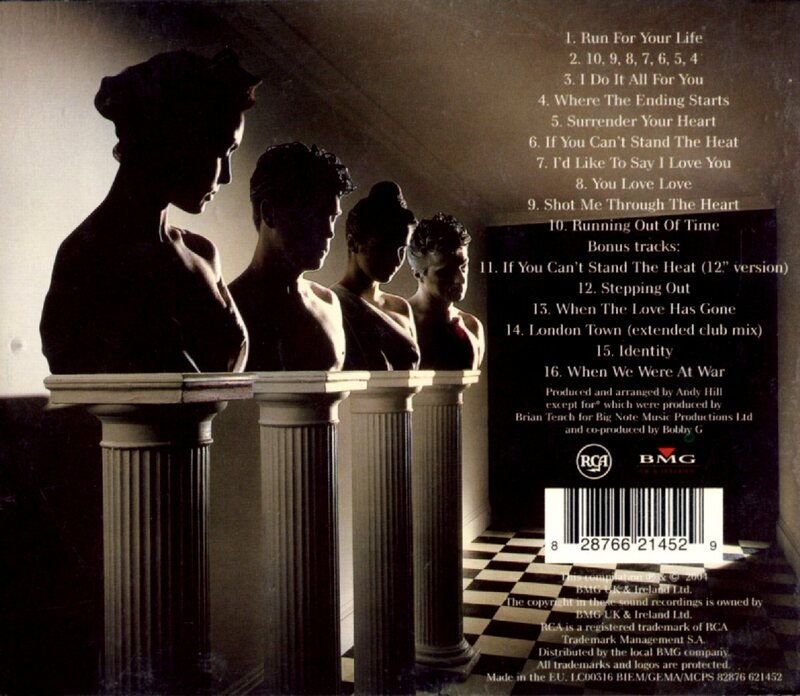 The first re-release came out in the series "Universal Music Archive Collection" and featured the same track listing as the original album - totally 12 tracks. 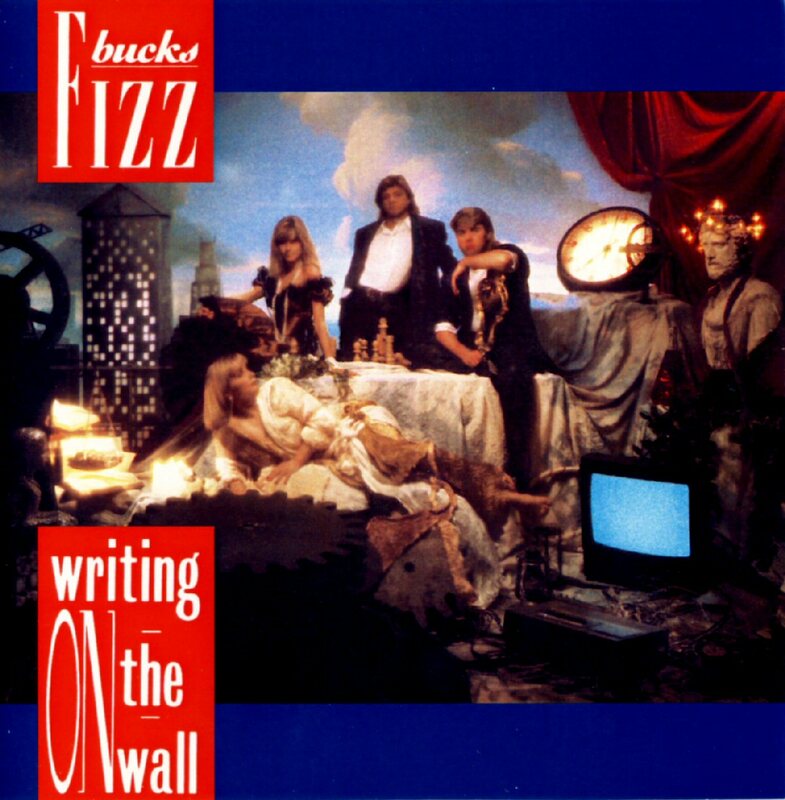 The alternative re-release of "Writing On The Wall" came out on CD on November 15th, 2004. 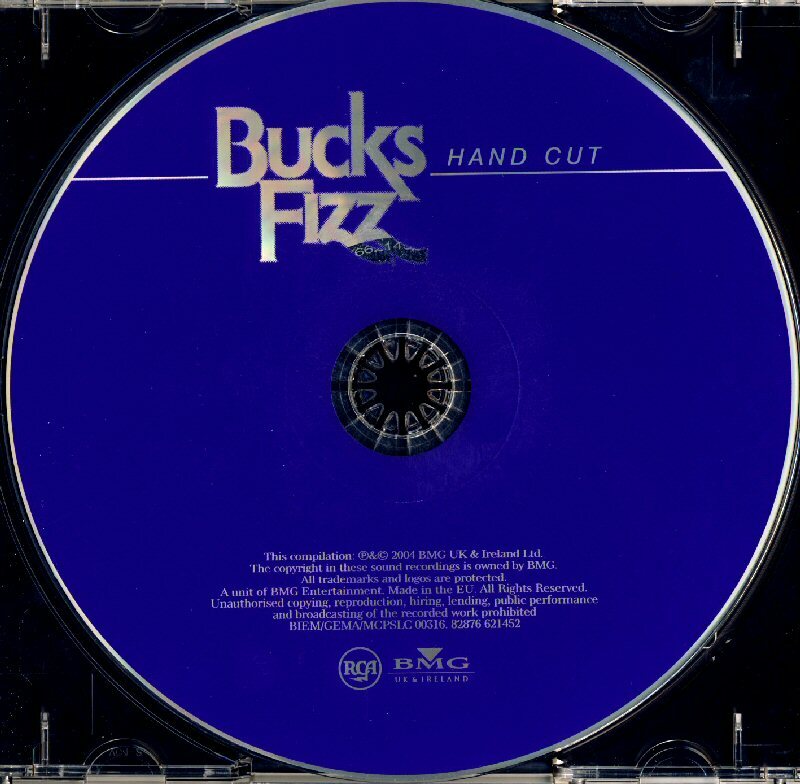 This CD edition was quite different to the original LP version. 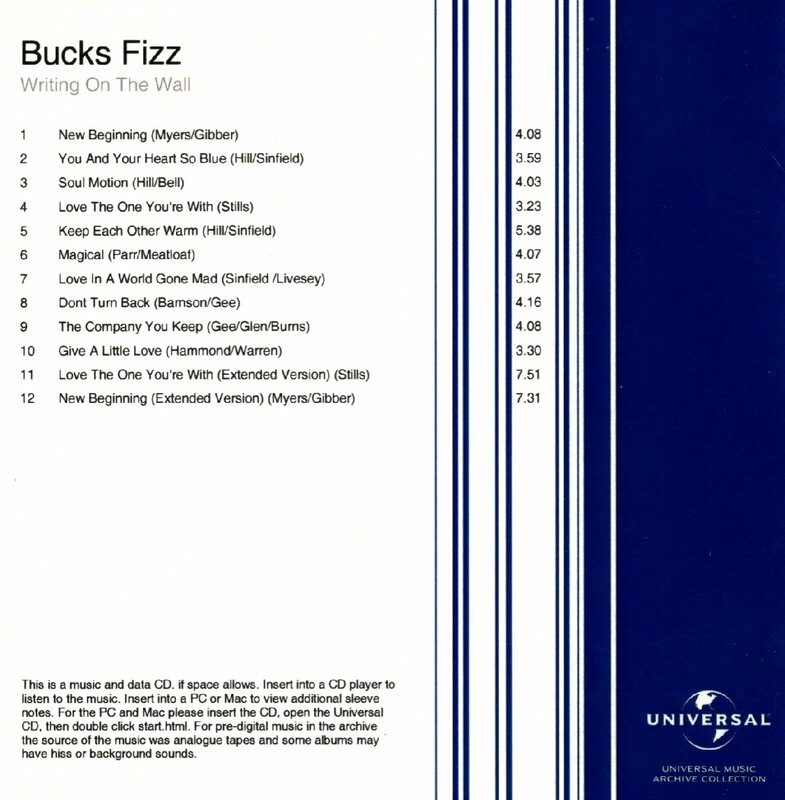 Due to the license problems two songs: "You And Your Heart So Blue" and "Magical" which originally had been released on "Writing on the Wall" did not appear on this CD. 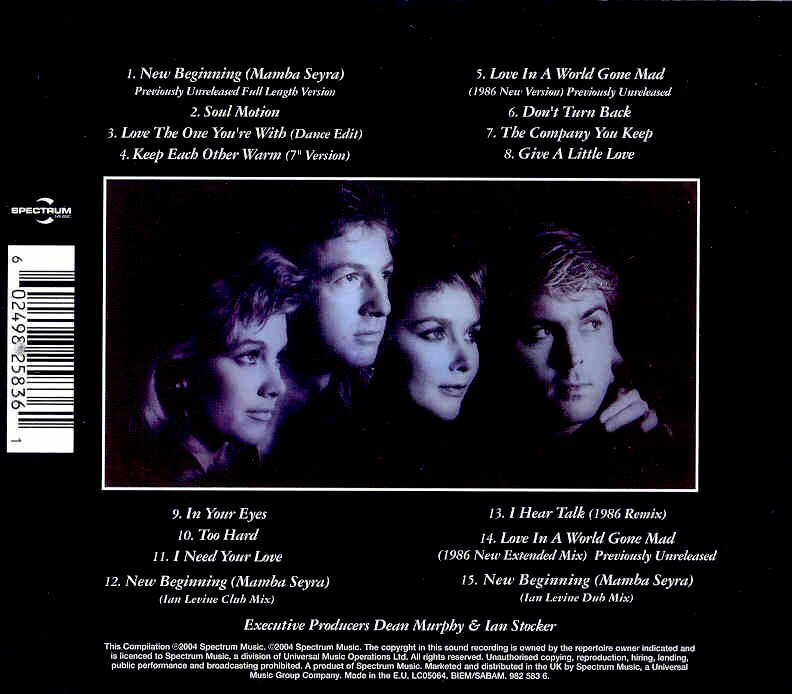 Instead there were 3 different mixes of "New Beginning", a dance edit of "Love the one you're with" and two previously unreleased versions of "Love in the World gone Mad" on this CD issue. 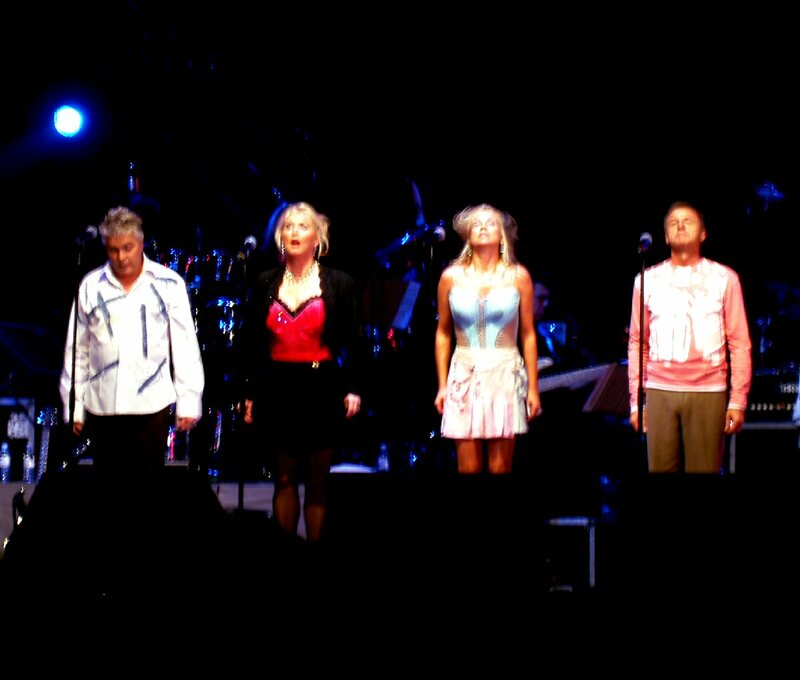 Bucks Fizz reunited for the "Here and now" tour in the UK at the end of 2004. They performed as the third act on Wembley on Thursday 16 December. 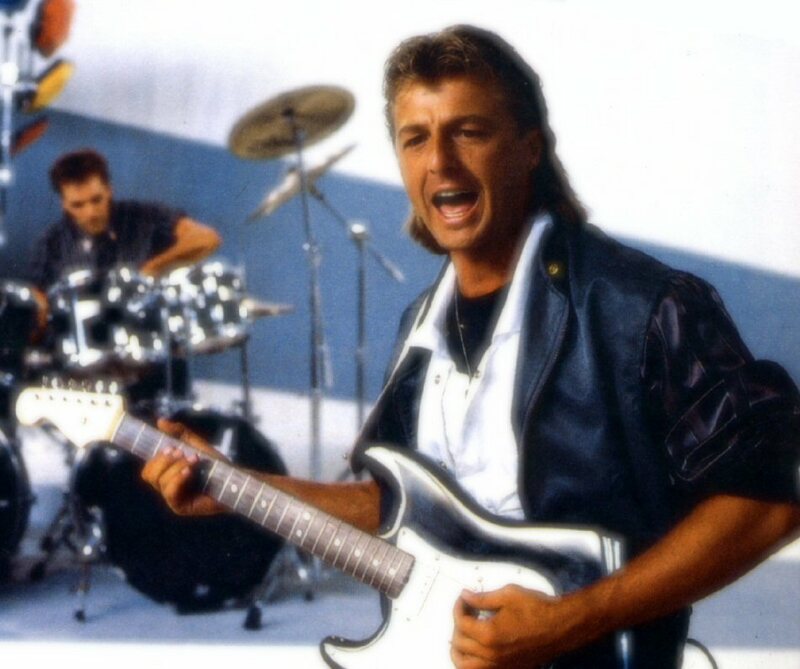 Their performance confirmed their status as one of the biggest pop groups in 1980s in Europe and one of the most underestimate groups in the pop history. 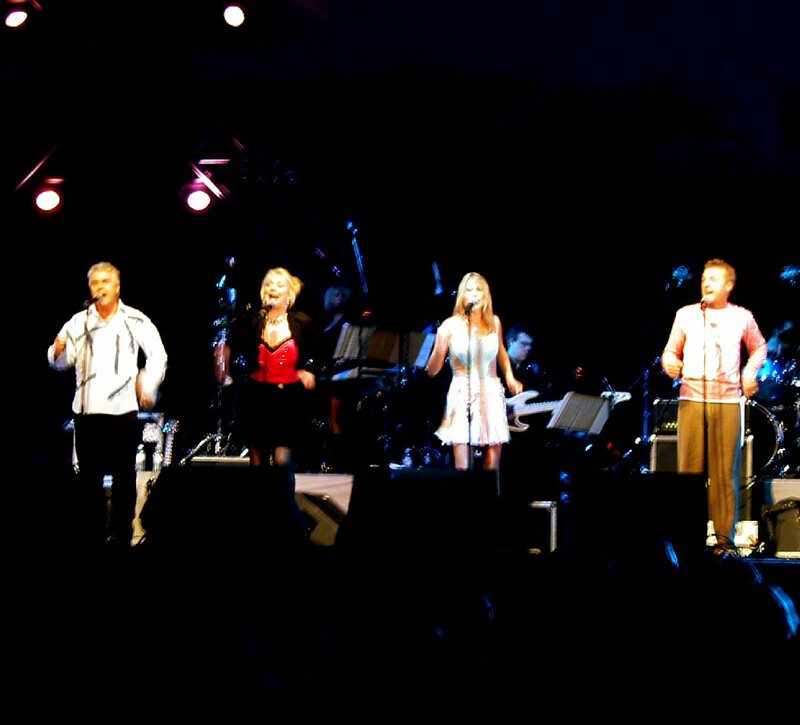 They started with "New Beginning" at 7.55 p.m. and continued with all great hits until 8.30 p.m. 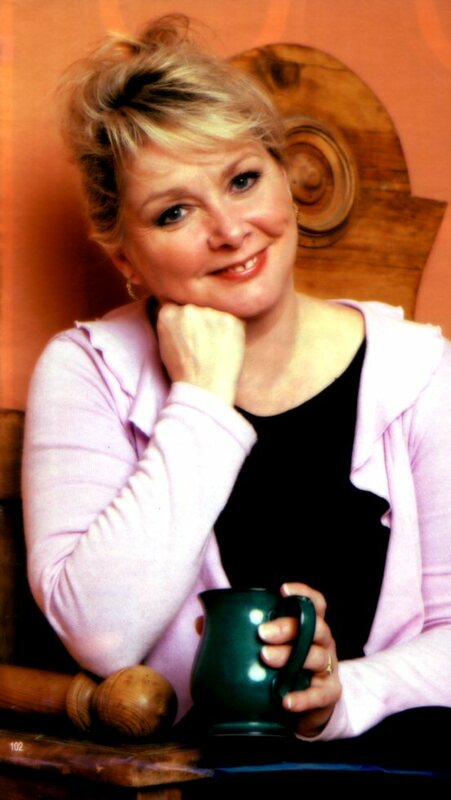 The "queen" Cheryl Baker was in great form joking and having fun on stage. 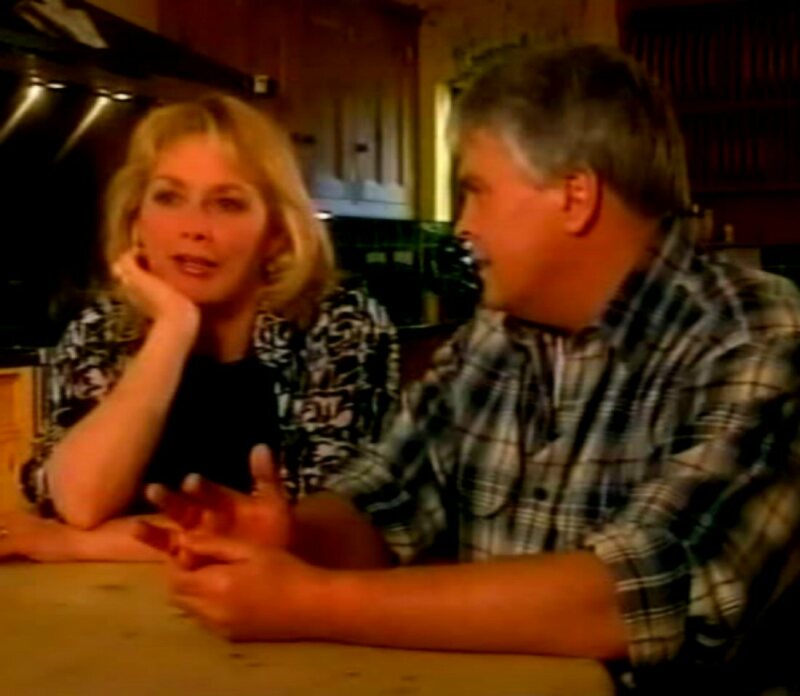 Shelley Preston was singing and dancing as well as Mike who had become a little bit "rounder" but still has his old sense of humor and beautiful voice. 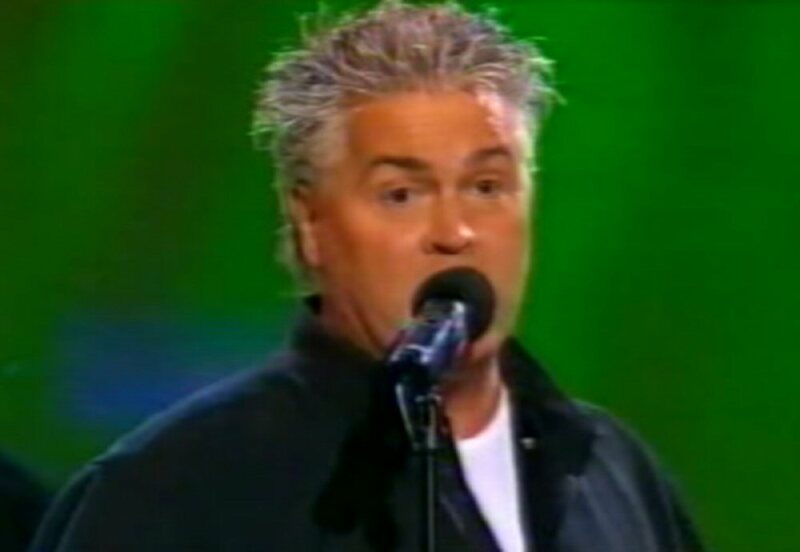 Bobby was as usual a great singer even this evening. 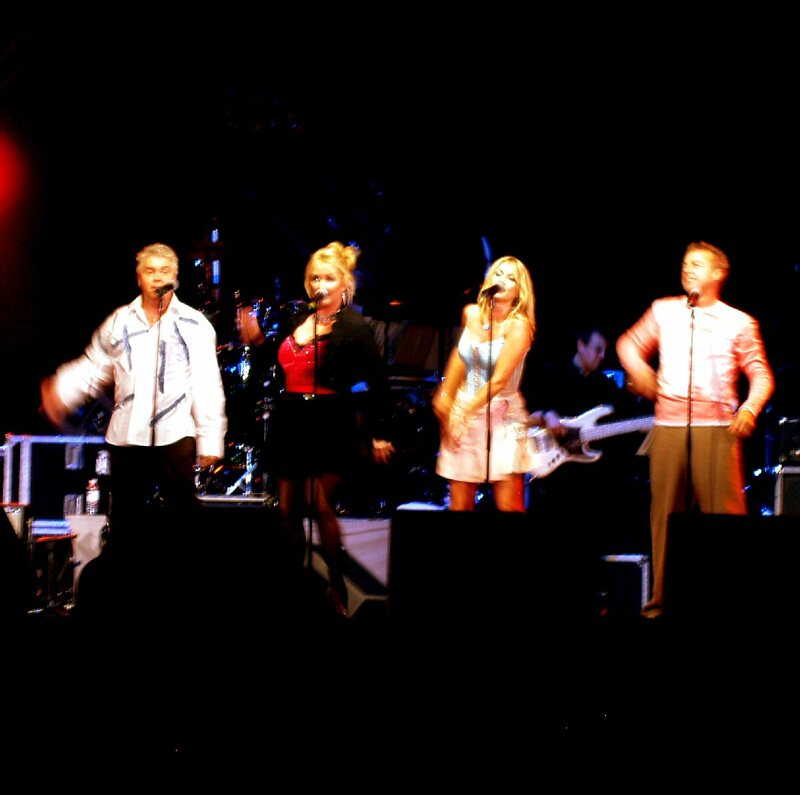 Cheryl, Shelley and Bobby started collaborations as "the former Bucks Fizz members" with several shows in the UK at the beginning of 2005. 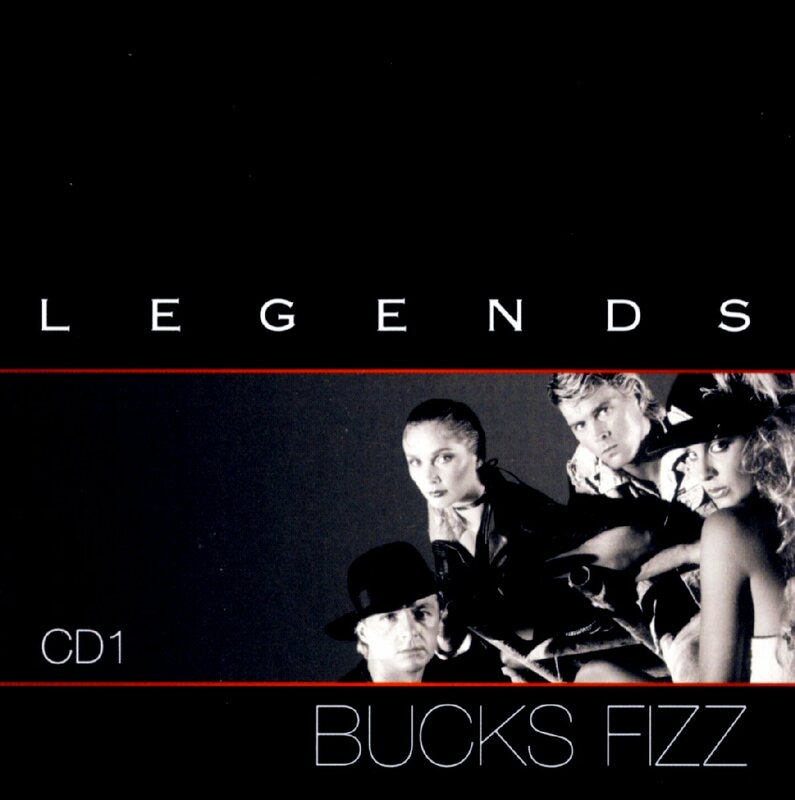 The box "Legends" was released in Great Britain on February 7th, 2005 and it featured 3 CDs with 14 songs on each of them. 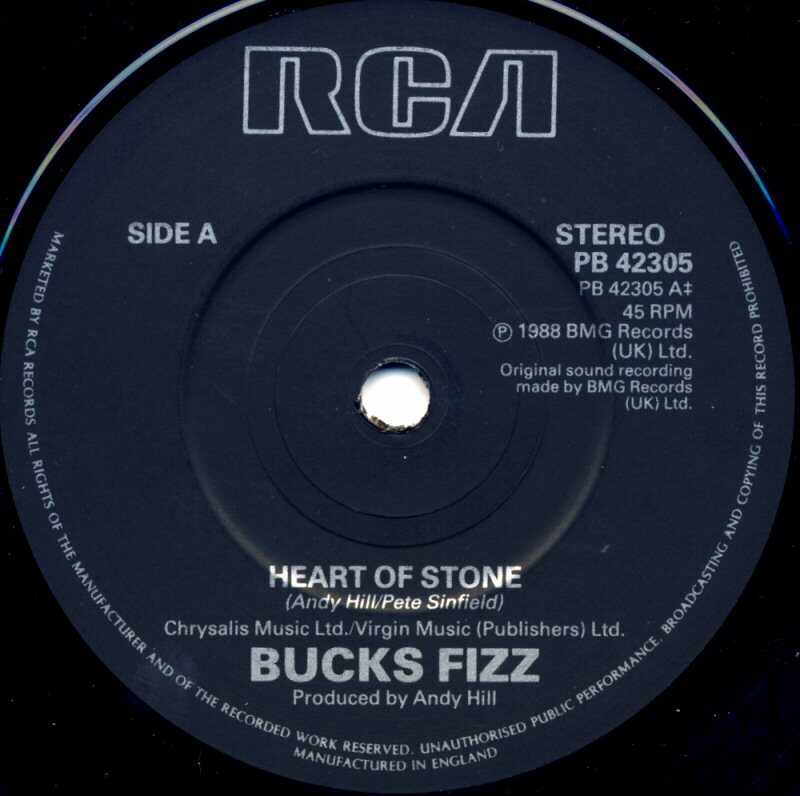 Among the songs there were some rarities as a 12" version of Heart of Stone or rare B-side "Censored". 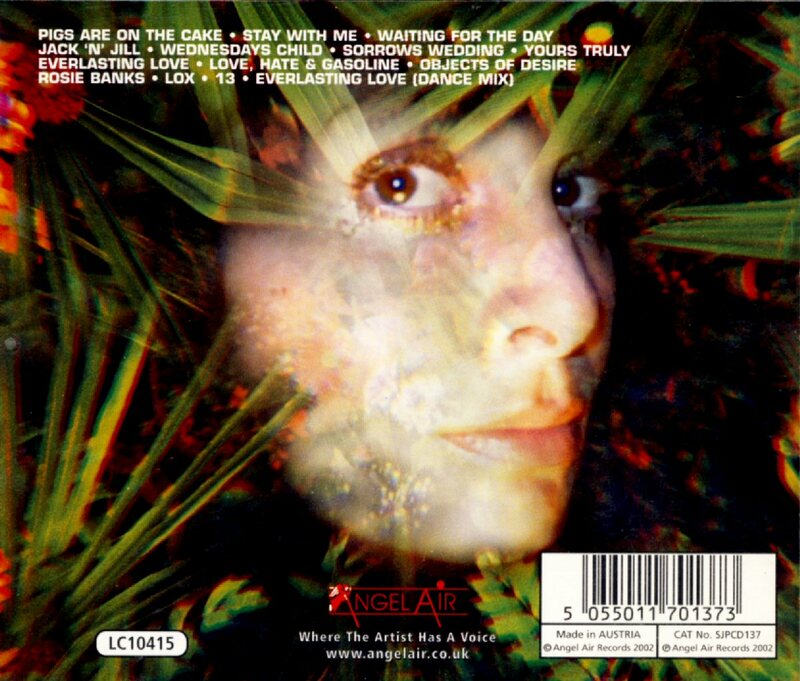 "The Ultimate Anthology" was released on July 16th, 2005 in Great Britain. 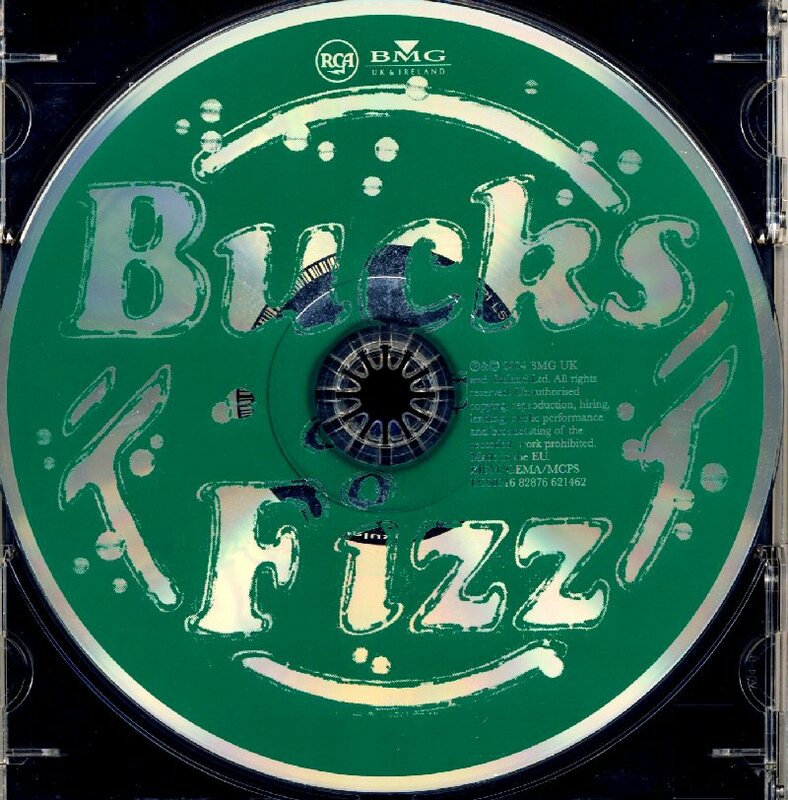 This double CD contains all 20 Bucks Fizz singles on CD 1 (most of them are alternative mixes) and rarities on CD 2 including some previously unreleased tracks. 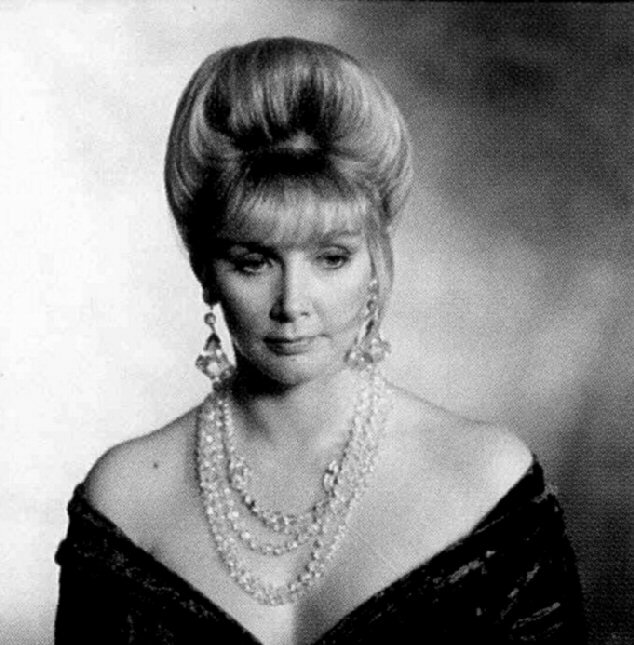 Even two Cheryl Baker solo tracks have been added on the second CD. 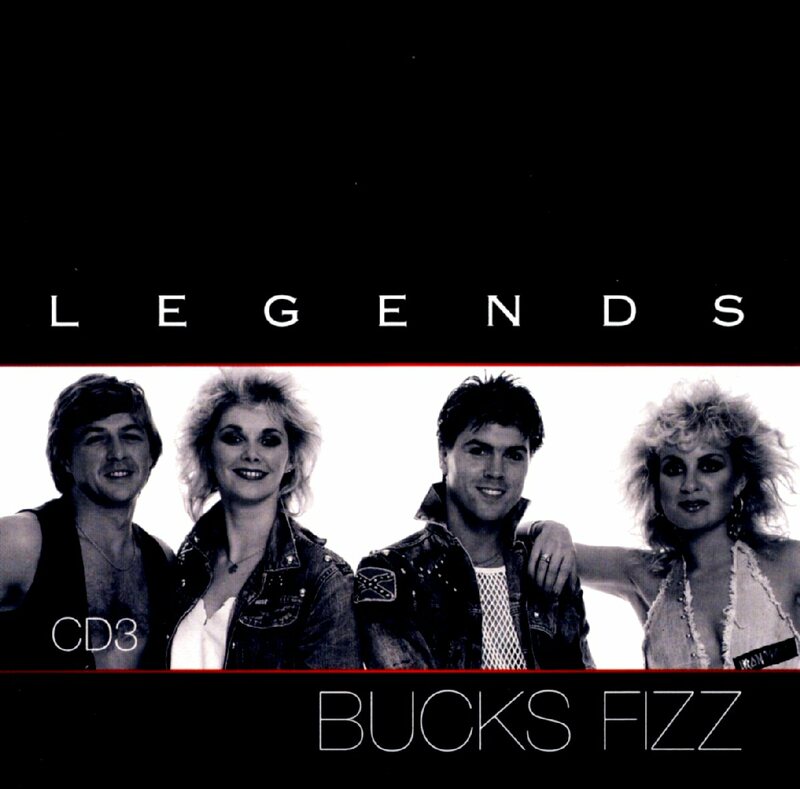 For the very first time a Bucks Fizz compilation CD featured five members on the front cover. 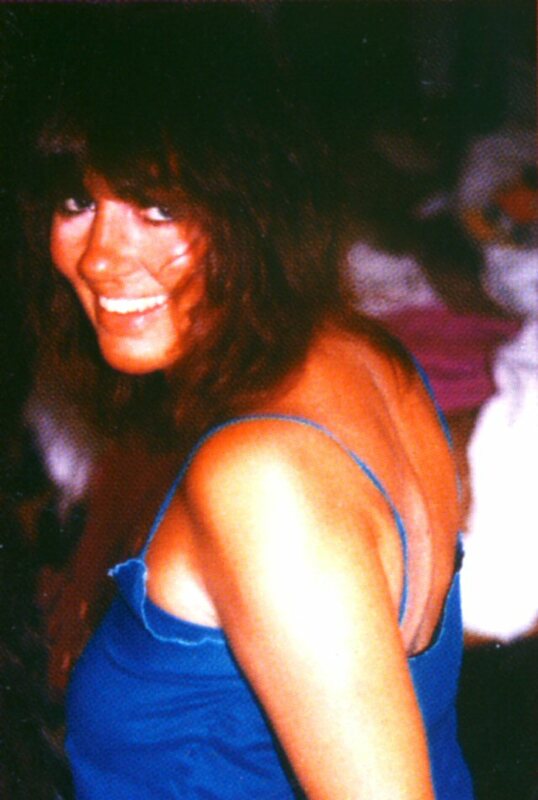 Several rare pictures can be found in the booklet (see below). 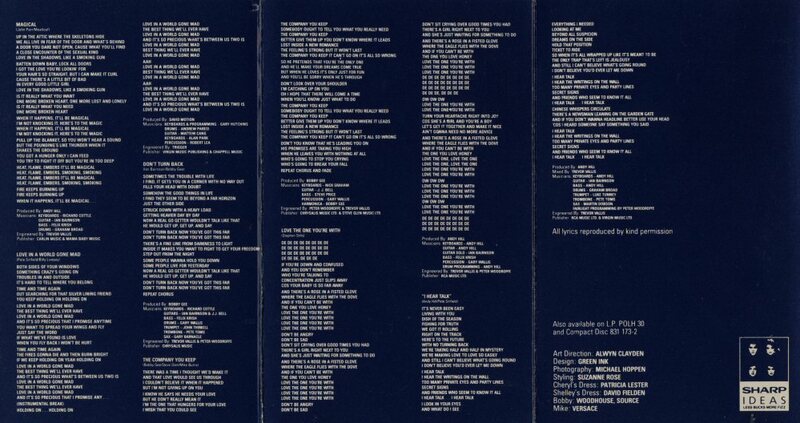 Covers of all SPs, LPs and CDs ever released by the group can be seen in the middle of the booklet. 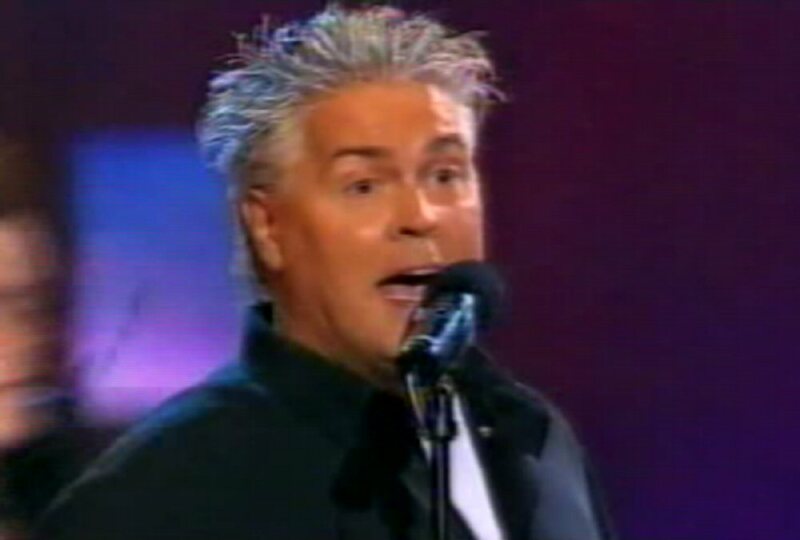 On October 22nd, 2005 the three former members of the group performed "Making Your Mind Up" on the gala show in Copenhagen in connection to the 50th anniversary of Eurovision Song Contest. Cheryl and Mike gave a short interview for the German TV channel "WDR". 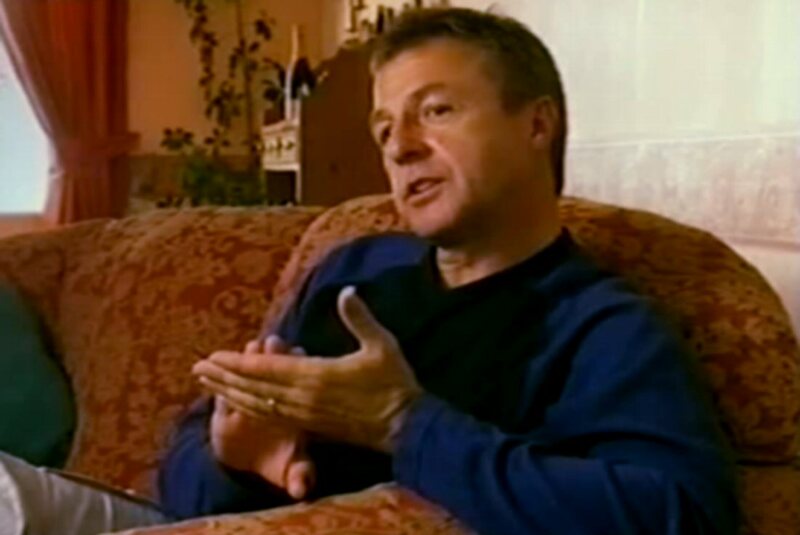 The interview was recorded in London. 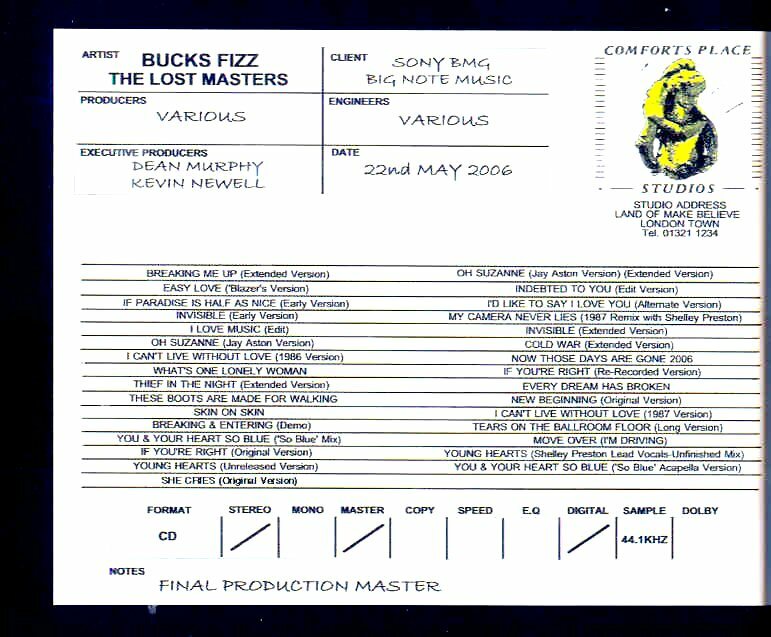 The 2 CDs - The Lost Remasters - contained over 30 previously unreleased songs - a mix of completely unknown compositions and alternate mixes of known hits. 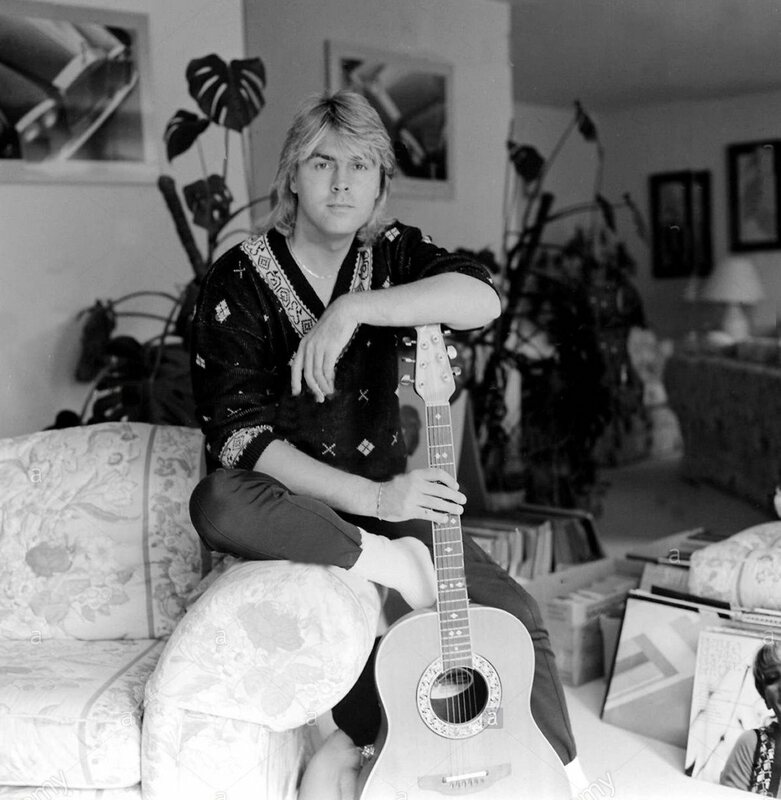 Andy Hill found a lot of interesting stuff in his studio Comforts Place. 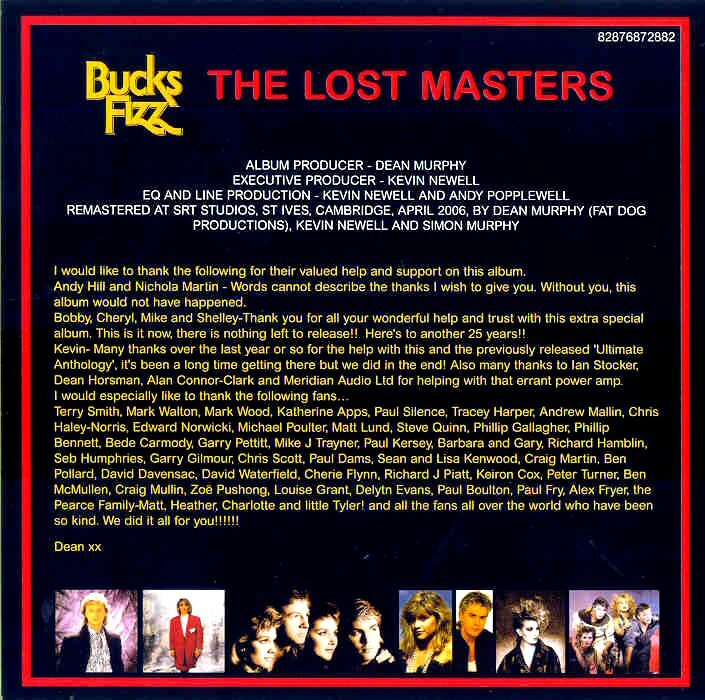 Some of the songs planned for this compilation had never been finished when the group was active in the 1980s. 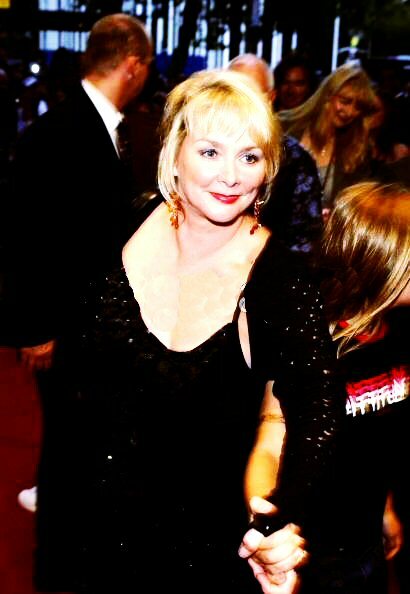 The former members Cheryl Baker and Shelley Preston were in the studio so late as in November 2005 and recorded new vocals for several songs. 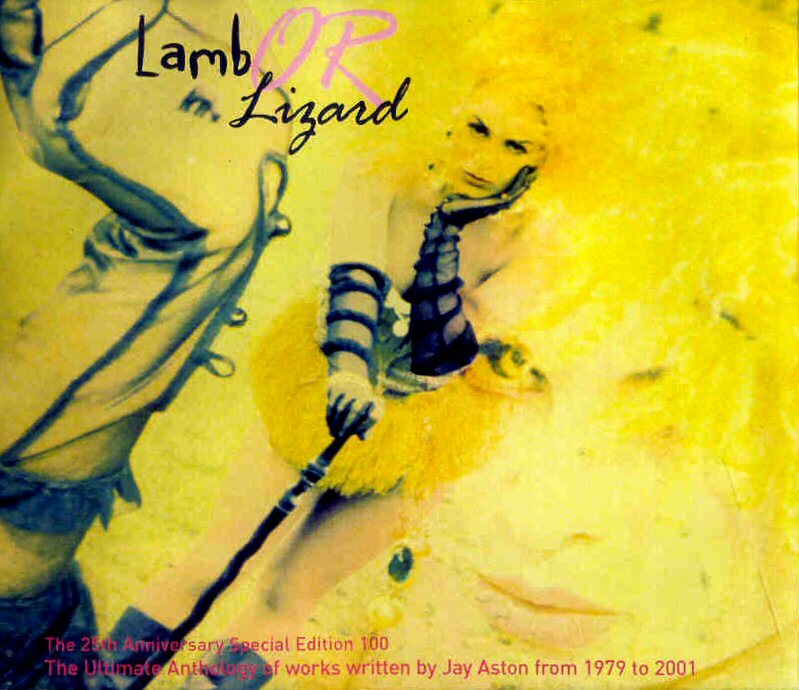 In 2006 Jay Aston released a box entitled "Lamb or Lizard" with 3 CD containing her songs composed between 1979 and 2001. 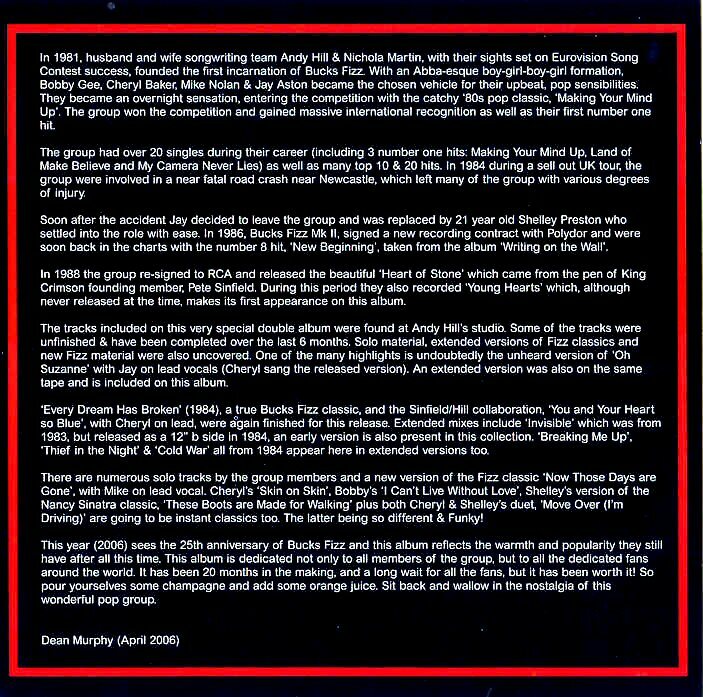 In the booklet Jay is telling small stories about every song. 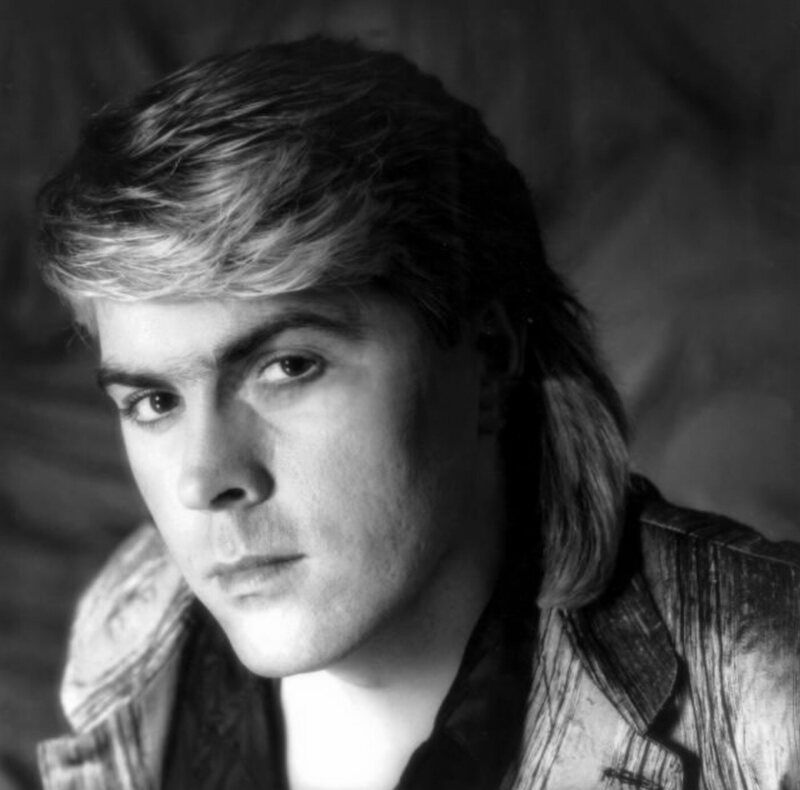 Two first songs were composed and recorded in 1979. 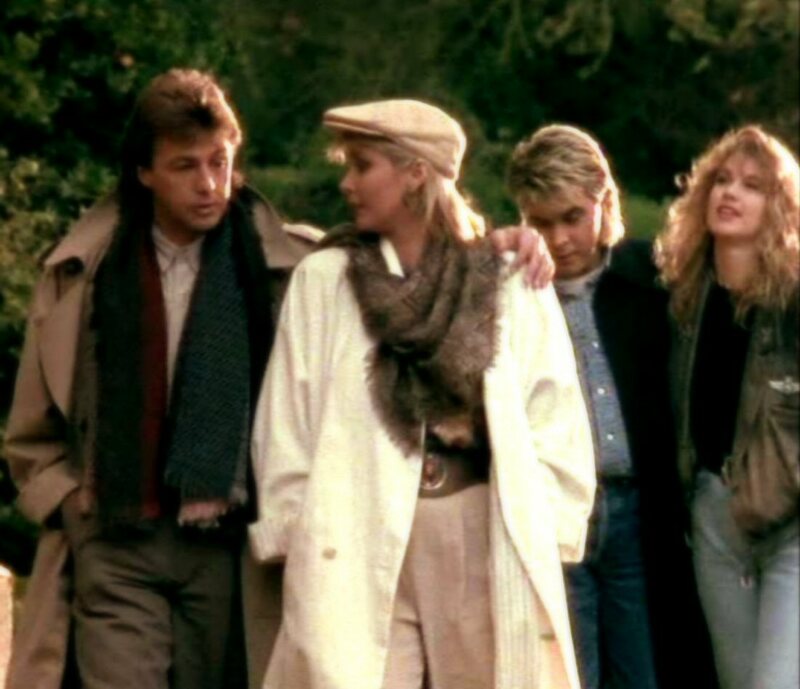 One of them "There's No Other Place" was used by Aston on her audition for Bucks Fizz! 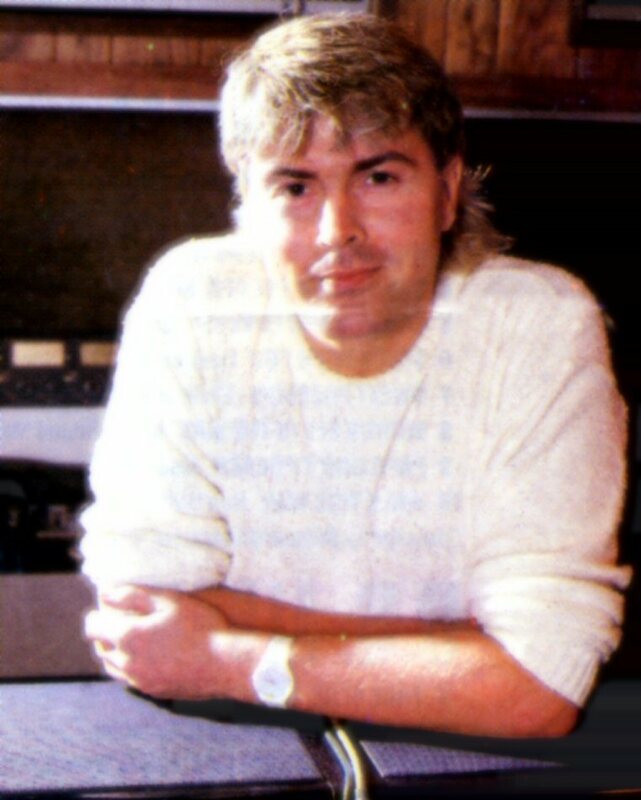 The beautiful ballad "Lovin You" was recorded in 1985 shortly after Jay left the group. Totally there are 46 songs included on this release. 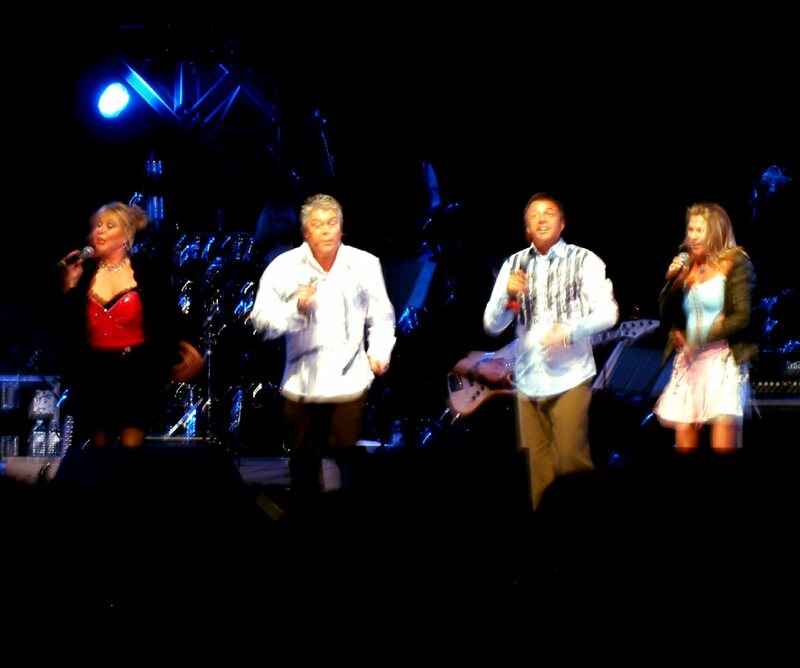 All 5 members of Bucks Fizz: Cheryl Baker, JAY ASTON, Shelley Preston, Bobby G and Mike Nolan got together on 24 November 2006 for a video filming together with the British comedian Peter Kay. 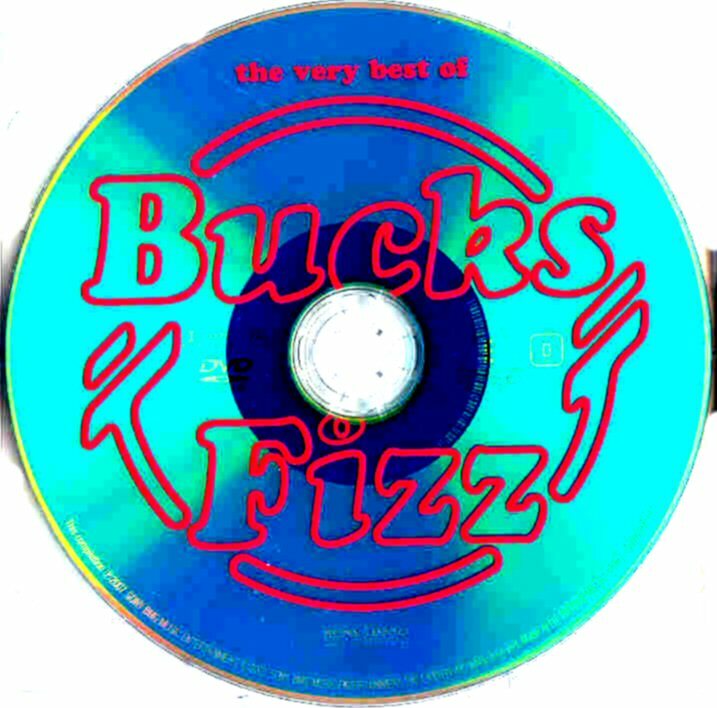 The compilation "The Very Best of Bucks Fizz" featuring CD and the first official DVD was released in Great Britain on 14 May 2007. 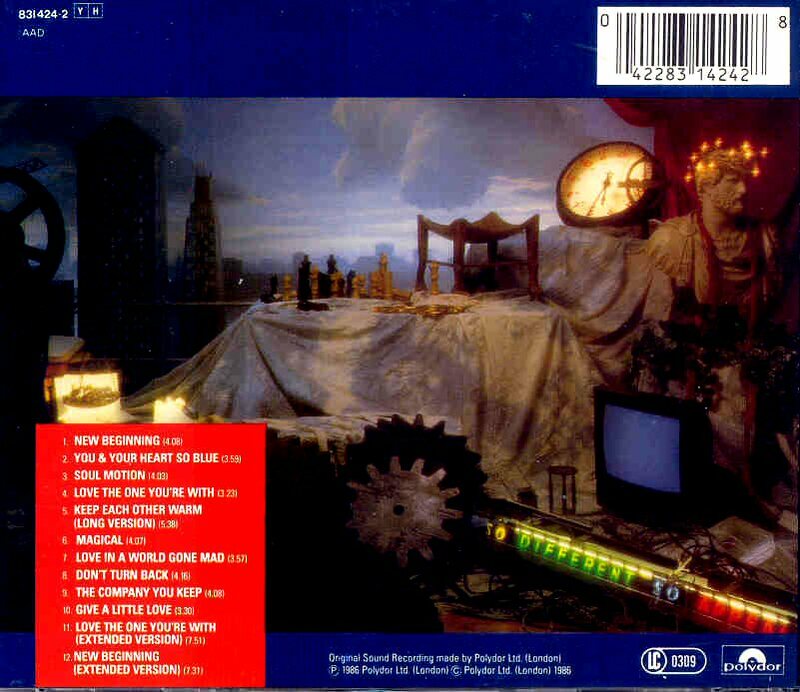 The CD contained all 18 chart hits from "Making Your Mind Up" to "Heart of Stone" and the DVD features 17 official videos for the same songs as on CD excluding "One of Those Nights" as video for this single had never been made. 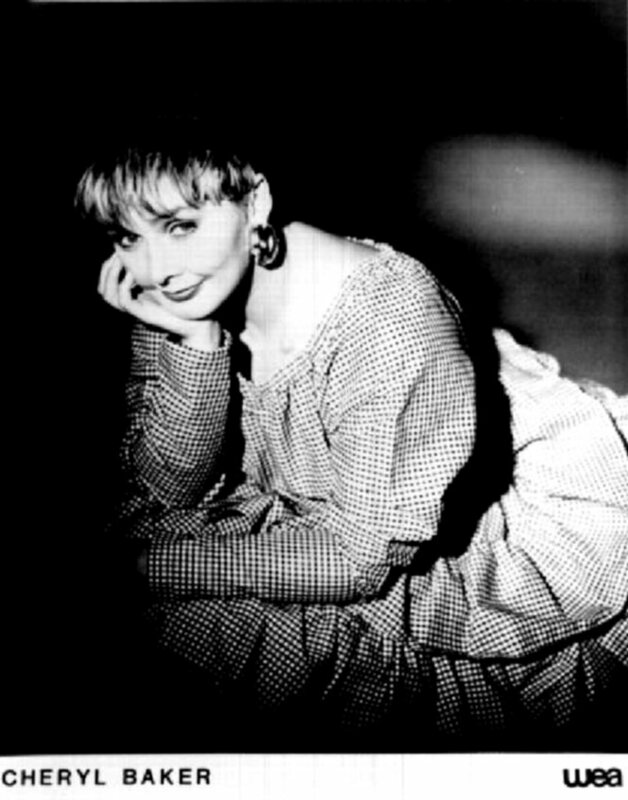 Cheryl Baker wrote short comments to each track in the booklet which with its lay-out and happy colours reminds of the very first period in the group's career. 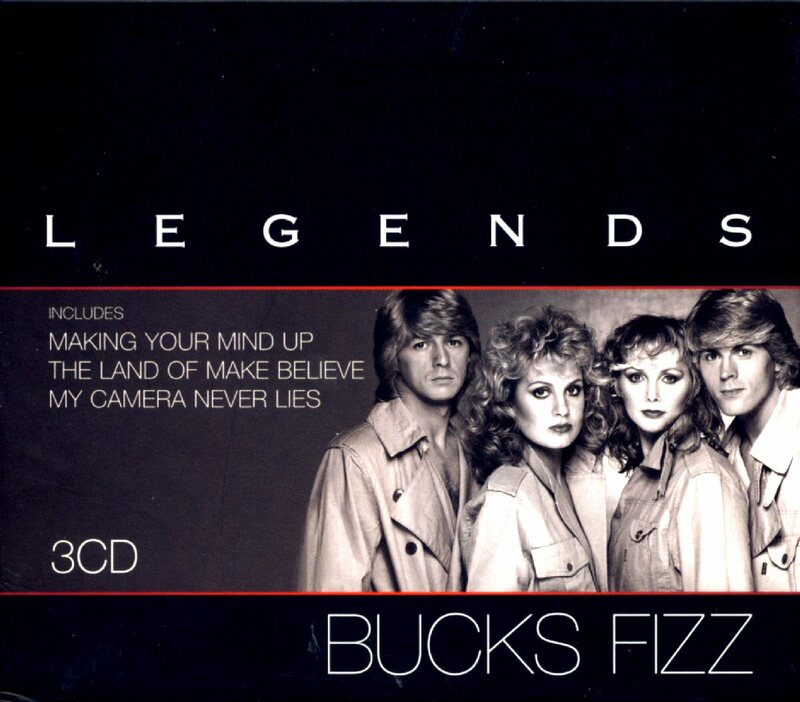 The four members featured on this compilation are Cheryl, Jay, Mike and Bobby even if Shelley appears on four videos on the DVD. Pictures of Cheryl in the British press. 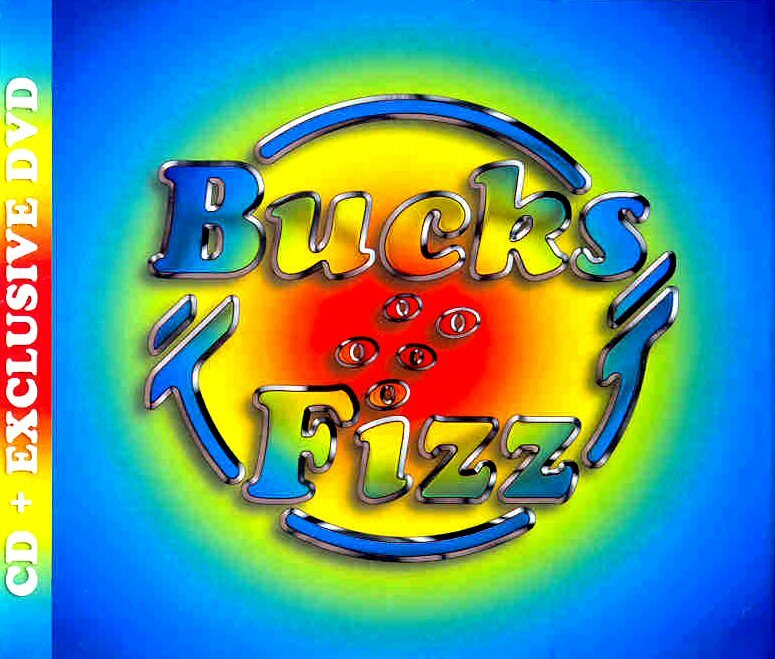 Bucks Fizz on the British chart!! 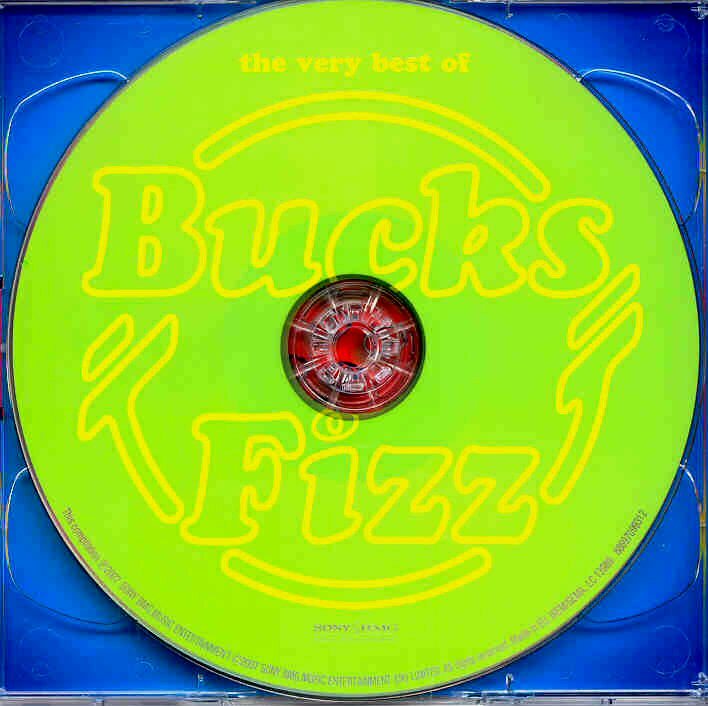 The compilation CD (with bonus DVD) "The Very Best of Bucks Fizz" entered the British album chart on #40 on 21 May 2007. 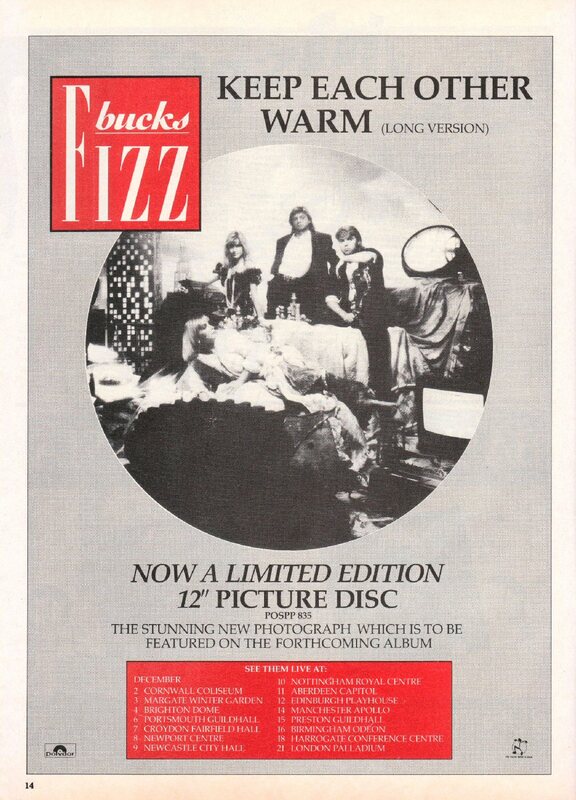 It was the best position for a Bucks Fizz album since "Greatest Hits" in 1983 which entered the British chart on 3 December 1983 and peaked at #25. 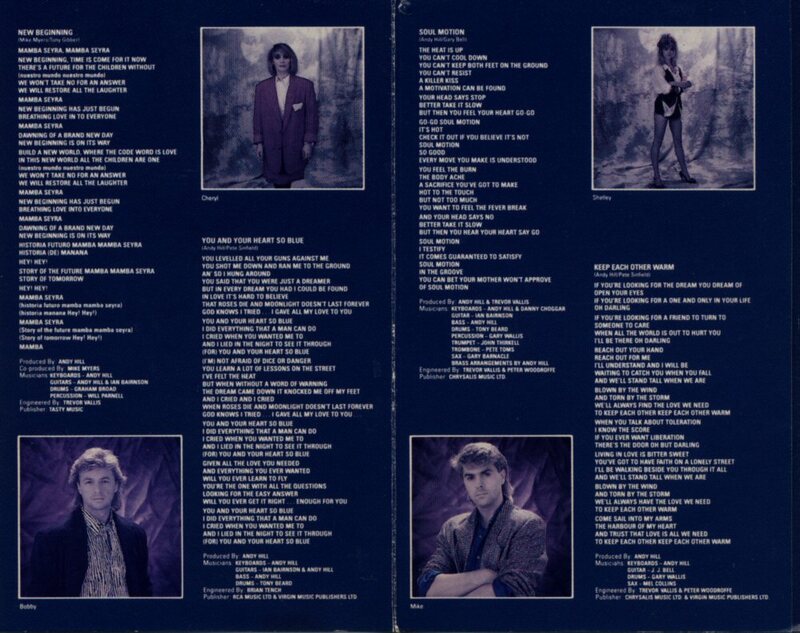 The next two studio albums "I Hear Talk" from 1984 reached only #66 in 1984 and "Writing on the Wall" in 1986 peaked on #89 on 13 December 1986. 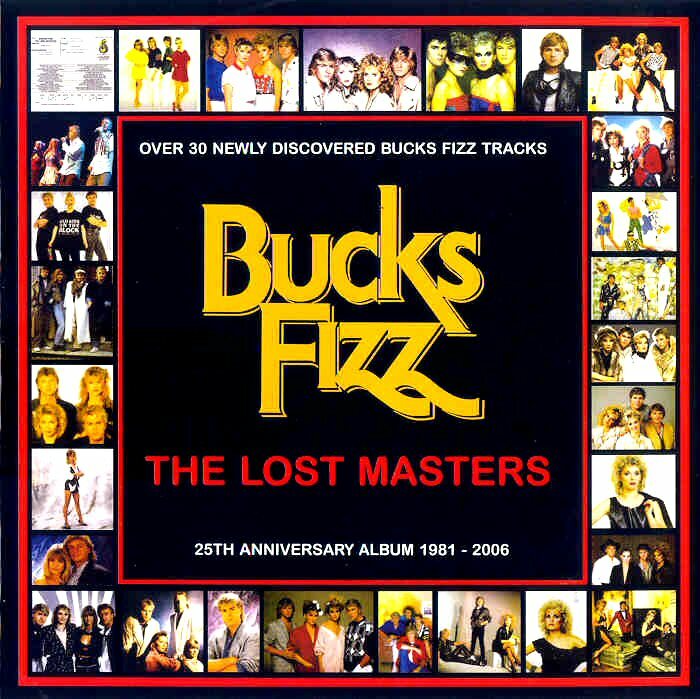 The new compilation of Bucks Fizz' greatest hits was promoted officially by three former member of the group: Cheryl Baker, Mike Nolan and Shelley Preston during whole year 2007. Even official photo sessions were taken for this purpose.